This is for trips where there was a significant off trail route. This hike was a completely unplanned hike. 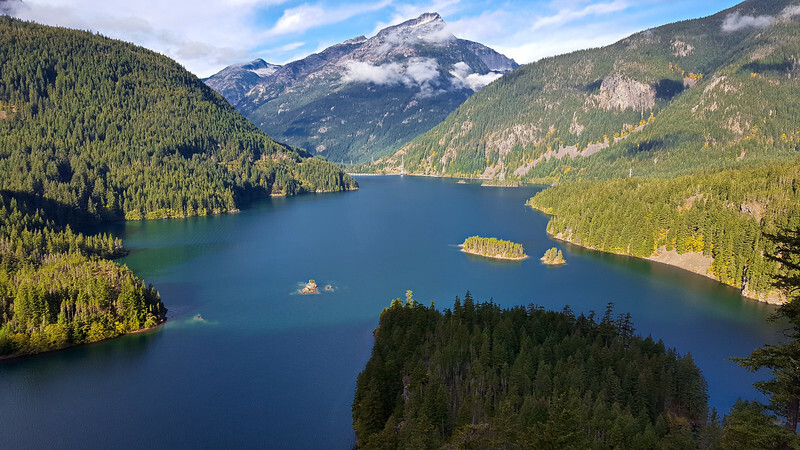 We went up to Leavenworth to spend a few days with Carly, and we had originally planned to visit the Gran Coulee dam, however we did so much driving the day before, no one wanted to drive another two hours each way to see the dam. 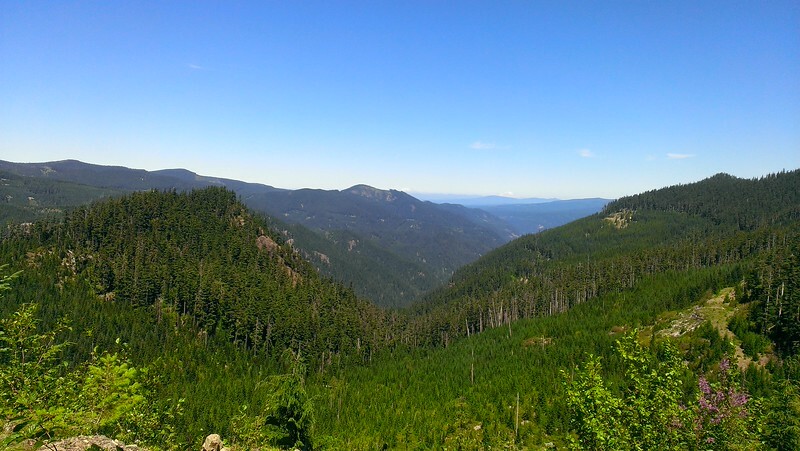 So, Carly and I took this short hike while Abby and Gail went shopping in Leavenworth. After we got back I did a little googling and found out they are white pasqueflowers that have gone to seed. I can certainly see why they could be nicknamed Dr Seuss flowers though! 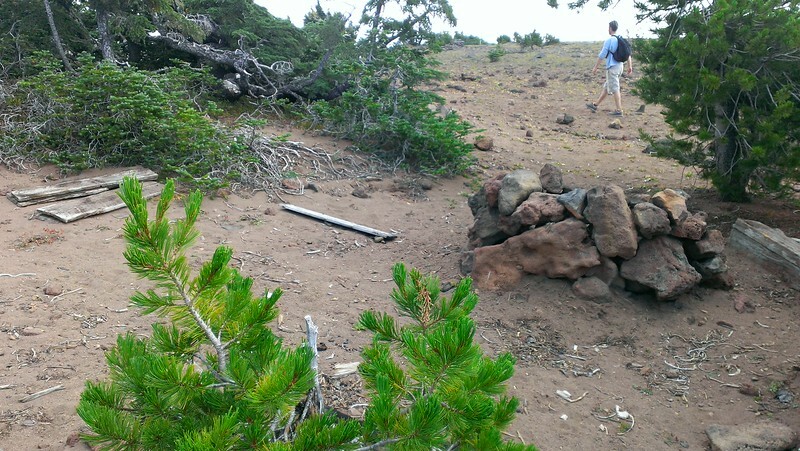 We then headed back down the trail – the hiking pole came in really handy on the steep downhill, but that steep downhill is tough on the knees. In places I think it was easier to go uphill than it was to go downhill! We made good time on the trip down and shortly got back to Carly’s car. We headed back into Leavenworth where Carly treated me to a bratwurst and a beer at a good sausage place in Leavenworth. A very nice end to a nice surprise hike! 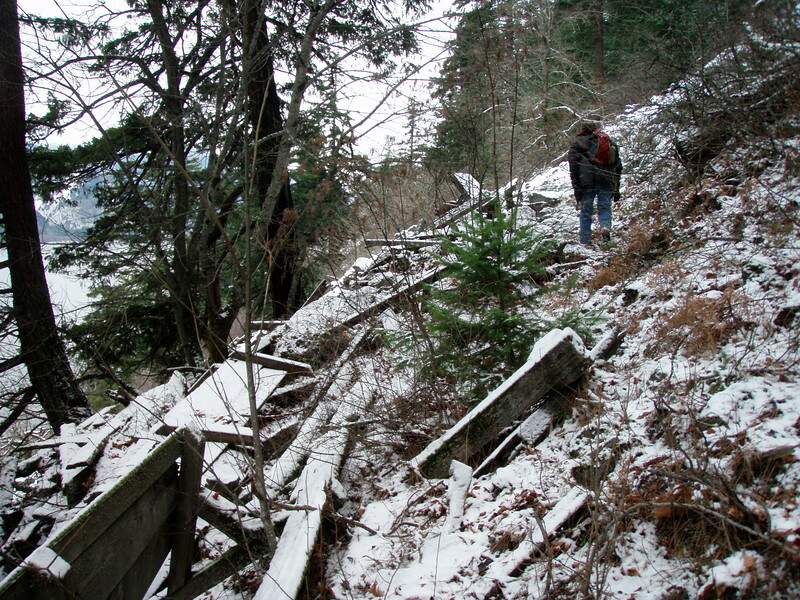 Today’s hike was kind of a roller coaster. 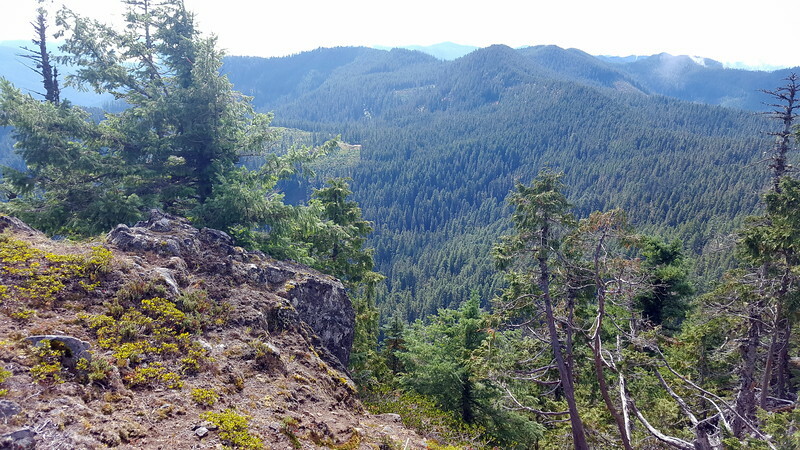 Originally, I was supposed to be working on the house this weekend (getting ready for our flooring installation), but I’ve made good progress during the week, so decided I could get out for a quick hike. Kirk was going to come, but had to cancel due to needing to go to the doctor. So, Thor and I headed up to Calico Road (the second time this year), and headed up. I was surprised at how much snow there was. 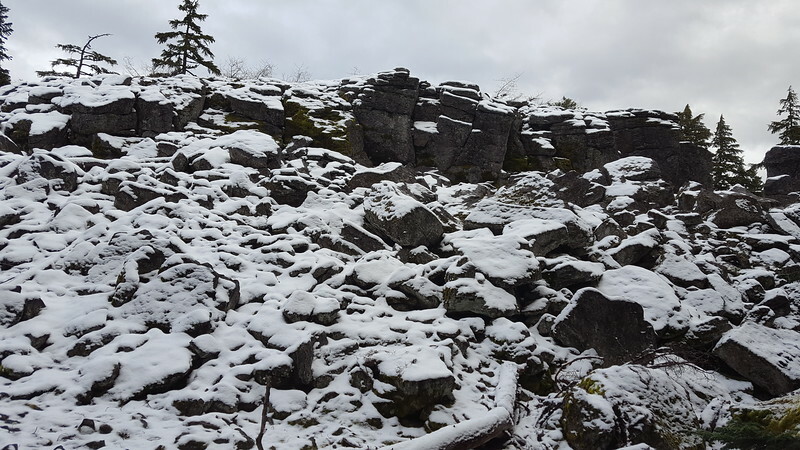 Just a few weeks ago there was pretty much no snow anywhere, but today, there was snow at the crest of the hill outside of Estacada, and remnants of snow along 224. 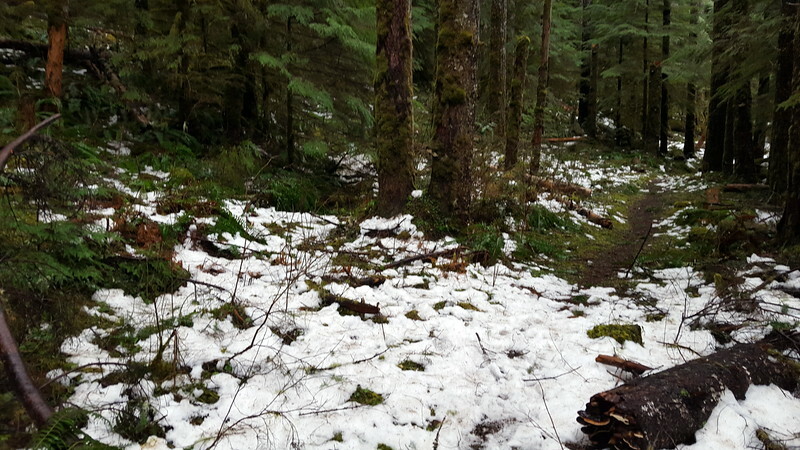 Once we turned off to go up Fish Creek road, the snow started getting heavier – it wasn’t ON the road, but right up to it. We made good time going back and got back to the car about 1:30 and then headed home. 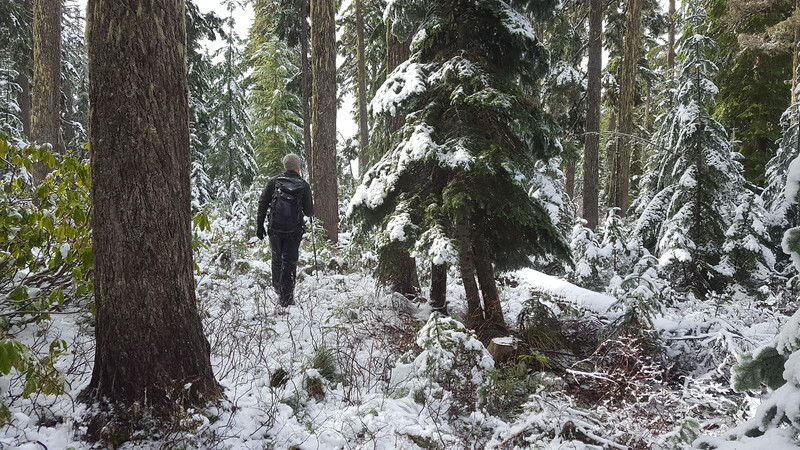 Nothing terribly exciting or earth shaking happened on this hike, but it was nice to experience the snow and get out and enjoy the woods for a few hours. Today’s hike was a “Get out in the woods” hike. I’d been working on the kitchen remodel and hadn’t hiked for several weekends, and I really wanted to get out. Thor needed some exercise too – especially since Jet was coming over for the Super Bowl the next day. I wanted to expend some of his pent up energy. 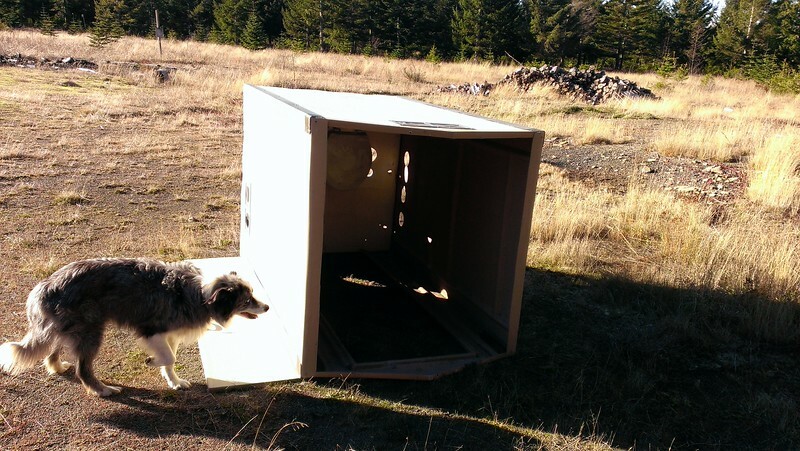 I also took the opportunity to test out a theory we had – how much farther the dogs go than we do. I put my old GPS in Thor’s pack and then compared the raw data from the GPS to the raw data on my phone. I used the raw data since I figured a bunch of Thor’s running around would get filtered out by the “fix” program I use (which turned out to be true). 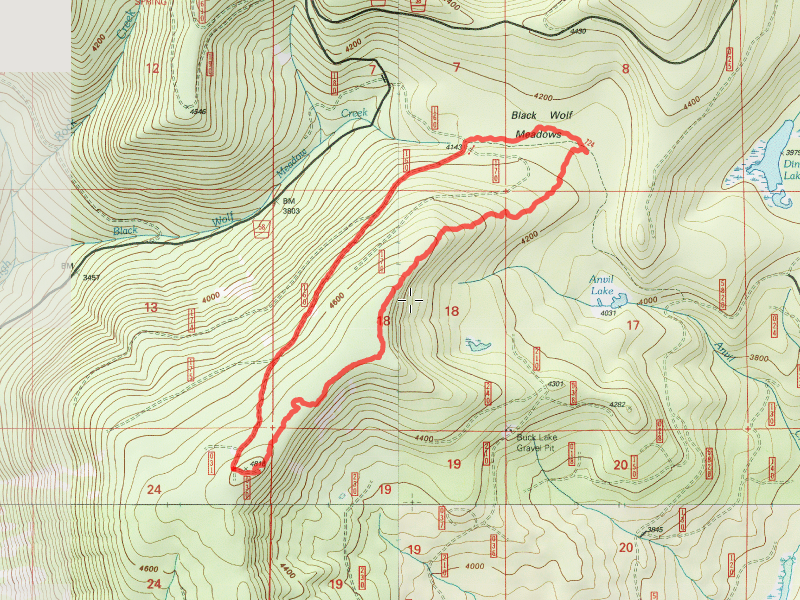 The track from my Phone showed we hiked 5.11 miles – the GPS showed Thor hiked 9.17 miles! 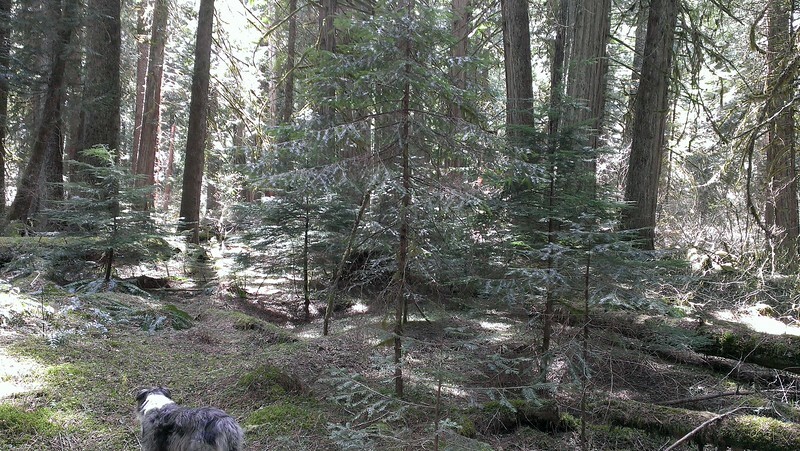 So even though Thor was by himself (no other dog), he still hiked close to twice as far as we did! It will be interesting to repeat the experiment when Ollie comes along – I will be it wills MORE than twice as far! 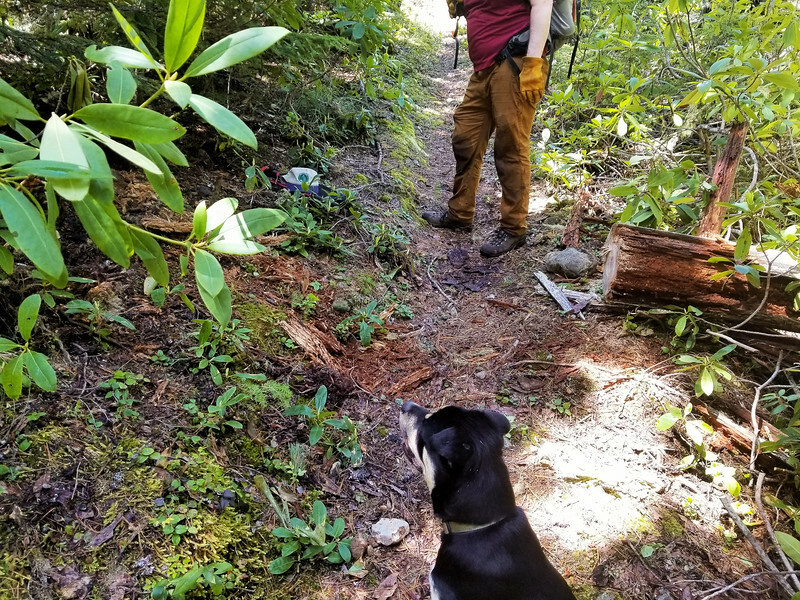 Zack joined us on this hike and he wanted to do some clearing up the old Calico road – the plan was to try and clear that and then head down to Fish Creek and clear that road on the way back – we didn’t have enough time to get the whole Calico road cleared, but we got close. We didn’t do much on Fish Creek since we ran out of time. I didn’t take too many photos since it was kind of a short day, but we did cut quite a few logs off the old road. I didn’t count, but I wouldn’t be surprised if it were 40 or 50 logs. We used my saw, but Zack did all the cutting since I wasn’t sure how Thor would respond to the the noise of the chainsaw. Amazingly enough, it didn’t seem to bother him. 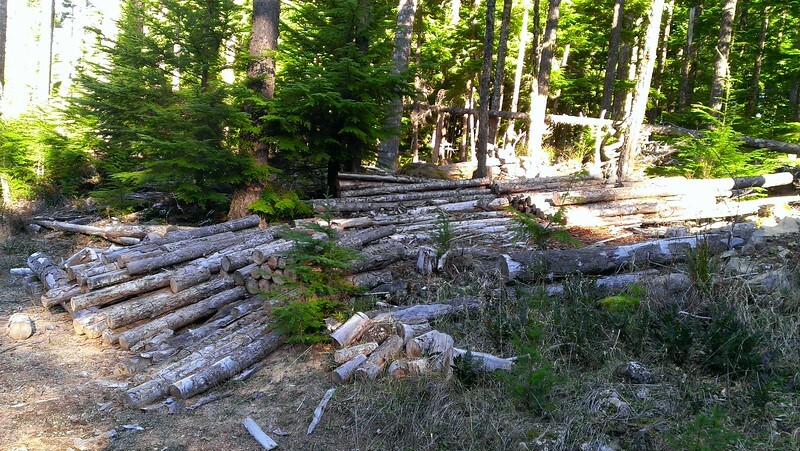 I did a bunch of lopping and clearing of the cut logs. We continued to the end of the 120 spur and then headed cross country down to the old road 54. We came in just north of Second creek. Once we hit the old road 54, we quickened our pace since we were running a bit late. 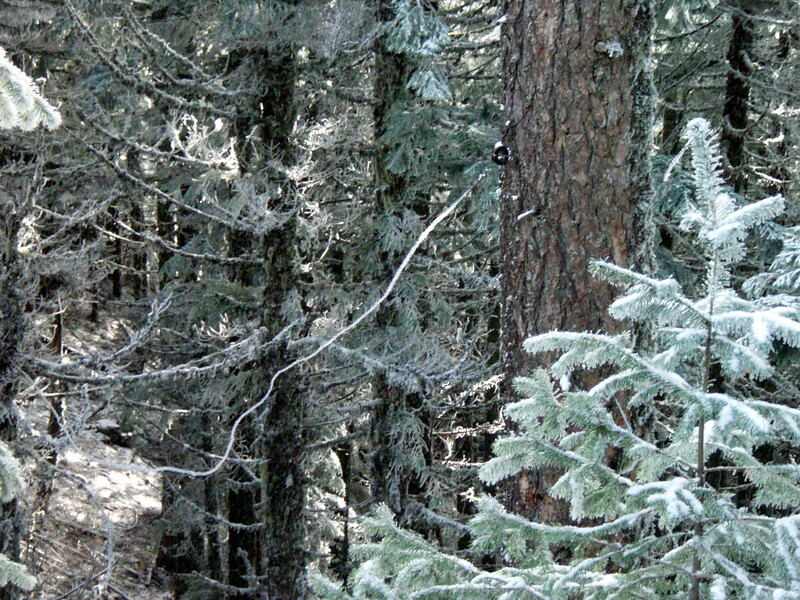 We didn’t really do any cutting or lopping on the way back except for a couple of small trees. We made it back to the truck a little after 3. A great day out in the woods in February. 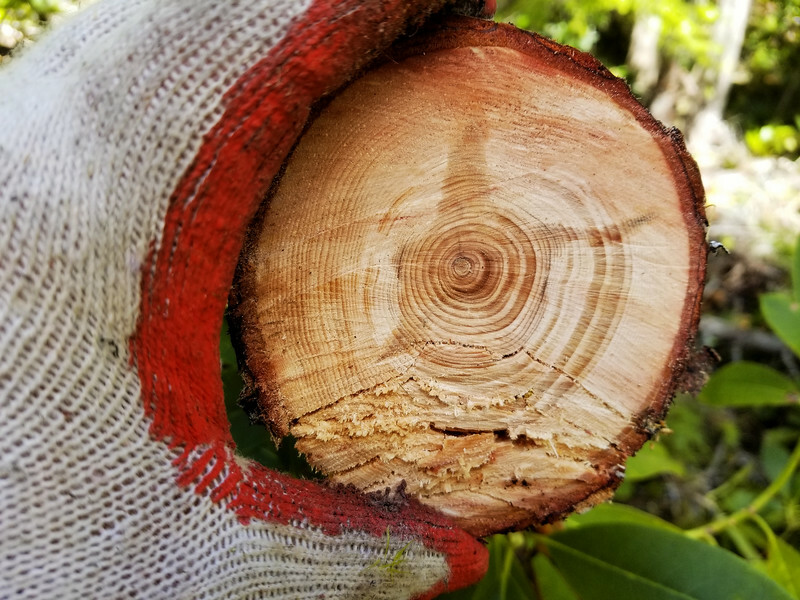 Nothing earth shaking happened, but cutting out a bunch of logs felt good and the weather really couldn’t have been better. 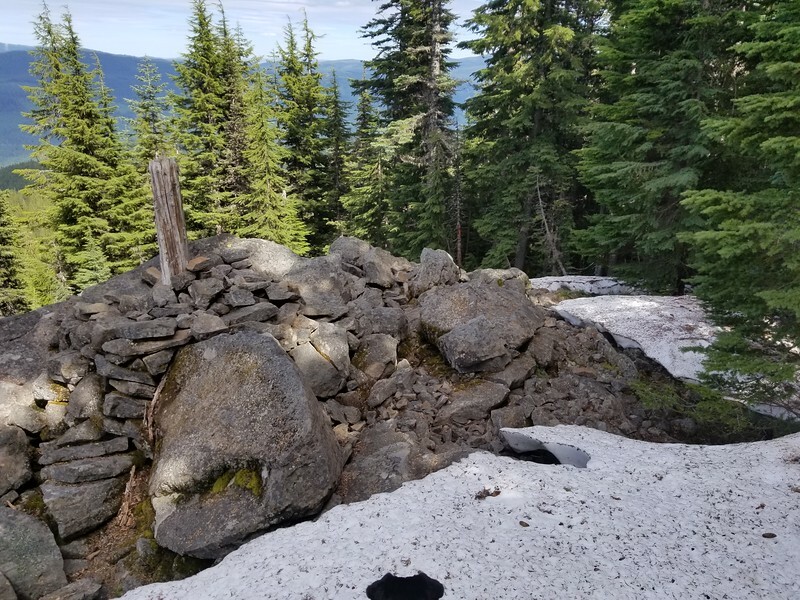 The plan for Today’s hike was to hike up the Plaza trail to the old plane crash site, then see how we felt and maybe press on to the old lookout on Salmon Mountain. The weather report was supposed to be just about perfect weather for hiking. We headed up a little earlier than usual, and made our way down the pothole laden 4610 road to the east end of the Old Baldy trail. The Plaza trail actually starts here – you take off from the trailhead and in about 50 feet the Plaza trail heads east for a bit (to the old Plaza Guard station) and Old Baldy heads west. And here is a 360 Photo from the top of Sheepshead Rock that Kirk took (mine got messed up somehow). 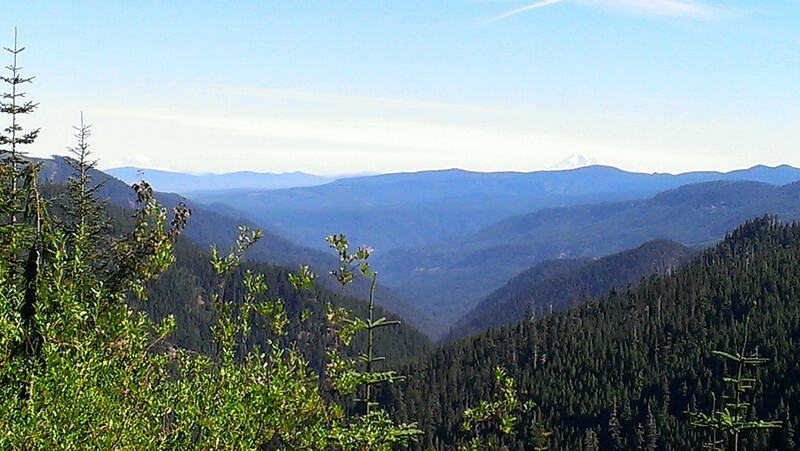 We ate lunch at the lookout site and enjoyed the sunshine and the views for a while. After a while, we decided we should head back and then went back down the way we came. 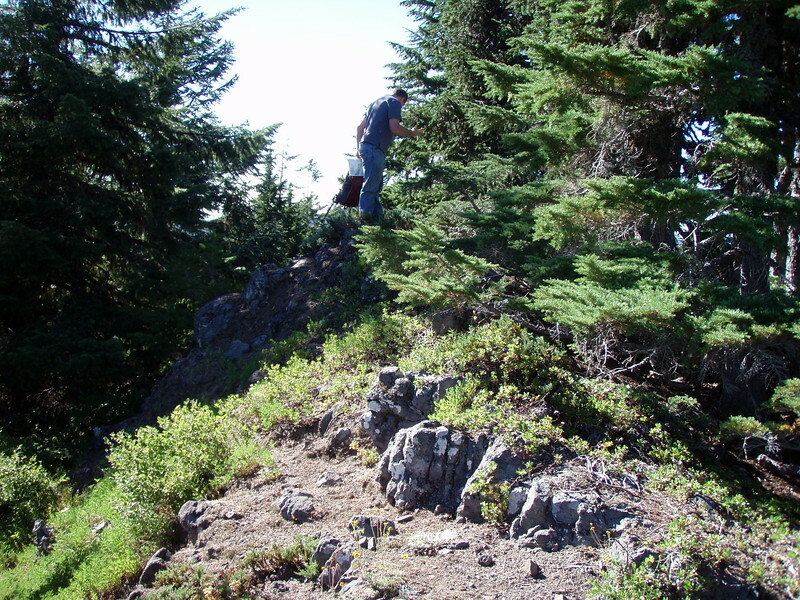 When we got to the switchback at the bottom of the hill (where it switchbacked back west up to the lookout), Kirk wanted to see if there were views on the second peak – the switchback was kind of in a saddle between the two peaks. 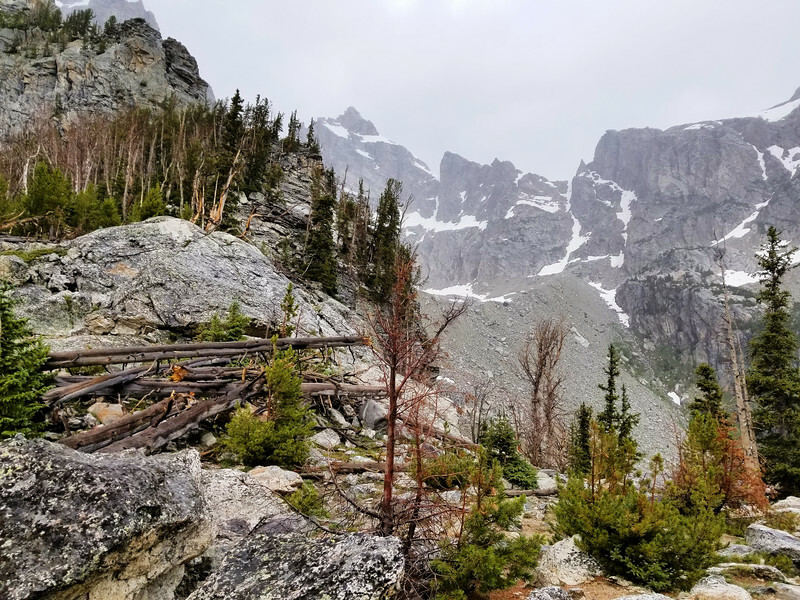 There was a faint trail that headed up, so we followed it up to the high point, but there was really no views, just a small meadowy place where the faint trail seemed to kind of die. So, we headed back and then headed down the trail. We still had a long ways to go back and by this time it was almost 3:00. 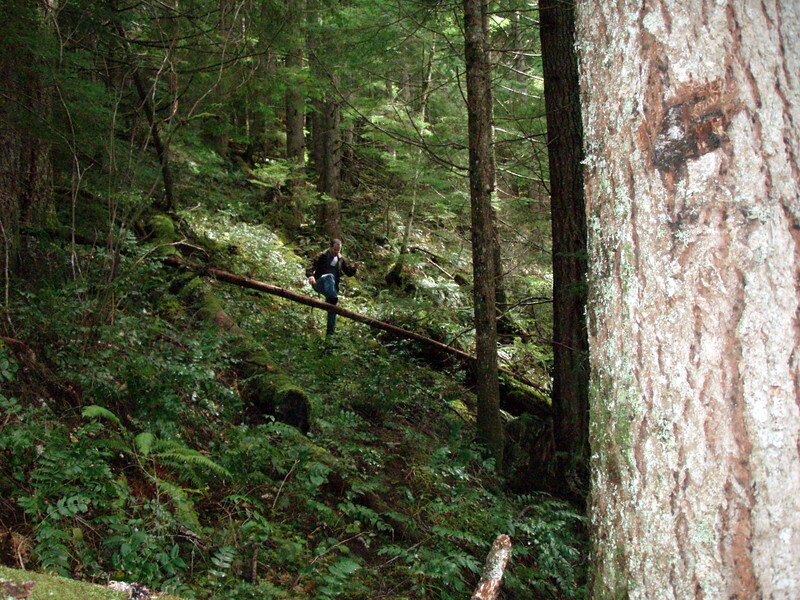 On the way out, I had forgotten how up and down this trail was – or maybe I was just tired. It seemed like there was a LOT more UP on the way back than I remember. We got back to the trailhead a little after 5:00 and found another vehicle parked there – we were guessing they must have been hiking the Old Baldy trail. We packed up and headed out. On the way out, driving the 4614 road, a lone hunter was along side the road with a deer. He flagged us down and asked if we could help him load it into the back of his minivan. We did, although Kirk got some blood on him while we were loading it. It was kind of an interesting way to end the day! We capped off an almost perfect day of hiking with dinner at Fearless. This was kind of my birthday hike. I decided to do it with just Thor and me. 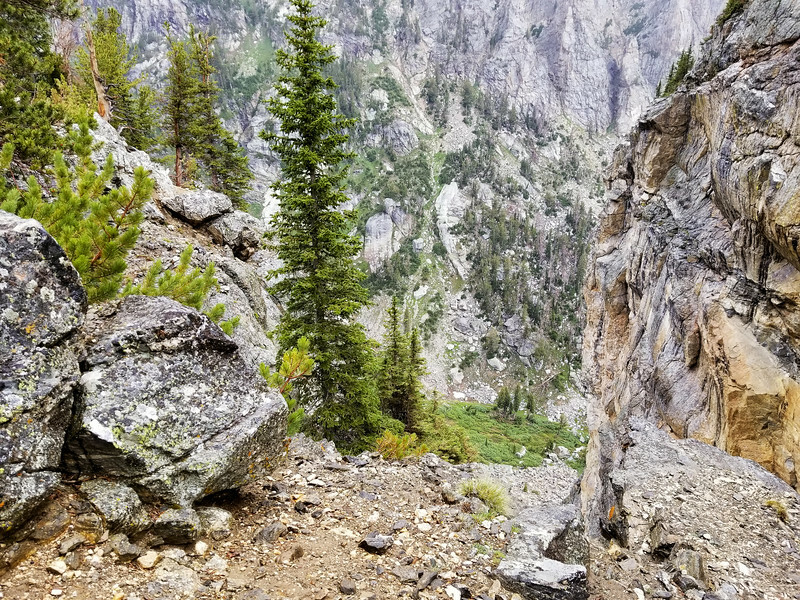 I had wanted to head down Corral Springs for a while – 1, because I haven’t hiked it in quite a while and 2, to see if I could see any evidence of old trail on the east side of the Roaring River. 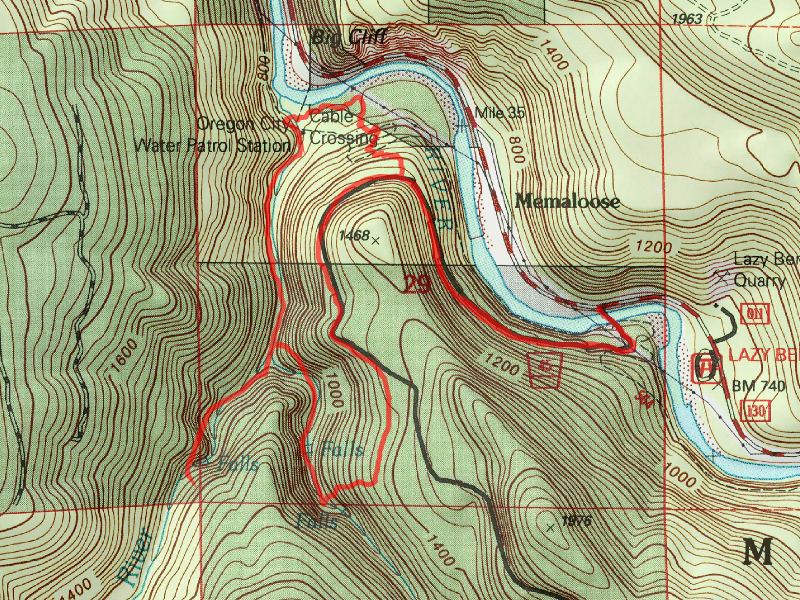 Old maps show the trail continuing on across to the 511 which goes down the South Fork Roaring River. 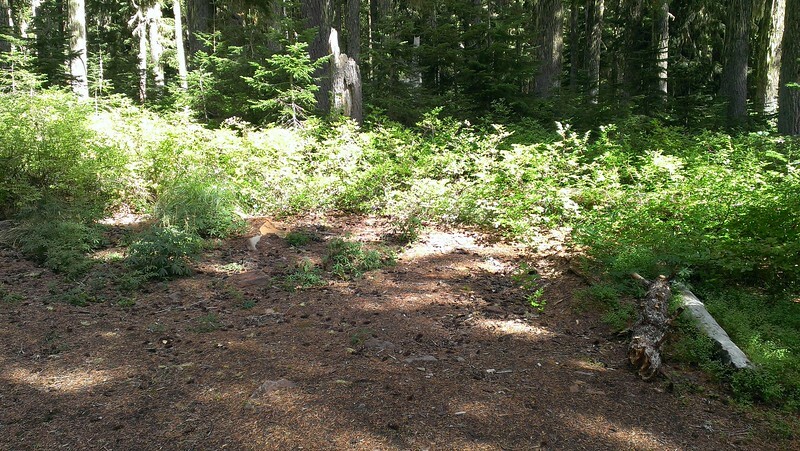 When we got to the abandoned Lookout Springs campground (where the trailhead starts), there was a family camped there. Thor, being Thor wanted to meet them and ran over to them. He made a new friend with their son, who seemed to really like him. 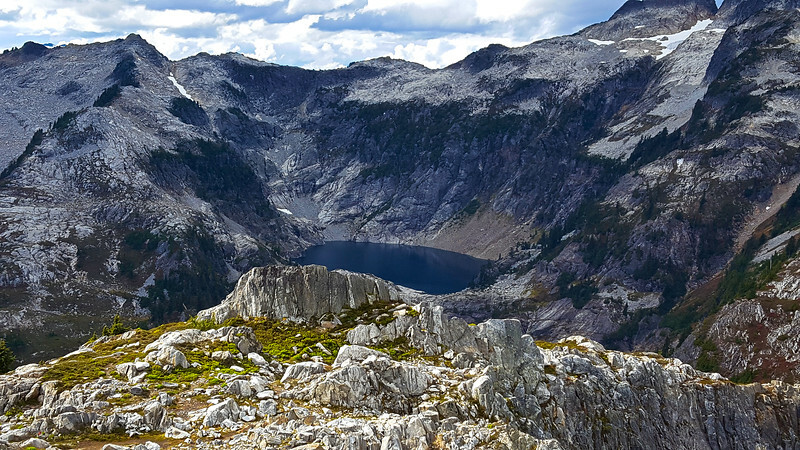 The dad asked me about Huxley Lake – how far, how hard, etc. I told him what I remembered from the last time I went down there and told them about the weird side trail to the lake (which tripped me up on my first attempt). 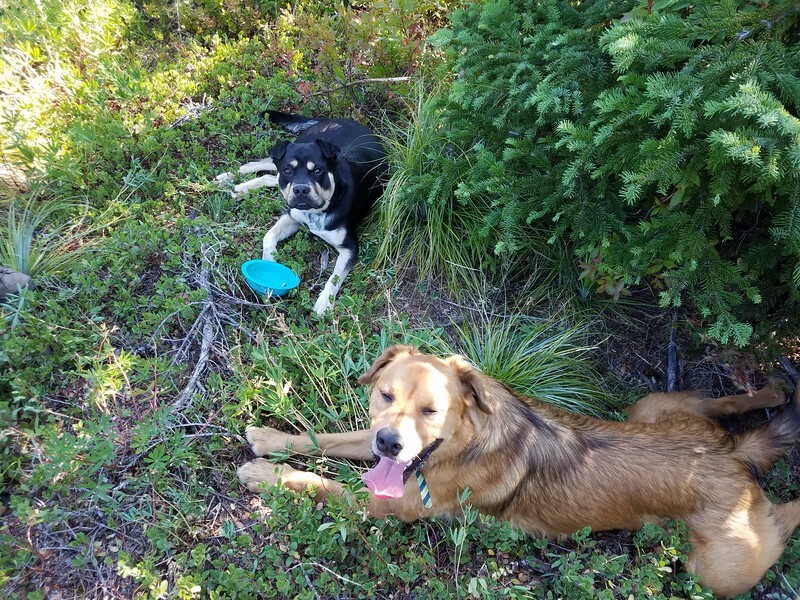 When we returned from our hike, they were still in the camp and I asked if they had gone to the lake they said no. Oh well – at least they didn’t get lost. 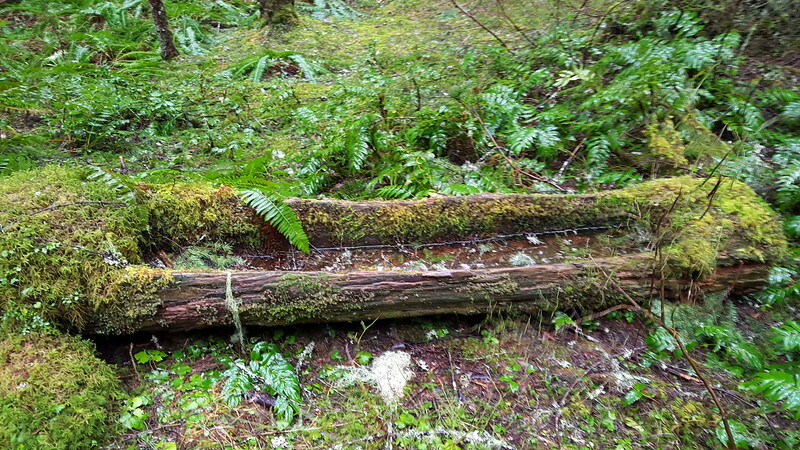 We did find one possible short section of something that kind of looked like tread, but it was only about 10 feet long. We found no blazes at all. We spent about 30 minutes over there looking for anything, and found nothing. I’m guessing that the maps are correct and at some point Corral Springs got re-routed farther north (its current location) from its original routing. I’m guessing any tread or blazes (if they exist) would be wherever that alignment was. Since we couldn’t really find more 511 tread across the river, I think that end of the 511 is probably gone. 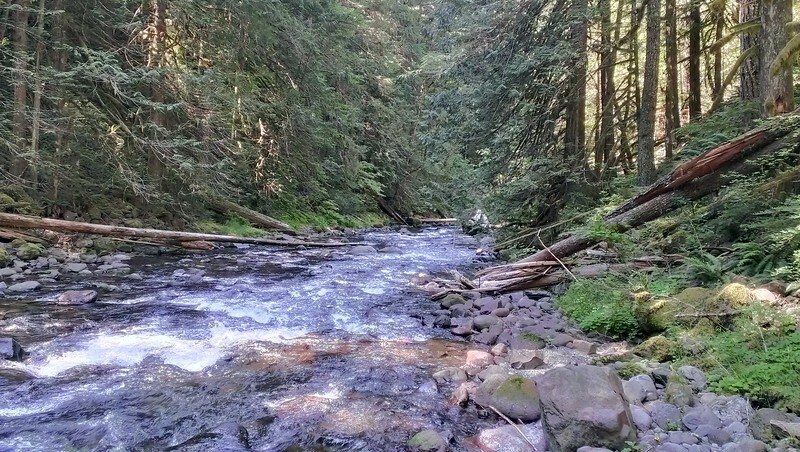 We crossed back over the river – this time I thought I could rock hop, but it turned out that I missed a rock – I ended up getting wet on the far side. But it wasn’t too bad. 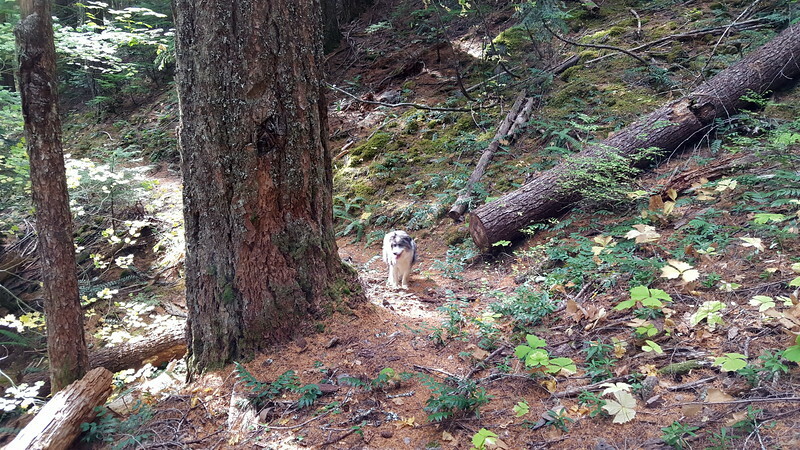 We headed back up the steep trail, doing some brushing on the way (it allowed me to rest a bit on the long trip back uphill). We made it back up in pretty good time and then headed home. 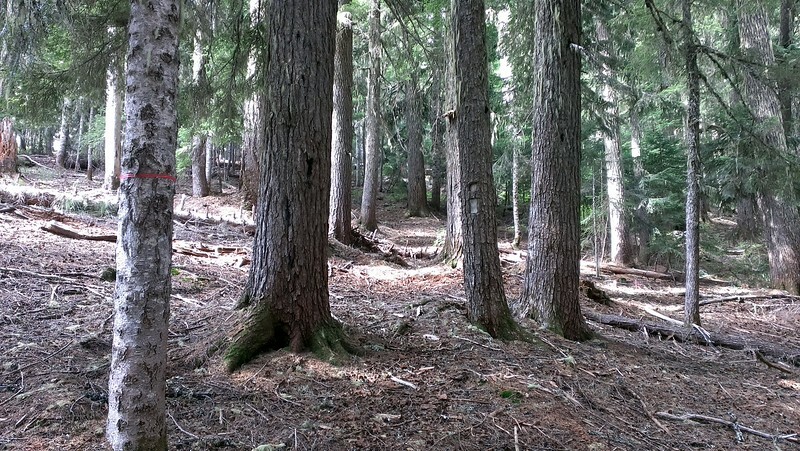 A very nice day in the woods – great way to spend a birthday! This was our last day in the Grand Tetons, and Carly had to work a morning shift (until 3PM). 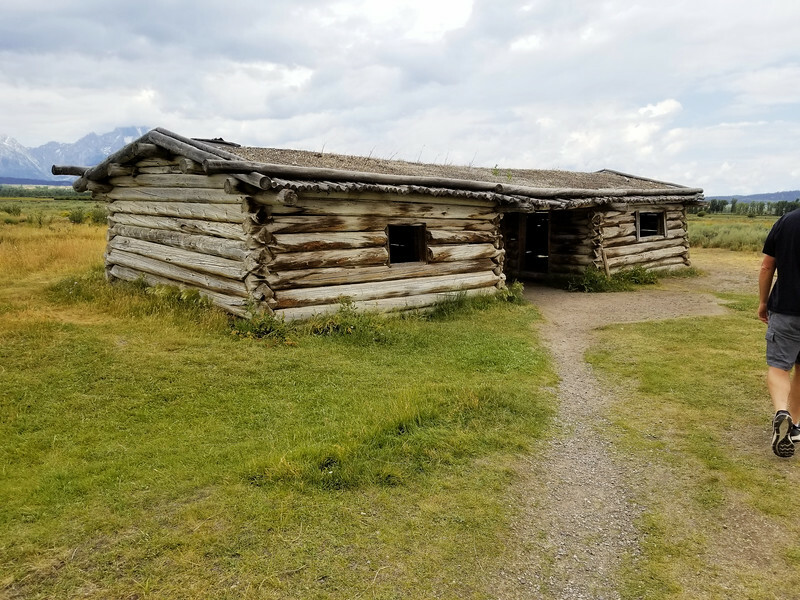 We decided to do some “touristy stuff” in the morning and early afternoon, deciding to drive around a bit and visit the visitor center, Mormon Row, the Cunningham Cabin, and the top of Signal Mountain. By this time it was almost time for Carly to get off work, so we headed back to camp to get ready for our last short hike up to Laurel Lake. As we were headed back to camp, we ran into a “Bear Jam” – a Bear had been chased out of the campground and was along the road. People had stopped in the middle of the road to take pictures. The bear seemed completely uninterested in all the attention it was getting. We enjoyed the lake for a bit and then headed back to the car and then on to Leek’s Marina for some great pizza. A great way to end our stay in the Grand Tetons. 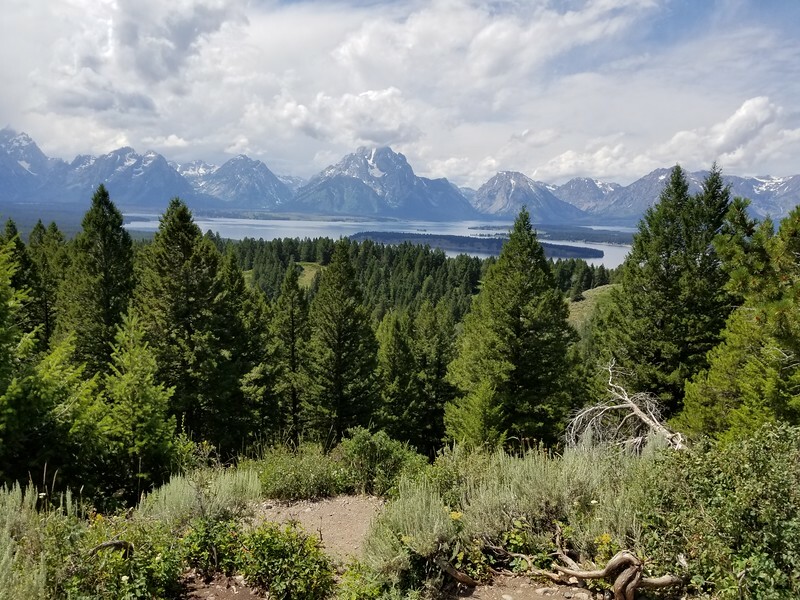 This hike was the first hike with Carly in the Grand Tetons. 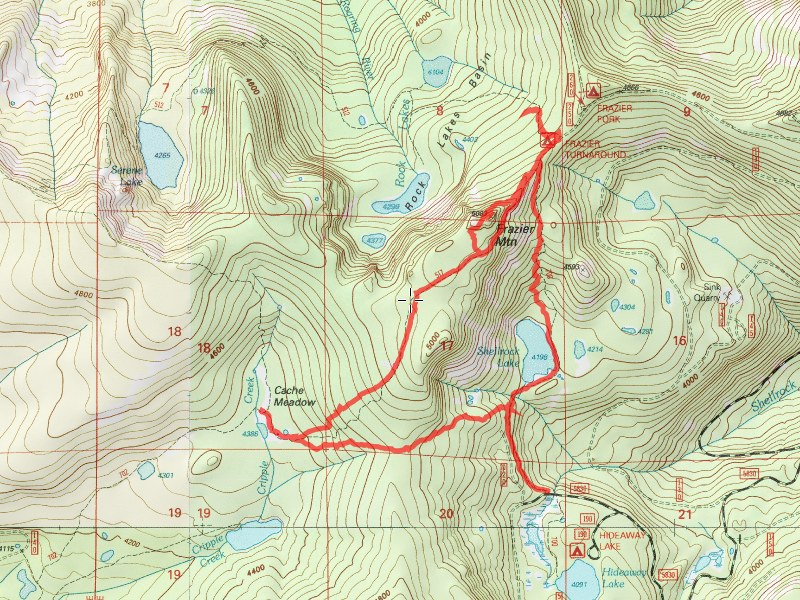 This was a partly offtrail hike (up to Delta Lake) and then up to Surprise and Amphitheater lakes. 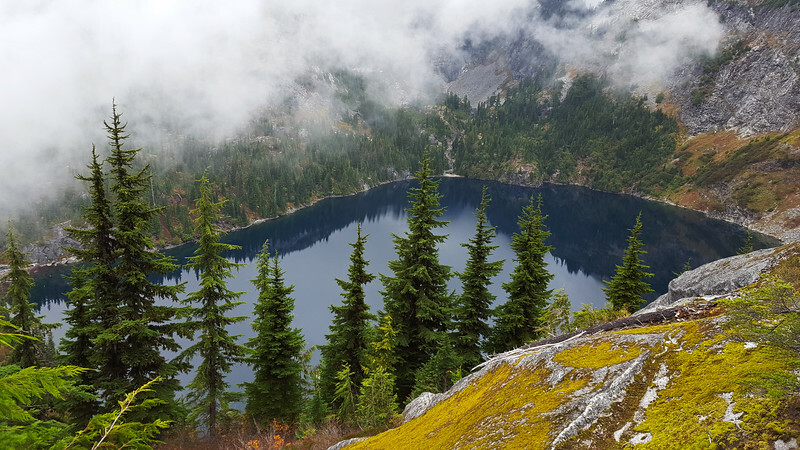 After having lunch and enjoying the view for a bit, we headed back down to the junction with the Amphitheater Lake trail. 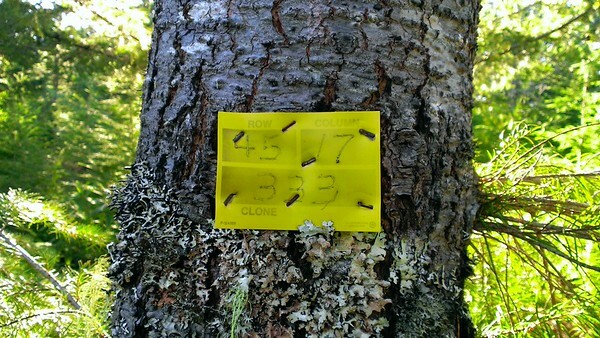 On the way down, we saw these pouches on a tree and a small placard explaining what they were. 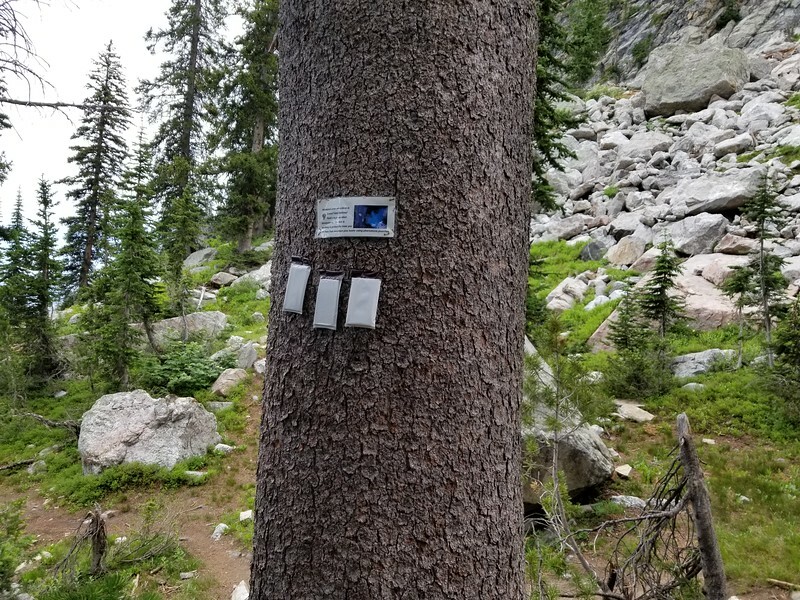 They are trying to save the Whitebark pine trees from the mountain pine beetle, and the pouches are “pheromone pouches” which must repel the beetles. We continued down the trail to the junction with the real trail and at this point, Carly went downhill since she had to go to work. 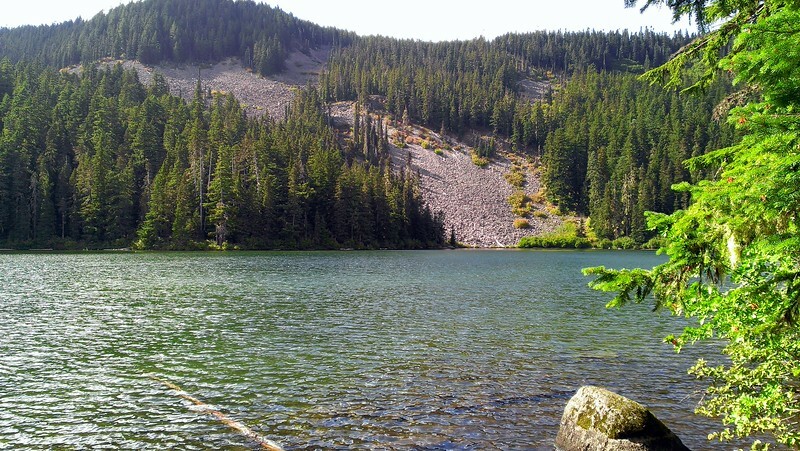 We continued up the hill to Surprise and Amphitheater lakes. 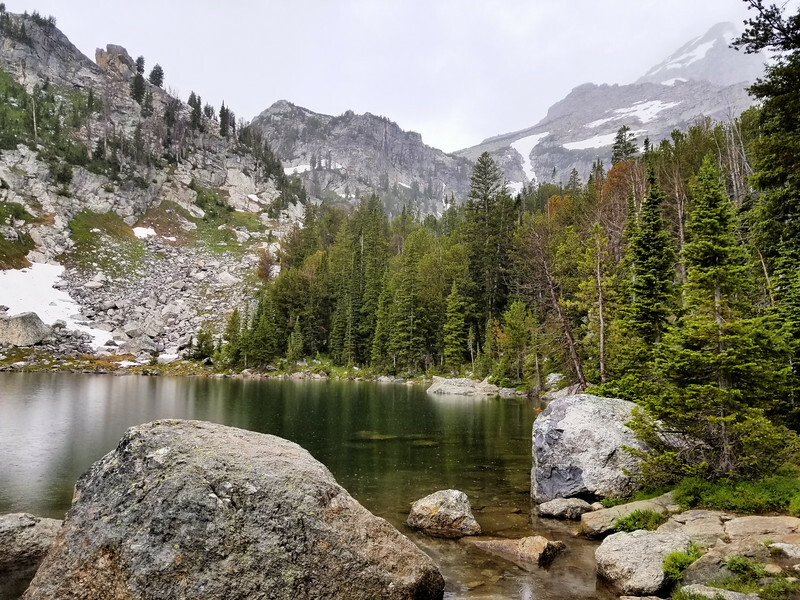 On the way up, we talked with a man who said we should continue past Amphitheater lake up to the ridge above the lake – he said it was quite a view and worth the climb. A little later, we started to feel a little drizzle. This continued for a while and got heavier. Unfortunately, I did not bring rain gear on this hike since I only had my little teeny day pack. I did bring my OmniHeat jacket, which isn’t waterproof, but it kept me warm while it rained. The rain let up somewhat, but continued for a few hours. You could see how this lake got its name – seeing the delta feeding it and the sediment going into the lake. 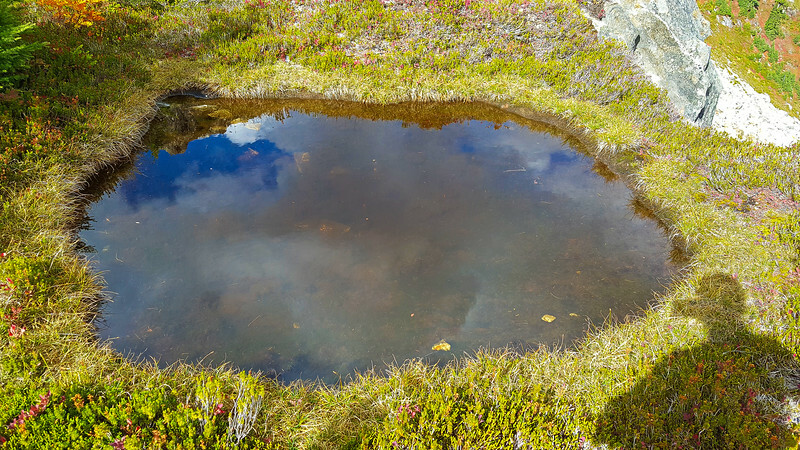 It was really interesting to see the lake from 1000′ above like that – you couldn’t even see the brown part of the lake from below! That was really interesting to see. We were thinking they might try and summit one of the mountains. After watching the climbers for a bit, we continued down the trail. Shortly after that point, the rain mostly stopped, so we took off our rain gear and continued down the hill. The trip down was pretty quick (compared to going up). 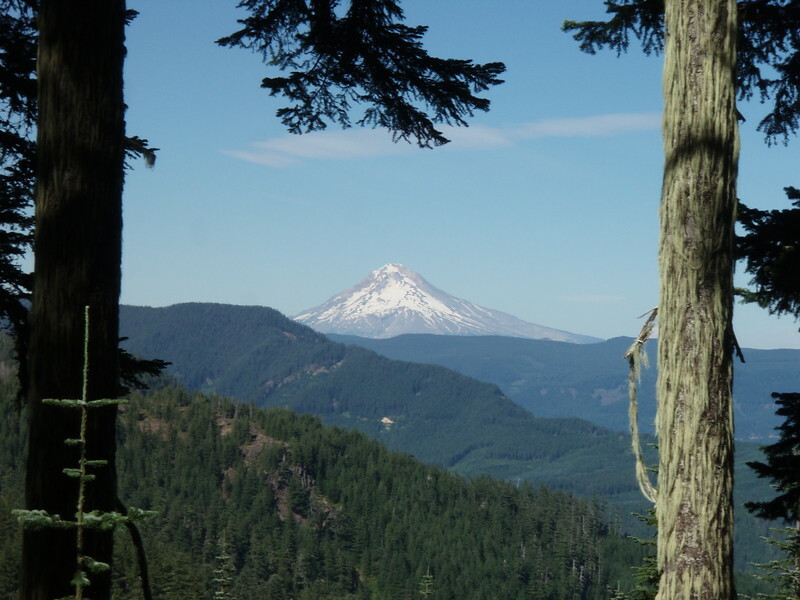 We got back to the trailhead about 3:30 and headed back to camp – a wonderful days adventure in a BEAUTIFUL place. 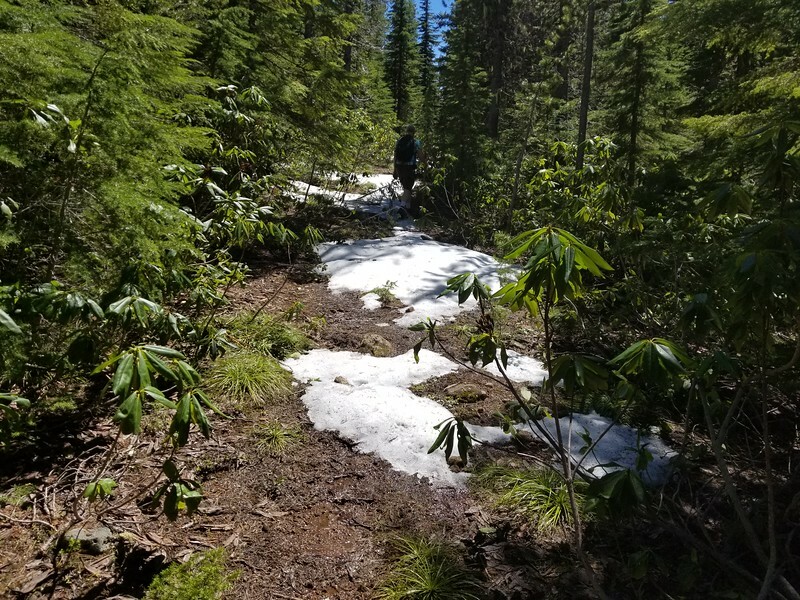 The hike today was originally supposed to be a different one, but we found out that we couldn’t get to the trailhead due to lingering snow. 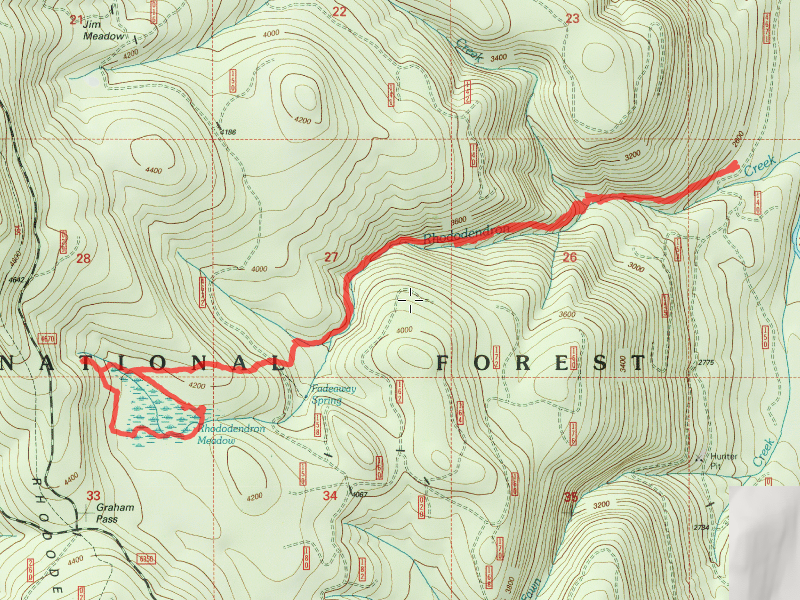 So, we decided to hike the old Burnt Granite trail – a segment of the Skyline Trail back in the day. I never knew that existed. Kind of a neat find. 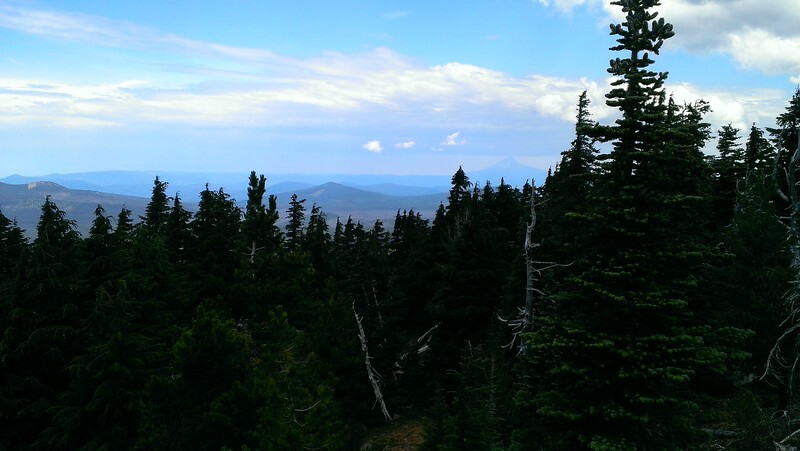 We spent a few minutes up on top, and then headed back down – eventually finding the trail. The way down was a little more covered in rhodies than the way up, but we managed to find the trail again, and then headed down. 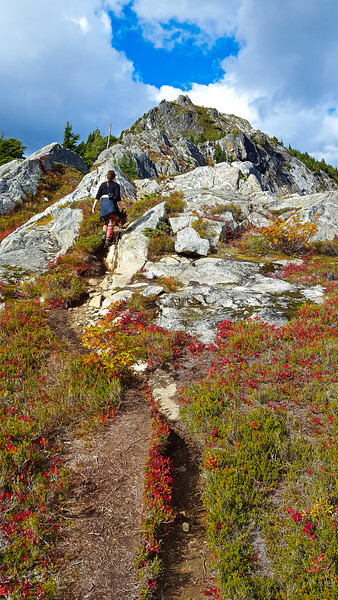 We lopped a few of the worst of the rhodies on the way down, but didn’t really do much – we were already running late. We ended up getting back to the truck about 6:00, which would put us back in town around 7:30. Charles was starting to wonder where were were! We decided to stop at Fearless on the way home – we were hungry – Charles had to get home so he didn’t join us. 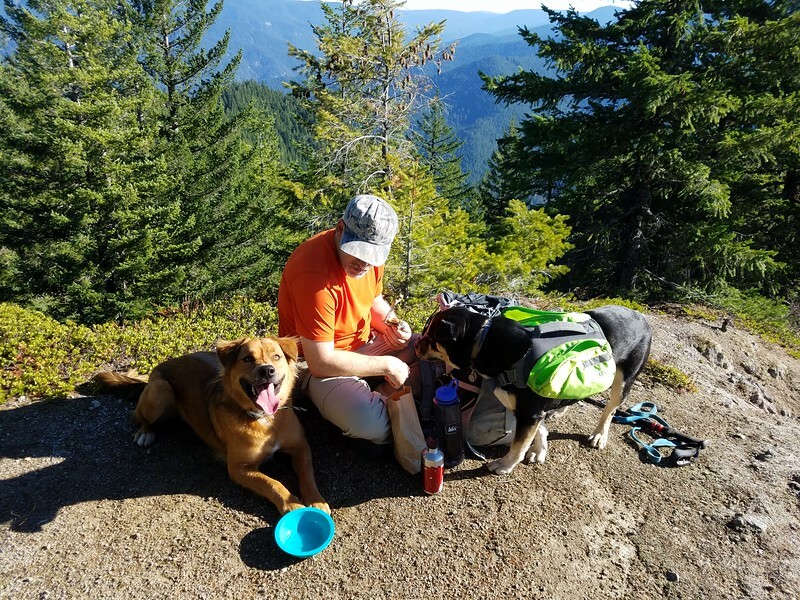 The burger and beer tasted really good after a hard day of hiking and trail work! A great early summer day in the woods! I had a 3 day weekend for Memorial Day and the weather was supposed to be beautiful (if a little warm for this time of year). So, I wanted to get out and do a hike. Options are still somewhat limited due to the heavy snow load this year. 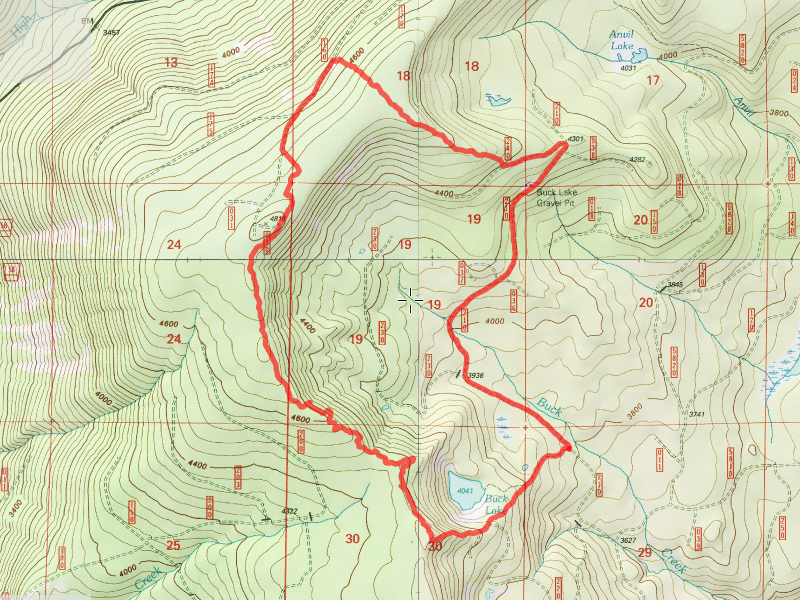 I had been thinking of hiking MP3 up to the Rimrock trail and trying to get out to the overlook or maybe going up 4635 and the Cripple Creek up to Cache meadow. 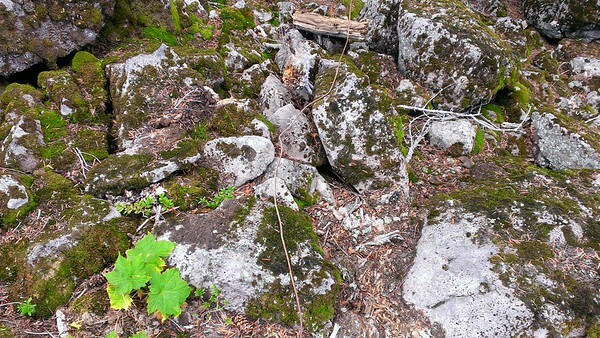 Charles had the great idea of doing a shuttle hike using the old Bissell Trail, Old Baldy and the White Iris trail. I was hoping that the Iris would be in bloom, but due to the late spring, it had unfortunately not bloomed yet. 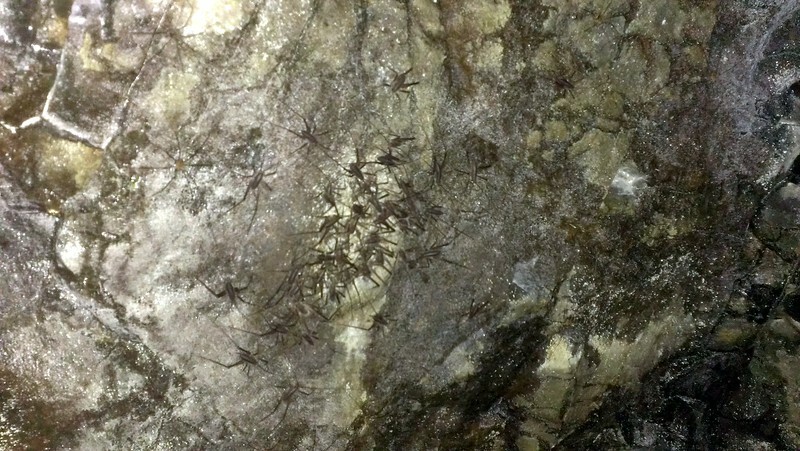 He also said those of us who were “adventurous” could go down and explore the un-named lake below Old Baldy. That all sounded intriguing to me, so we all planned to head out early on Saturday morning. 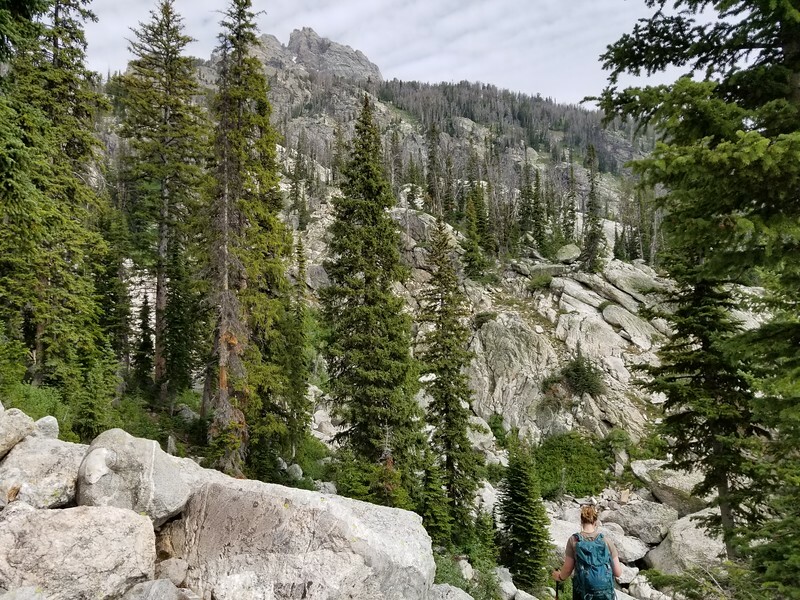 The plan was to leave one car at the White Iris Trailhead, then drive up to the Bissell Trailhead (about 2 miles up the road), and then hike the Bissell trail up to a point where we could head cross country over to the un-named lake below Old Baldy. 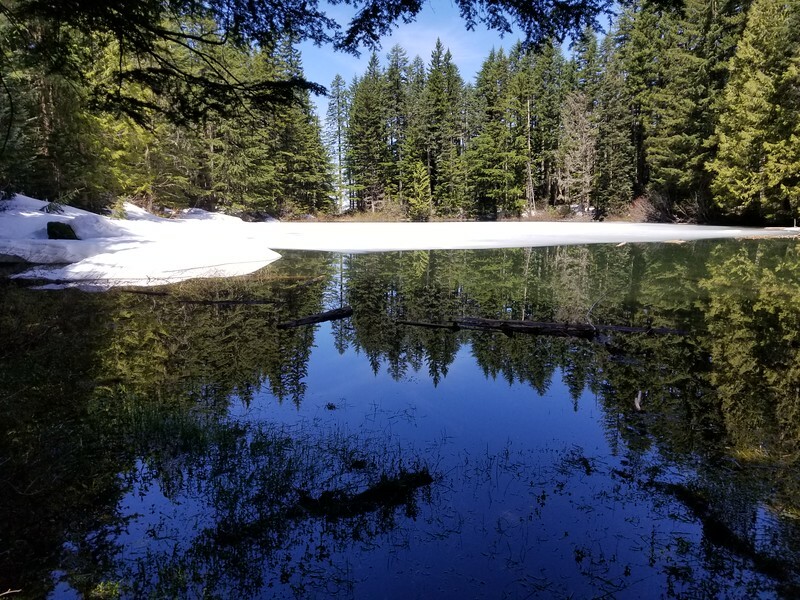 After exploring the lake, we were going to go up to Old Baldy, and then head down the Old Baldy trail to its junction with the White Iris Trail and take that back to the 4615 road where we could retrieve the other car. 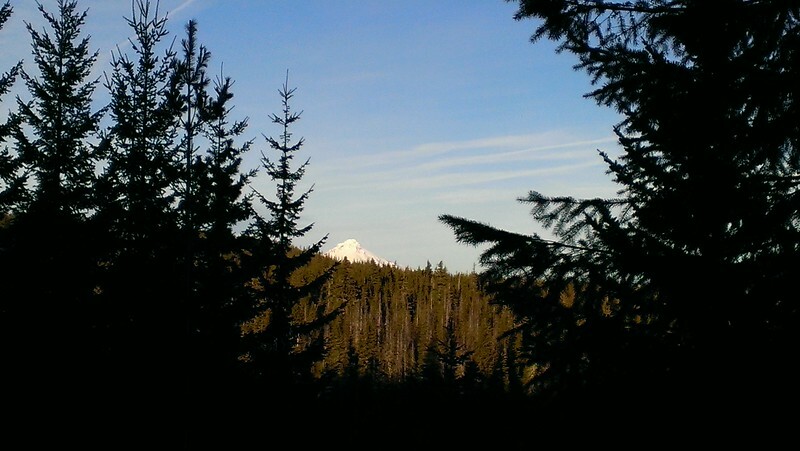 The day went off mostly as planned with the exception of the beginning of the White Iris trail. 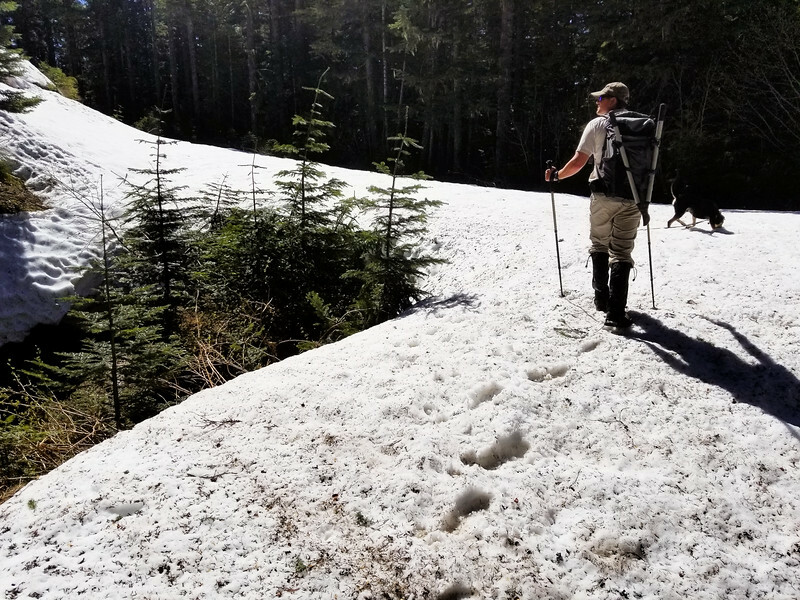 We ran into some serious snow on the Old Baldy trail, and were unable to continue following it, so we ended up going cross country in the general direction of the White Iris trail, hoping to find it. We eventually did, and followed it the rest of the way down. OK, on to the play by play and photos of the day. 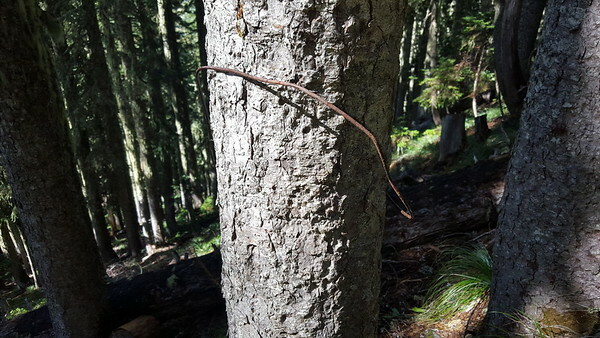 The only thing holding it up was the top branch on the snag next to it. Very odd, although it looks like it has been hanging there for quite some time, so it must be pretty solid. We explored around the lake, and while doing so, Thor ended up kind of falling into the lake. I think he ran out on to the ice and it broke. It didn’t seem to bother him much, but he didn’t stay in the water too long. It had to be VERY COLD in that lake! We picked up the trail on the other side of the road and we had no problem finding and keeping the trail all the way back down to 4615. It was a little warm in the cut area going down the hill, since we were in the full sunshine. 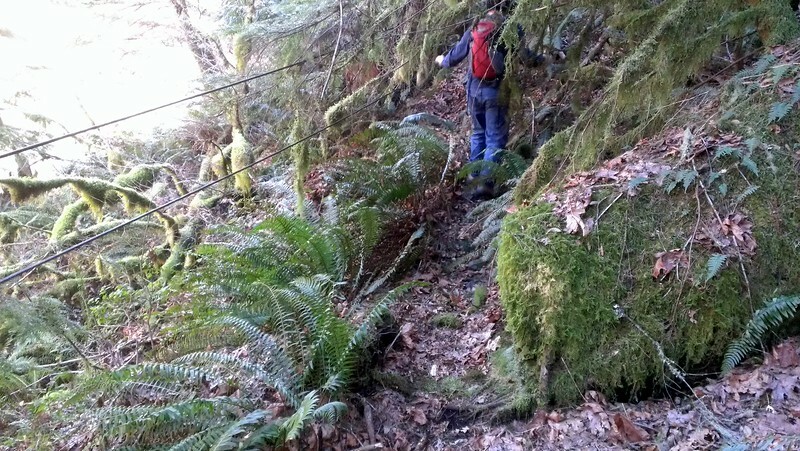 Fortunately, we were going downhill, and the exposed area wasn’t too long. Thor had apparently had enough though – about half way down the hill, he stopped in the shade behind a tree and laid down. I gave him some water and let him rest a bit and he was then ready to finish the trip. I think he was getting hot in the sun. Black fur makes it easy to get REALLY warm in the sun! 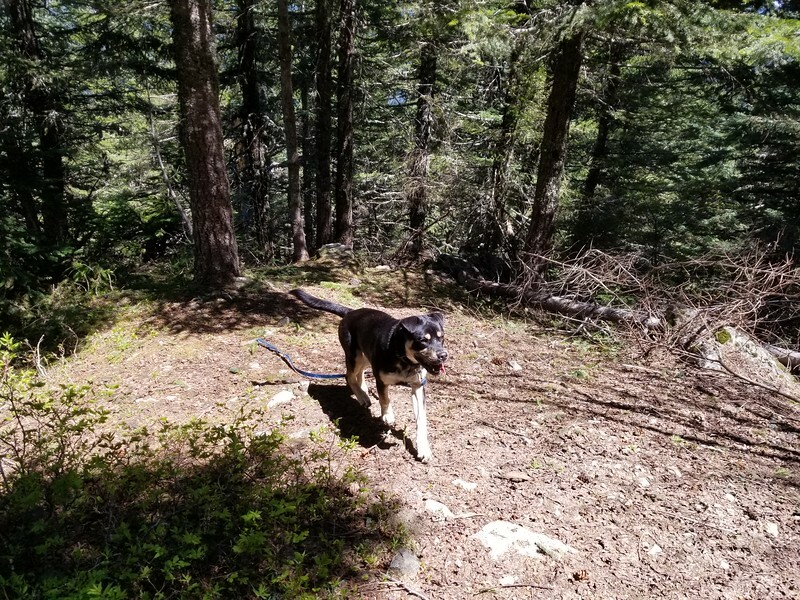 We did a fair amount of trail maintenance on this trip as well, doing a bit of lopping and cutting or moving quite a few trees off the trail. A beautiful day in the woods with good friends. Per tradition, We stopped at Fearless for a great end to the day! 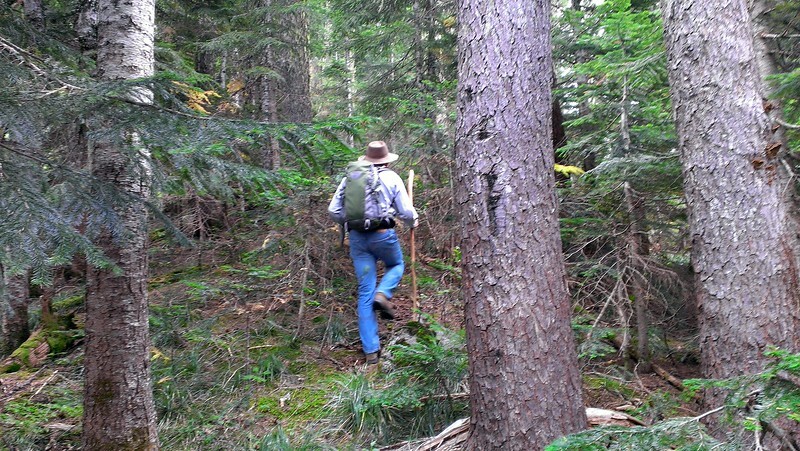 This hike was an opportunity to explore the old 701 Trail – It is referred to as the Buck Lake trail on the old maps. 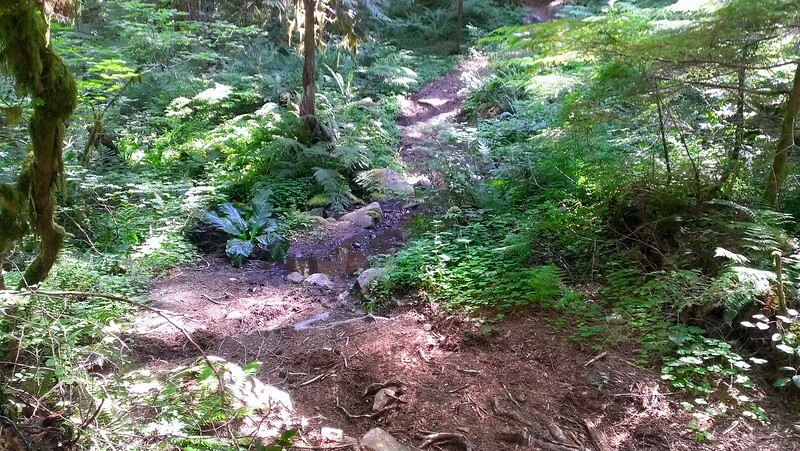 I was made aware of it recently and wanted to explore it since it appeared to be a relatively long segment of an old trail. It was also probably my last opportunity for a higher elevation hike this year due to impending snowfall. 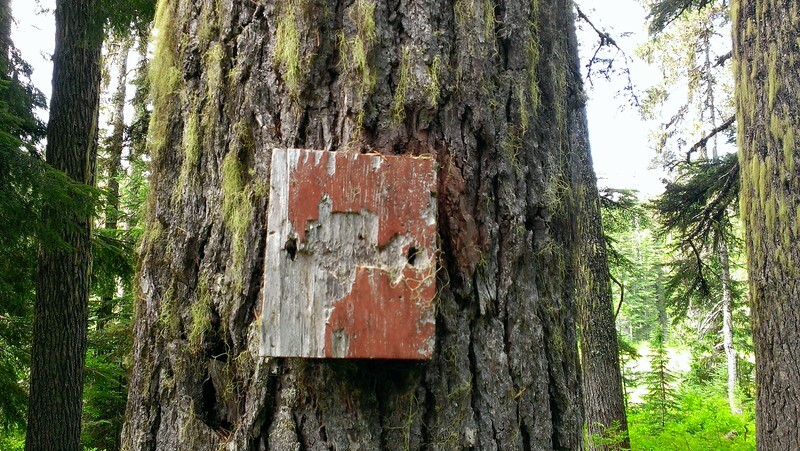 Our guess as to the purpose of these was to mark the trail for winter use – maybe snow shoeing or cross country skiing, but that was just a guess. 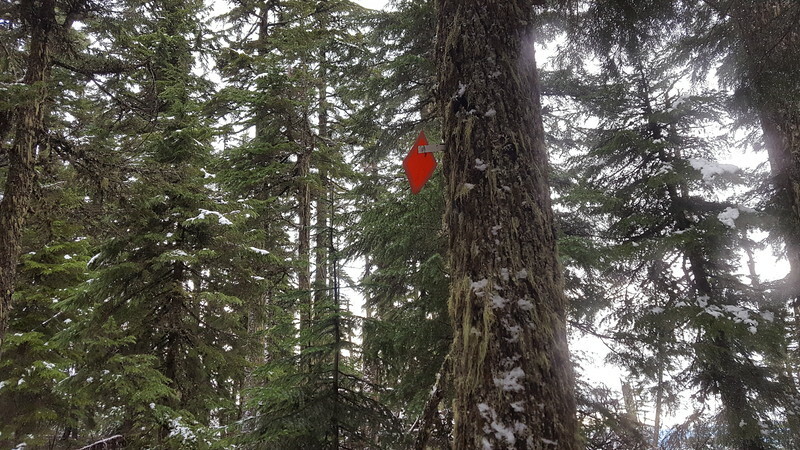 They were high up on the trees, maybe 10-12′ high, placed at regular intervals marking the trail. These would be interesting to explore – I think this one in particular would yield a nice view from the top. We didn’t want to climb it with all the snow on it. An adventure for another day. We soon came to the 240 spur and headed back down to the trailhead. That was easy walking and we quickly made it back to the trailhead, and a warm truck. A stop at Fearless on the way home made for a great end to a great exploration. Probably the last high elevation one for this hiking season. This trail will stay on my list of “todos” for next year, for further exploration. This trip was kind of a last minute plan. 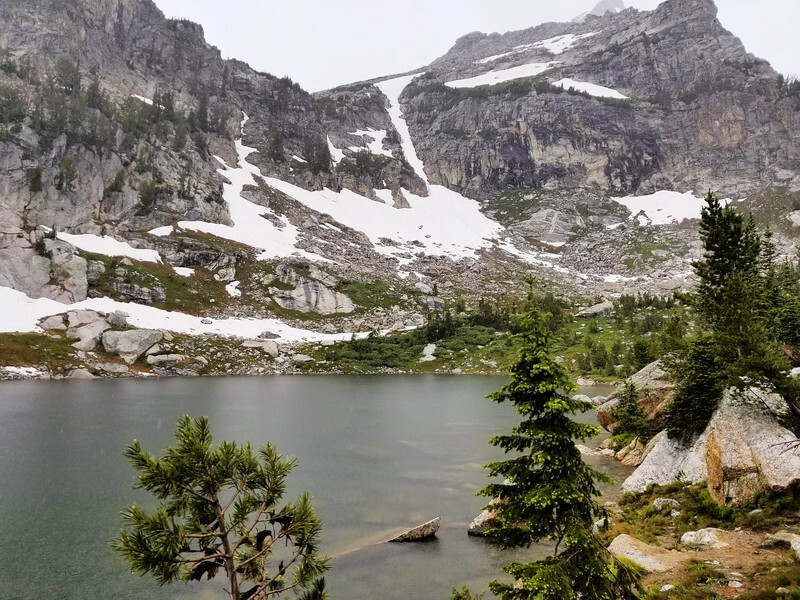 Originally, I didn’t think we would be able to do our annual Father/Daughter backpack trip due to Carly working in Stehekin again, but she sent me a message mid September thinking it might work the first week of October. 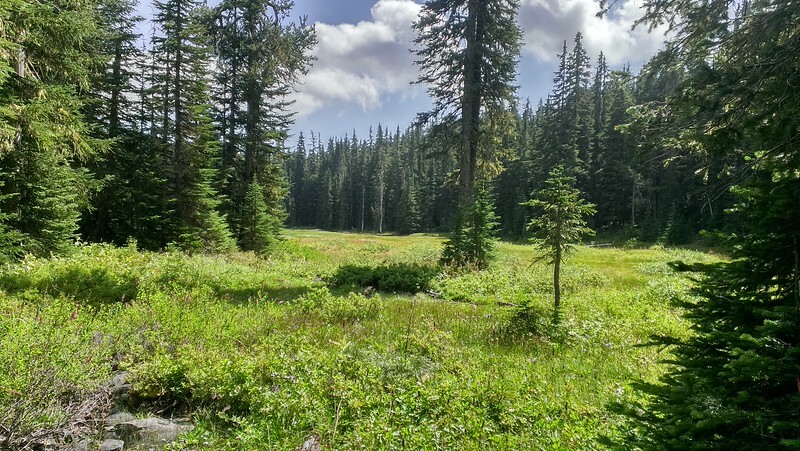 I pulled together a few options and we decided to try the Trapper Lakes trail – it is a little farther west than the trip we did last year – the Devils Dome Loop. Due to the time of year and the amount of driving involved, we could only do a 2 day/1 night trip, but that turned out to be just perfect. 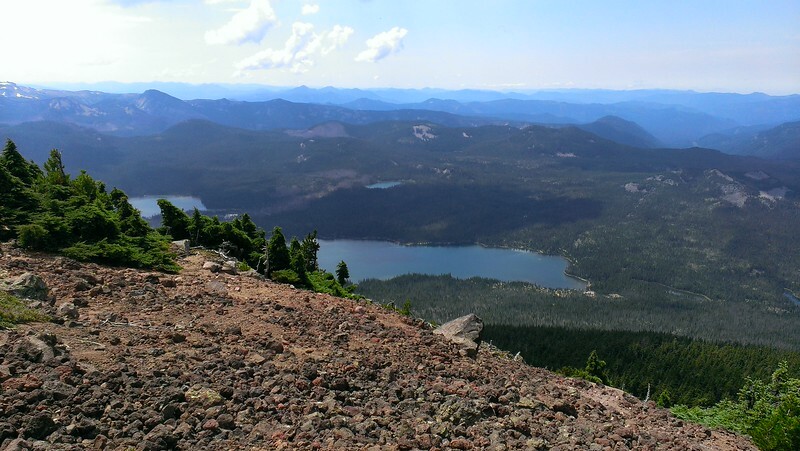 Day 1 – Drive up to Chelan and pick up Carly off the ferry – drive to somewhere around Winthrop and spend the night. 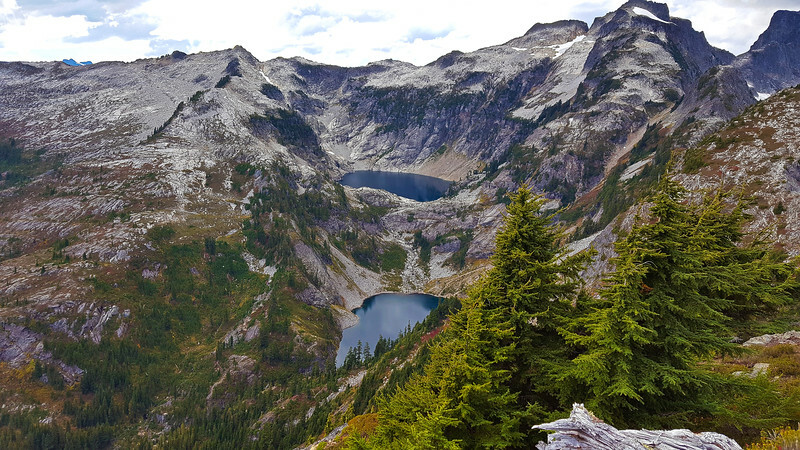 Day 2 – Drive to the Thornton Lakes trailhead and head up the hill – taking a side trip up to Trapper Peak – camp the night at Thornton Lake. 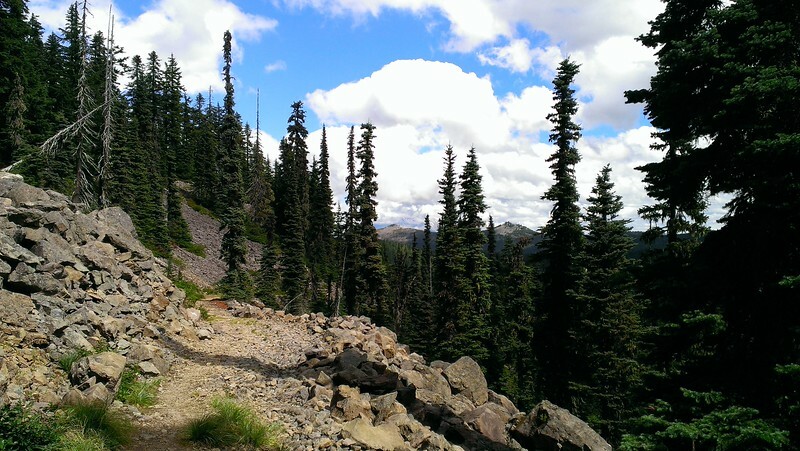 Day 3 – Hike back down to the truck and drive back to somewhere near Chelan to camp the night. Day 4 – Drop Carly off at the ferry and then drive home. The actual trip changed a bit, as we talked we decided that Carly could just come home with me and then we could look for a car for her. She could go back up to Stehekin/Wenatchee later. The weather was a big unknown, as some of the weather reports were talking about snow and/or rain and freezing temperatures. Whatever happened, I knew it was going to be quite an adventure. I headed up on a Saturday morning to Chelan – the drive was pretty uneventful (although long). Made it to the ferry early, as I left early and made good time. Fortunately, the ferry was on time and I picked up Carly and we headed out. 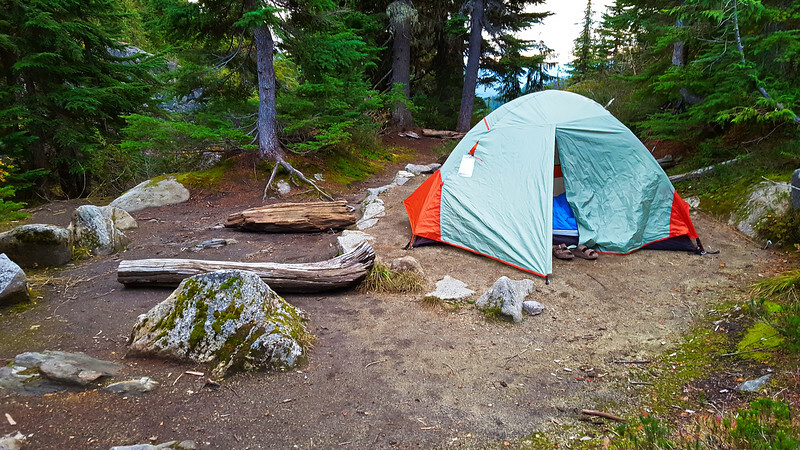 Since it is getting dark earlier, and the trailhead was 3 miles from the ferry landing, I decided Winthrop was a good spot and since we were only going to “camp” one night, and the weather was kind of iffy, I decided to get a hotel for that night. It turned out to be a good decision, as we would have been setting up camp in the dark. We made it to Winthrop and had dinner and filled up the truck and pretty much went to bed. We had about an hour and a half drive to the trailhead, so we headed out – we stopped for coffee at a little bakery in Winthrop and found out it was so busy because there was a marathon that day. Good thing I got a reservation for the hotel! Quite a dramatic place. 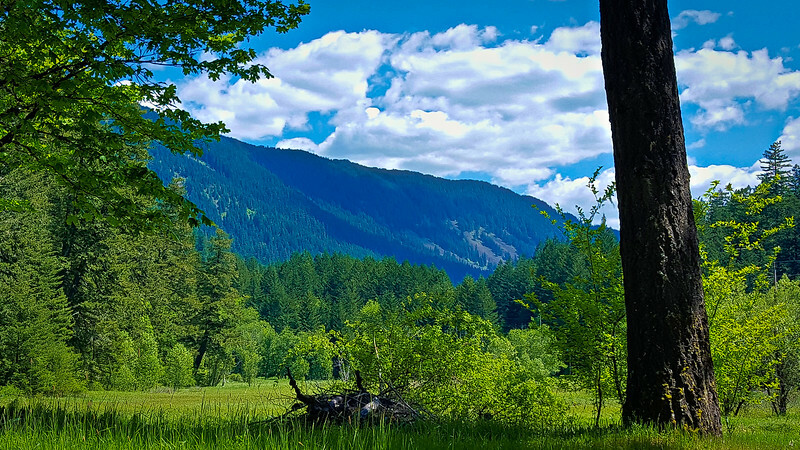 After enjoying those views for a few minutes we headed back out and shortly made it to the town of Newhalem where there was a North Cascades visitor center. We stopped there for a bit to see what was there. Lots of exhibits and info about animals and trees and such. Neat place. 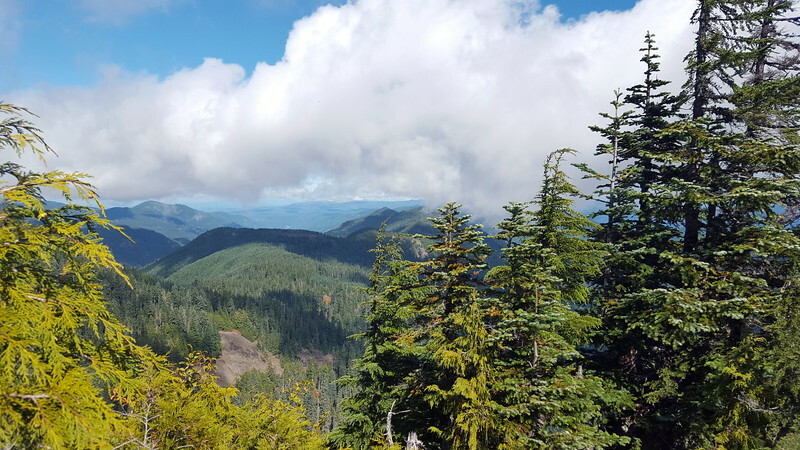 The views were in all directions and were incredible – we were very blessed with good weather – the clouds had mostly cleared and the wind was very calm. An absolutely beautiful fall day. 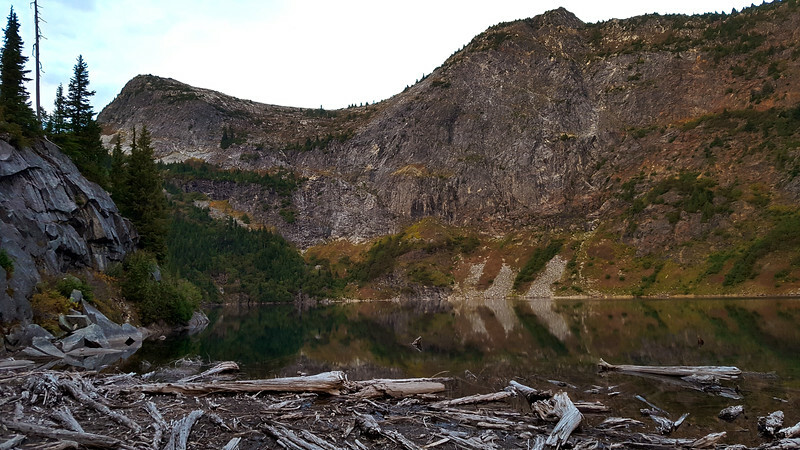 After enjoying the views for about an hour, we headed back down – we wanted to make sure we would get to our campsite in plenty of time before dark and it was already almost 4:00. 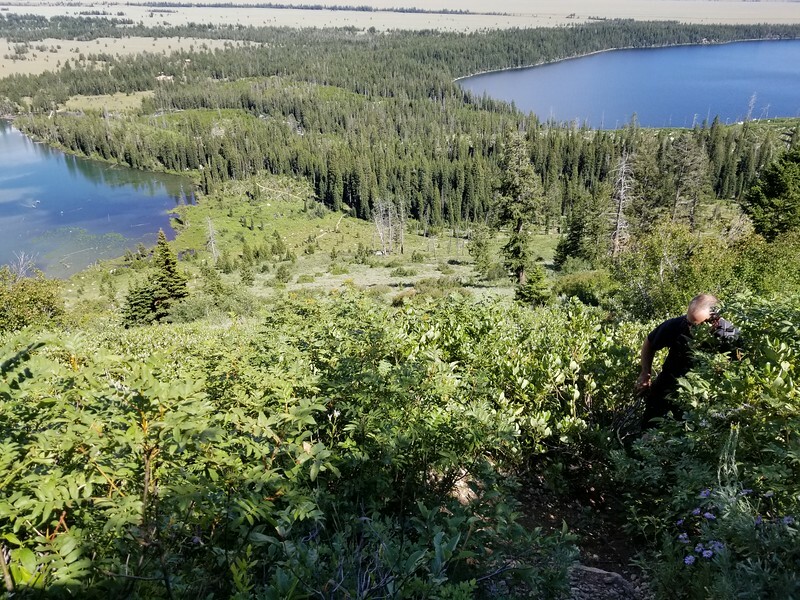 So we headed down and shortly got back to our packs and headed over the saddle and down the rough, steep, narrow trail down to the lake. It was kind of a slow trip down since it was pretty tough. 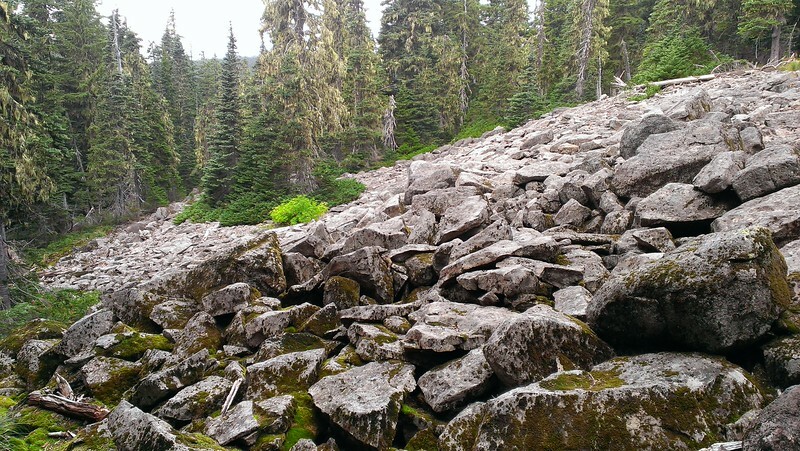 Once we got down, we then had to make our way across a difficult boulder field and then across the logjam at the outlet of the lake (it was a LOT harder than it looks – those rocks are HUGE, and pretty steep). We set up camp and were both hungry so we made dinner and then cleaned up. By that time it was starting to get dusky and chilly, so we buttoned up the campsite for the night, hung our food and crawled into the tent. It got cool overnight, but I don’t think it got as cold as was predicted (34 degrees). When we woke in the morning, it was foggy, which I’m thinking might have kept some heat in to keep it a little warmer. We got up, made breakfast and then packed up and headed back up that horrible trail. I had to stop 3 times to take layers off – I was getting too hot! We made good time on the way back up and arrived at the truck about 11am – shortly after we got there, it started lightly raining – the first rain we had on the trip. We changed our clothes for the long drive back home and packed up the truck and headed out. We had 309 miles and about 6 and half hours of driving (according to Google). We stopped somewhere north of Seattle for lunch and then stopped in north Vancouver for dinner, finally arriving home about 7pm. It was a very short trip, but it was pretty incredible, and I was very happy to be able to take the trip with Carly. 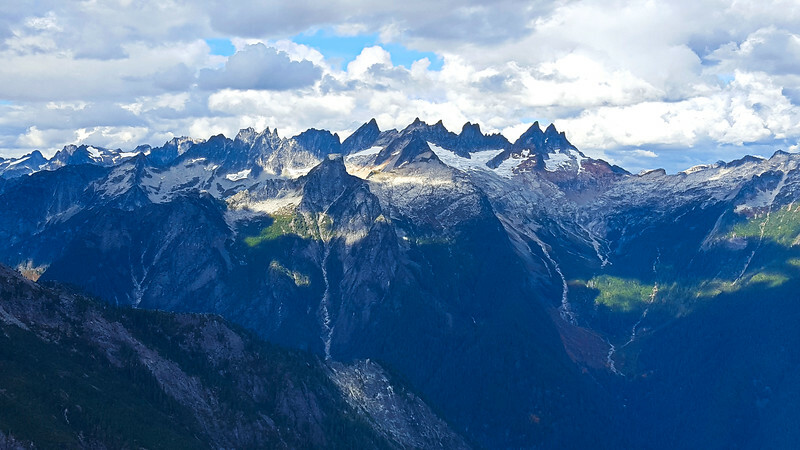 I hope we can plan a trip next year – I really enjoy our father/daughter trips – I assume it will probably be somewhere in the same neighborhood since she really likes the North Cascades. 2 – Meet some of Rondy’s family at Oak Grove to get a tour of the buildings and hear about what it was like to live there 50 years ago. 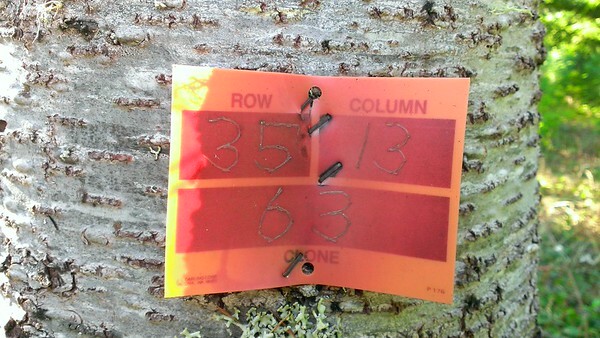 We ended up finding what seemed like tread in this area and it led down to 4630. 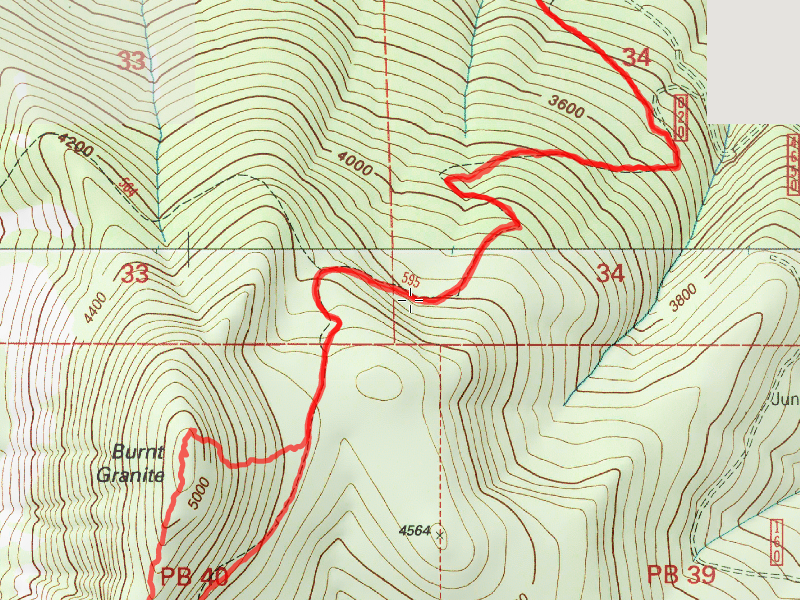 We were running out of time, so we will have to come back and scope out the 3 areas that were kind of fuzzy – right below the road – the section before the spur road (180 spur) and then the last section above 4630. Unfortunately, there has been even more vandalism – now there is graffiti in at least a couple of the buildings. In Rondy’s old house, the chimney has been “tagged” and in the warehouse building, the walls are completely covered in graffiti now. It is very sad what is becoming of this place – it holds such history. I thought I had photos of all the houses and buildings from our prior trip, but I only took a couple of photos – I will have to take more photos at some other time to preserve what is left of these buildings. We also found out that the the meadow to the east was where the horses and mules grazed while they were there. They were taken somewhere lower in the winter, but spring, summer and fall they were there. Actually, most of the summer they were probably out on the trail, supplying the lookouts. In addition, we identified which of the 2 shop buildings was the sign shop (where all the cool signs were made) and which was just a shop. After touring all the buildings, we drove back up the road to locate the location of the old Collawash Ranger Station. 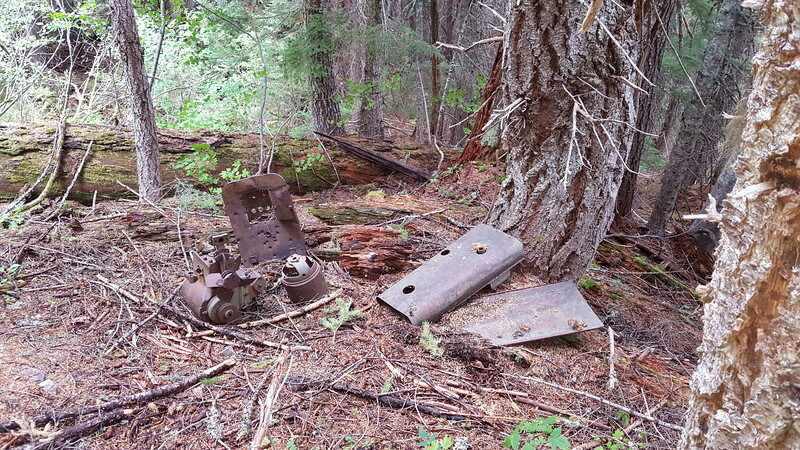 It was where I kind of thought it was – pretty much at the junction of the 4630 and 4631 roads – there is an open area in the woods where people now camp – that is where it used to be – just west of Silvertip (which used to be a logging camp). 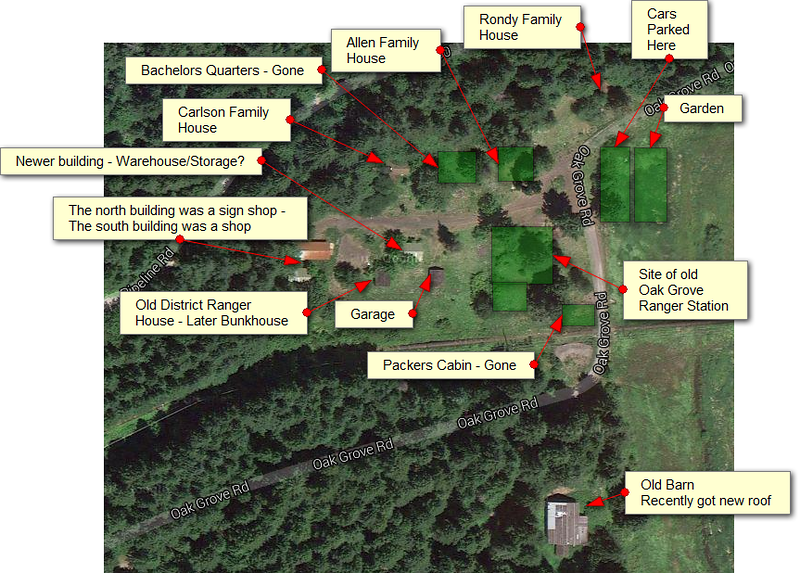 Once the Rippplebrook Ranger station was built, the Oak Grove and Collawash Ranger stations were combined in Ripplebrook and both of the others closed. At some point both buildings were destroyed. After locating that, we went back to our car and drove back up to get the Van and come home. A stop at Fearless made for a great end to a great day out in the woods with great people. Note: The map above was a hand rendered guess as to our route – I forgot my phone on this trip, so had no real GPS track. This trip was to explore some of the burned areas up road 45 that were burned as part of the 36 pit fire a couple of years ago. The road has not re-opened, so we walked across the bridge and walked up the road. 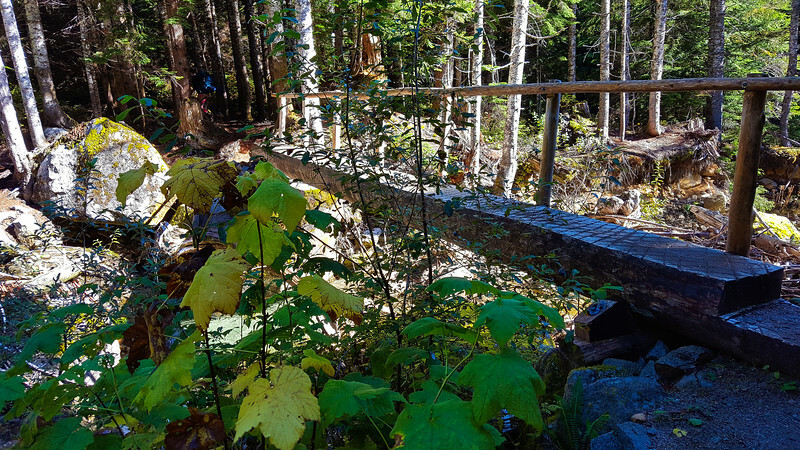 We weren’t quite sure what we were going to look for on this trip – one option was to explore portions of the old abandoned Memaloose trail, which still existed above (and below) road 45 before the fire. 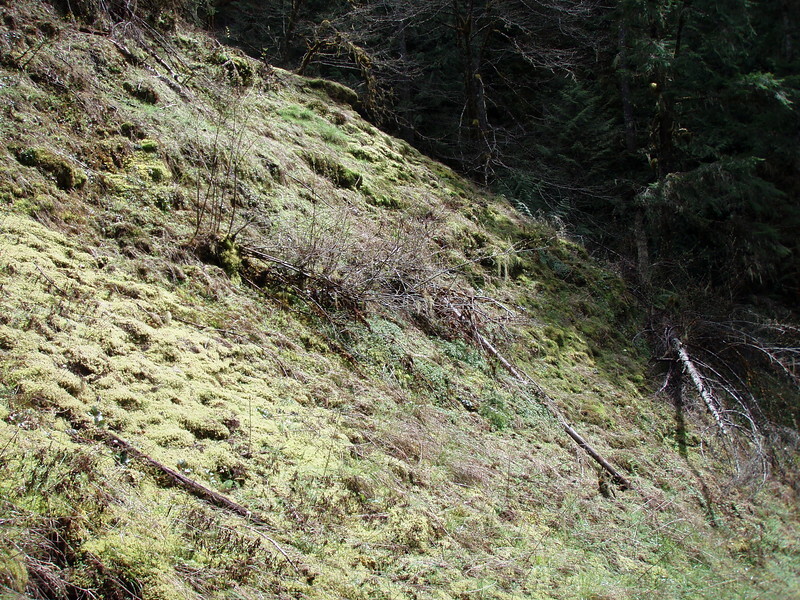 We crossed the Memaloose bridge and headed up the road, looking at the fire damage on the hillside above the road. We also noticed that all the culverts on the road had been replaced. 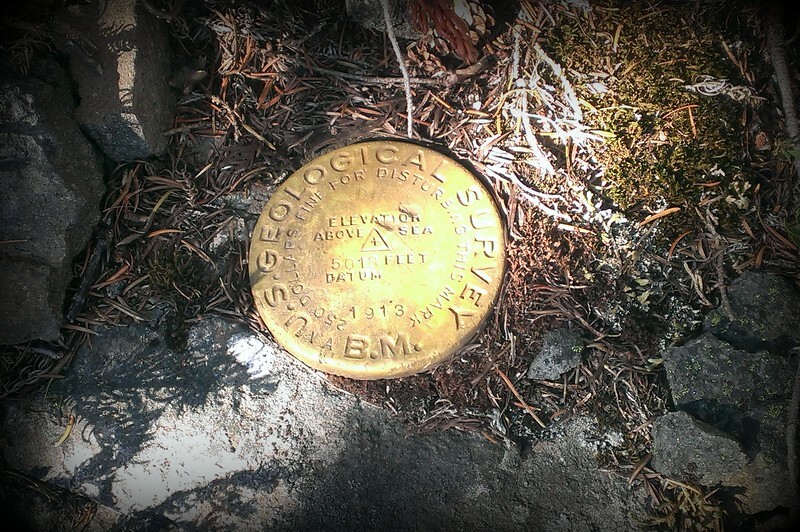 A new benchmark at the BLM property boundary appears to have been installed as well. 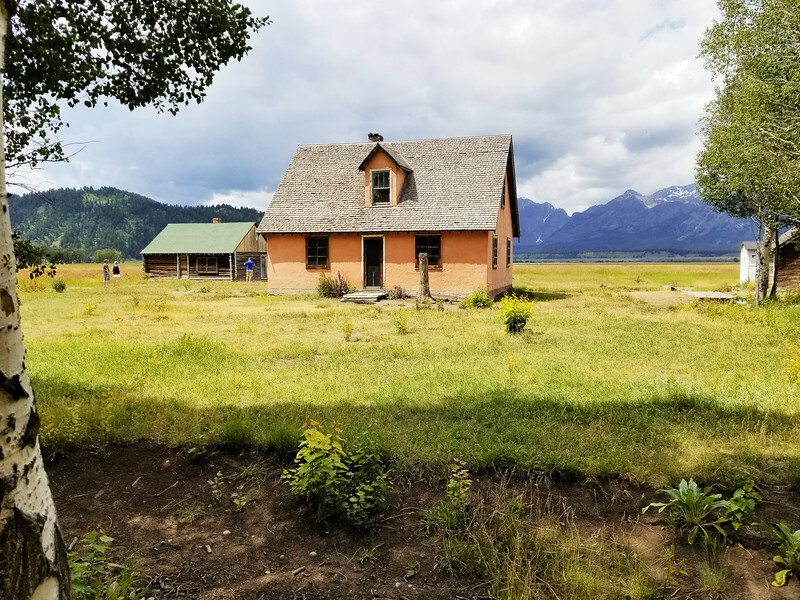 I looked for the place where the Memaloose trail took off above the road, however nothing looked familiar to me – I had only been on it one time. 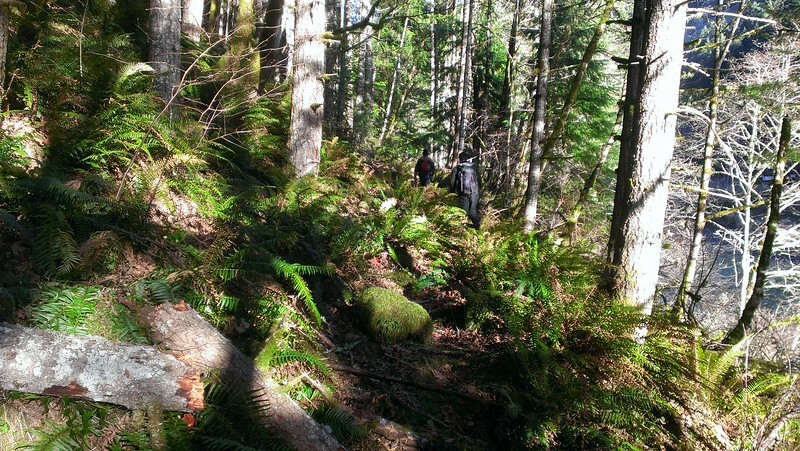 We ended up walking up to the old borrow pit and looking around for trail there. 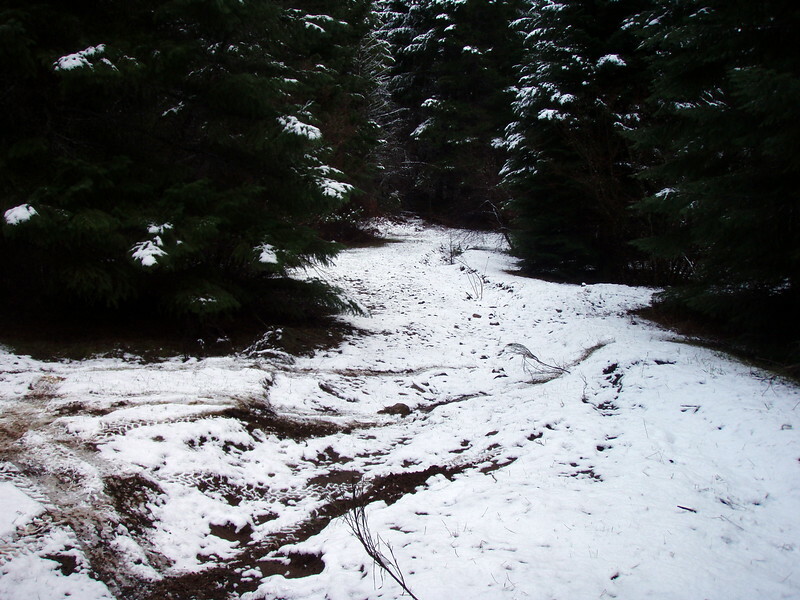 We think Kirk found some trail on the ridge at the back side of the borrow pit. Since we were not having much luck with that trail, we decided to go down and explore the old waterworks. We hadn’t been there in several years and wanted to see what things looked like after the fire. 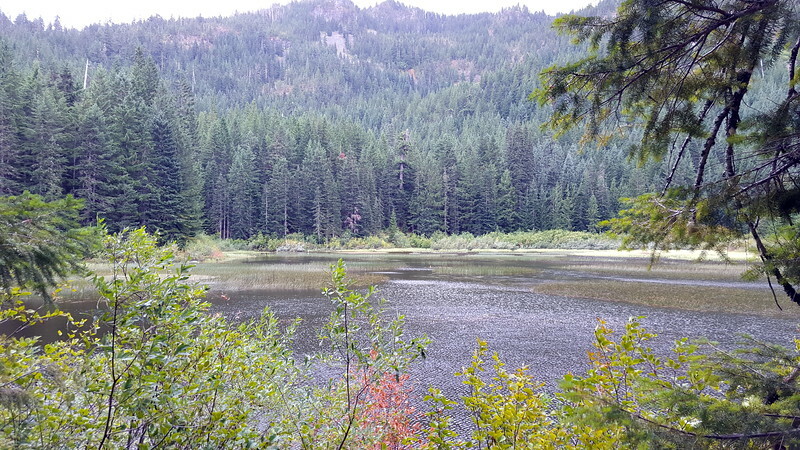 So, we headed across the road, down the old decommissioned road to the “trailhead” – and down the hill to Memaloose creek. 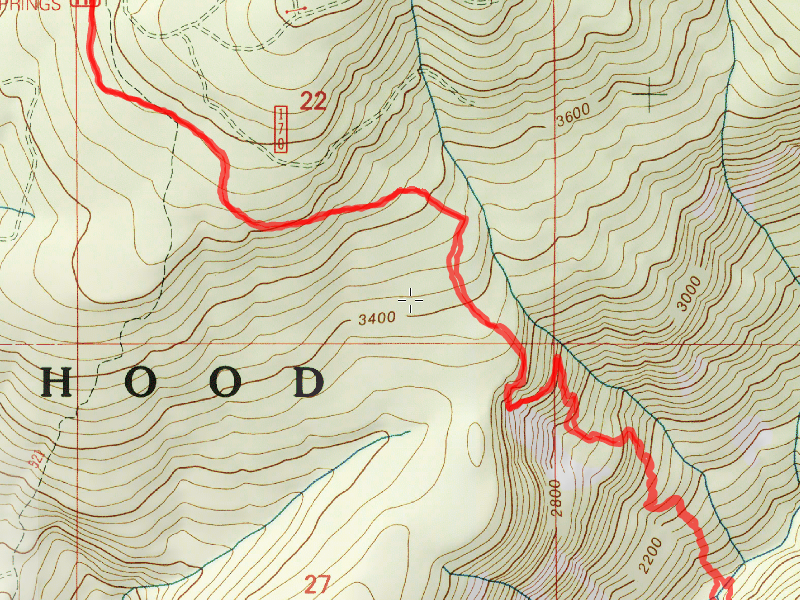 The route has been well traveled since we were last there, and someone has tied ropes down the steep traverse down to Memaloose creek. There are also some new slides which have made things a bit more challenging, but still not too bad. 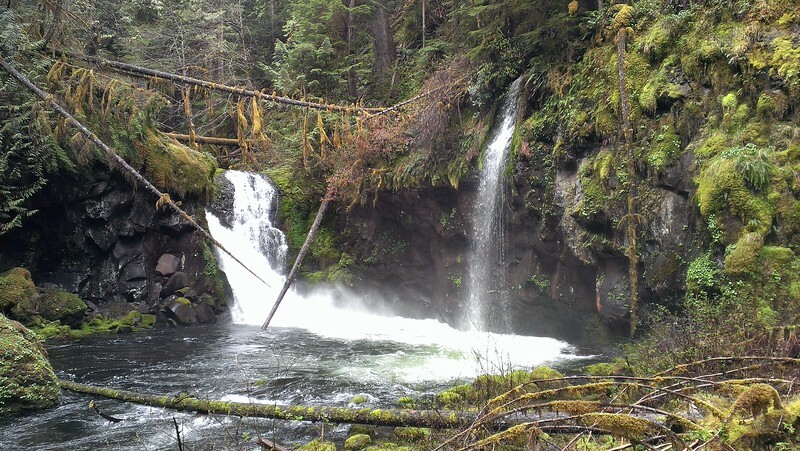 We opted not to go down to see Memaloose falls, and continued down the old road to the bridge at the confluence of Memaloose and the South Fork. It is amazing how much more you can see now that things have burned out. Zack noticed some very interesting rock formations on the east side of the South Fork at the confluence. You could never see things like that before. 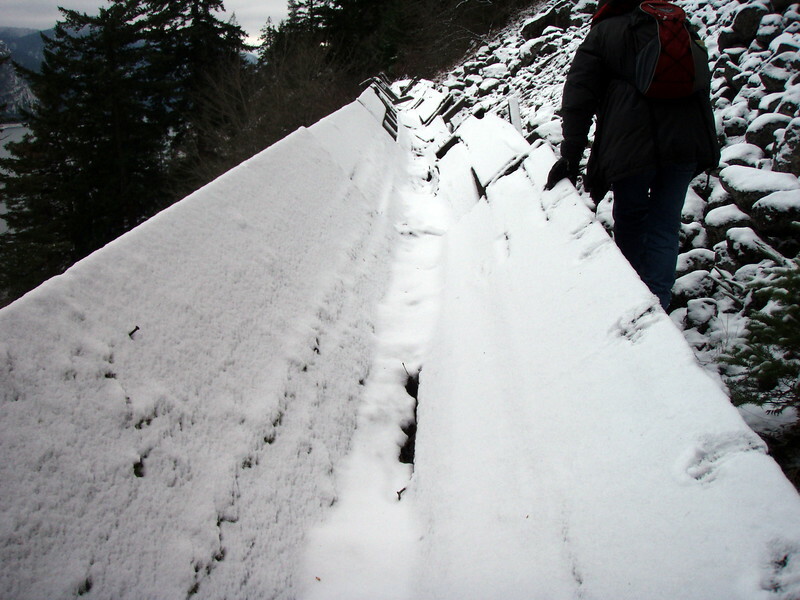 We also noticed a very long rock retaining wall at the confluence – where all the valves were – we had seen teh valves before, but never the extent of this rock wall – Kirk thinks there might have been some sort of shed roof over it at some point. We continued up river to the big tunnels and the tall falls. 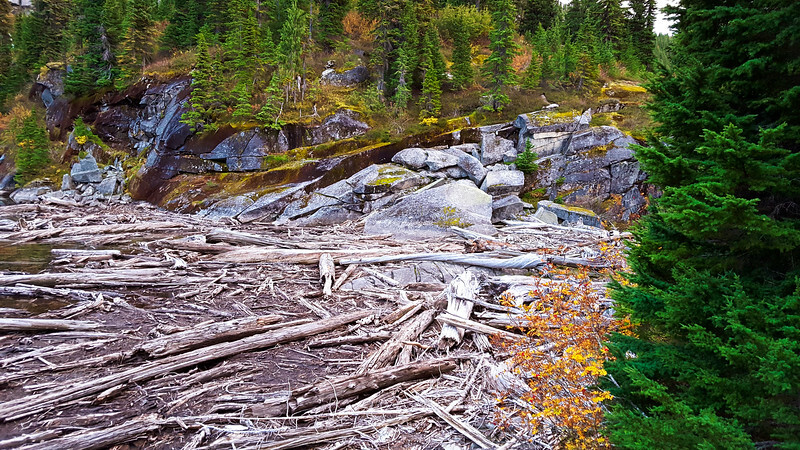 Now that a lot of brush has been cleared, you can get a good look at the falls from various locations – before the only way to see the whole falls was to go down to river level. 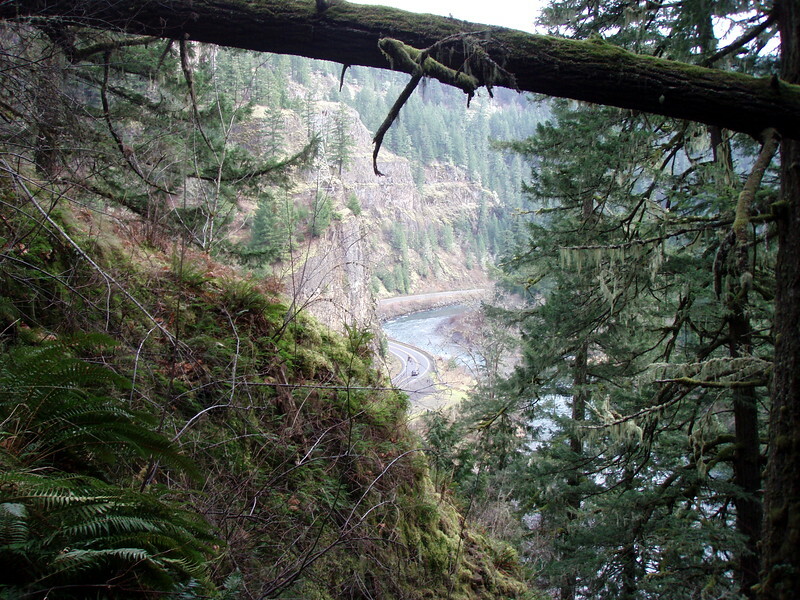 We got to the “bridge of death” and made our way around the bypass “trail” and then headed up thru the long tunnels. 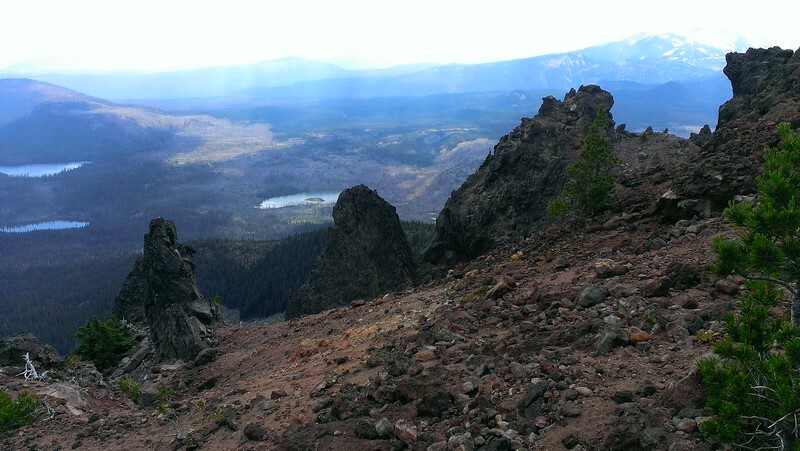 We popped out up on top – there wasn’t as much burn damage up there as I would have thought, though. It had started raining, and it was a good point for lunch, so we went back into the tunnel to eat lunch. After eating lunch, we headed back down river. As we headed down, the sun actually came out! It was nice for the rain to stop – the sun felt good. 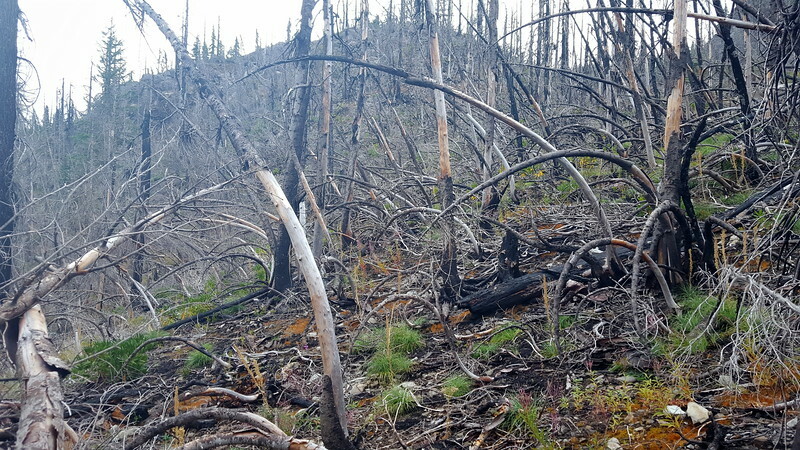 The fireline appears to have been right on that old road most of the way – above the road it was burned, but below it was mostly unburned – there were some big trees downhill from the road that were untouched. 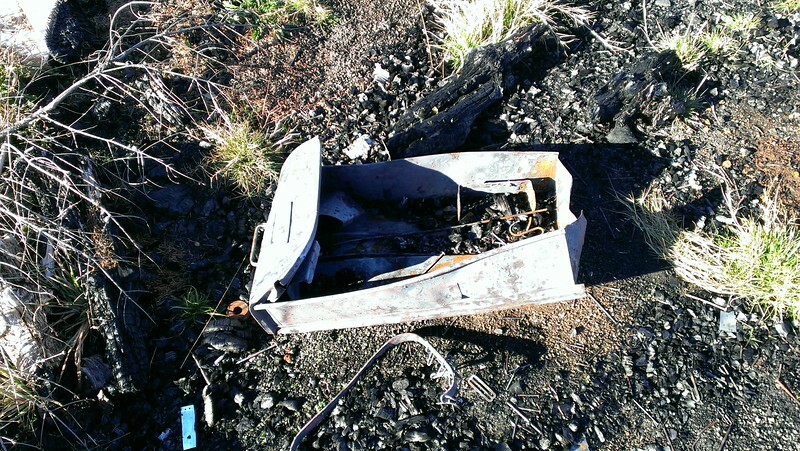 We made it back to the area of all the buildings and started looking for the old stove that I had seen someone post. 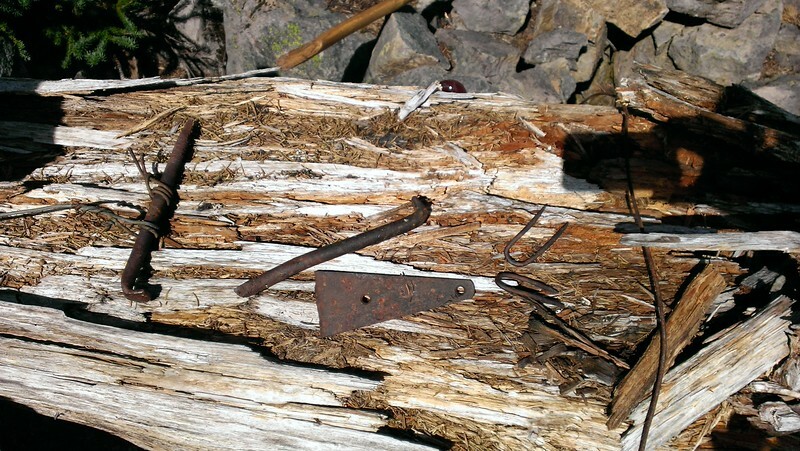 Zack found it – it appears to have been essentially a dump site for this little encampment. There were a couple of old lawn mowers, the old cookstove, a couple of old doors from old cars (model A’s?) and just a bunch of junk. 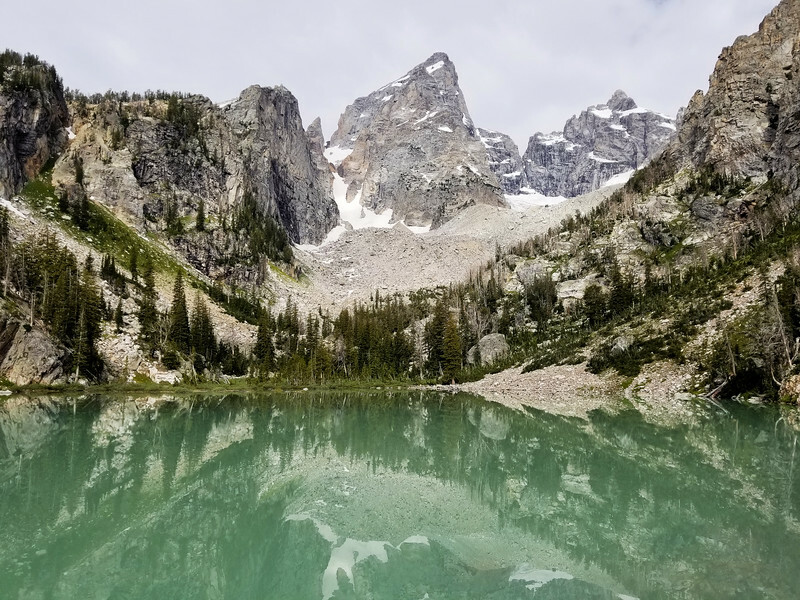 After looking at that for a bit, we headed over to the South Fork to see if we could find a tree to cross on – otherwise we would be heading back the way we came. 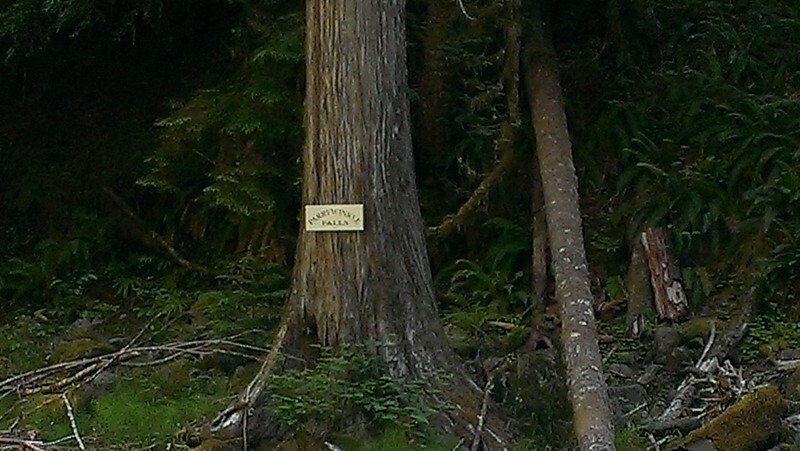 Fortunately for us, there was a relatively new cedar tree that had come down over the river – Zack shimmied across and cut off the branches on the top so it was a relatively easy way to cross the river. We made it over to the east side and then started looking for the Memaloose trail that headed back up to the 45 road. 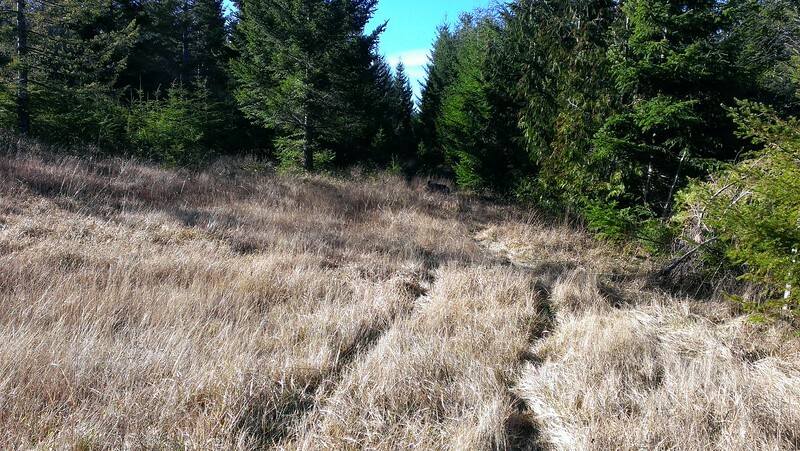 Shortly we found some flagging and found the tread – still rather faint, but followable. This hillside was burned pretty heavily and there will be a LOT of snags coming down in the future years. 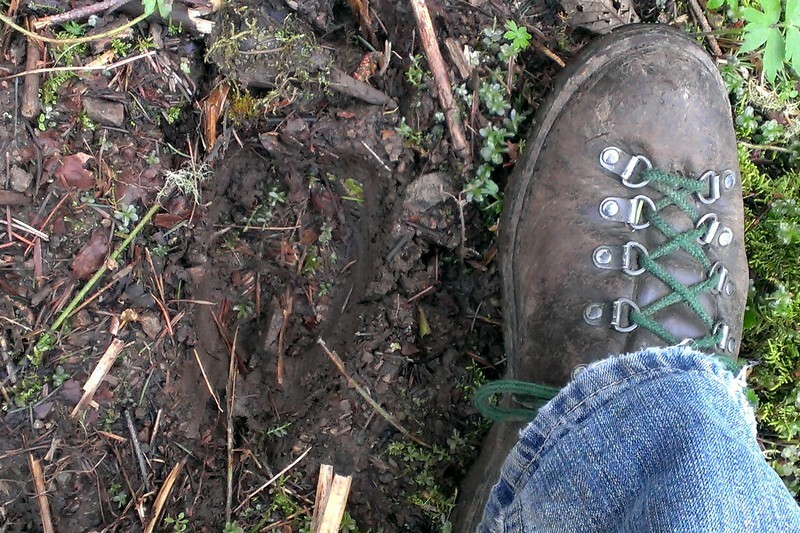 As we made our way up the hill, you could see new brush growing in the tread. This area is very open now, so it getting lots of sunlight. We made it back up to the road, and then headed back down to the truck. A great day in the woods with a couple of good friends. We stopped at Fearless for dinner and met up with some other friends. This was kind of an unplanned hike. I had planned to stay home today and do some things around the house. Zack texted me about 7:30 and asked if I was going anywhere today. After a few back and forth texts, we decided to meet at 9 and head out. 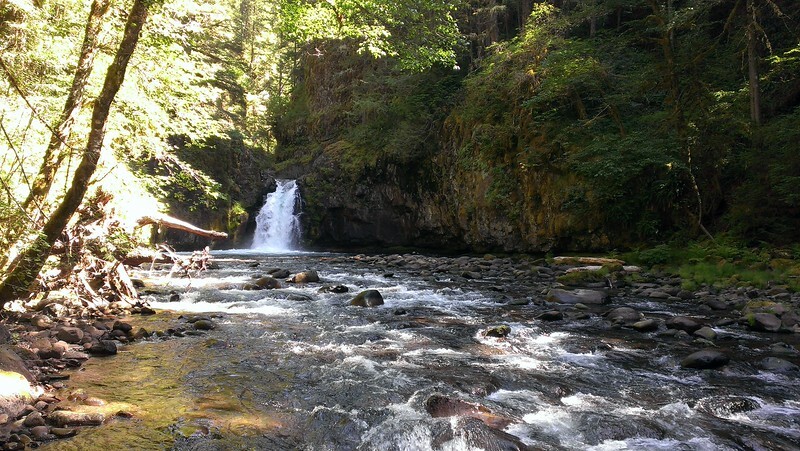 When he got here, we decided to head up to Eagle Creek on the Clackamas – I hadn’t been there since they had done some logging at the trailhead, and on a previous trip he had found (and marked) what he thought was a trail junction down the trail a ways. Sounded like a good place to go on a rainy day after a long, stressful week. These were obviously man made, not natural, so we wandered around trying to see if we could find more, or maybe what they were part of. 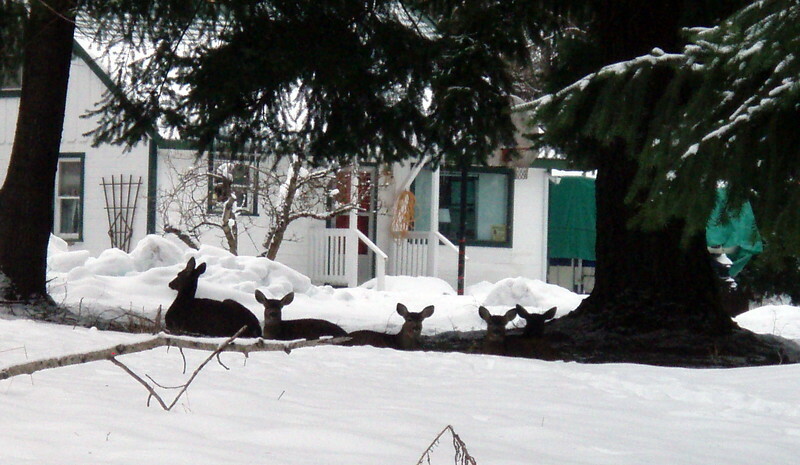 We thought maybe they were part of a bridge across the nearby unnamed creek, but could not find a clear crossing point. 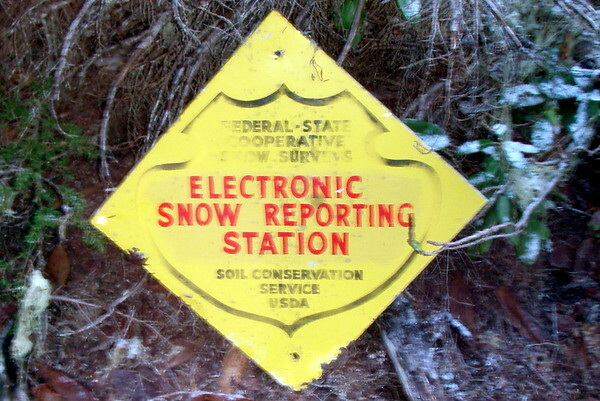 We continued poking around and then I came across this old sign laying on the ground! We were postulating that these might have been “hitching posts” to tie horses to – they obviously had some sort of cross brace on them at one point in time. We ended up finding 5 sets of them in the area. 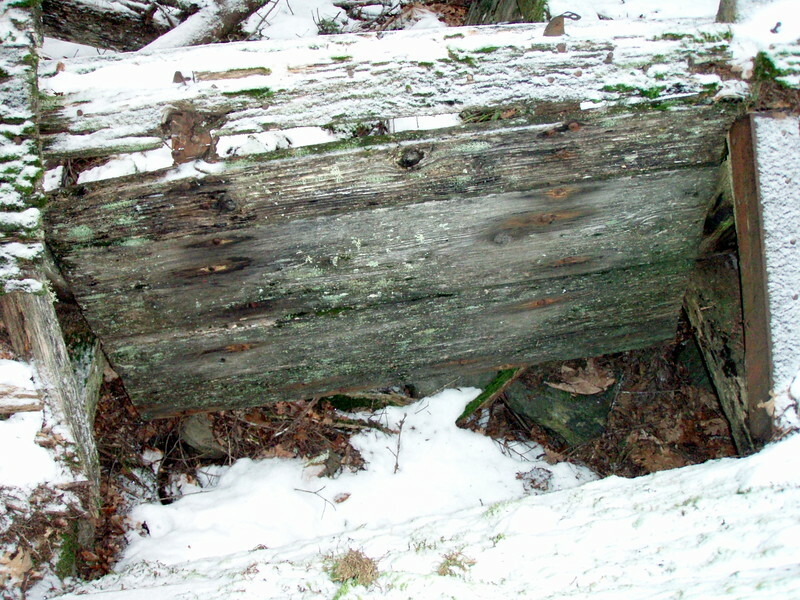 These looked to be remnants of a picnic table – the notches were at an angle that would match what you’d see on a picnic table and there were some longer boards like you would have for the top. 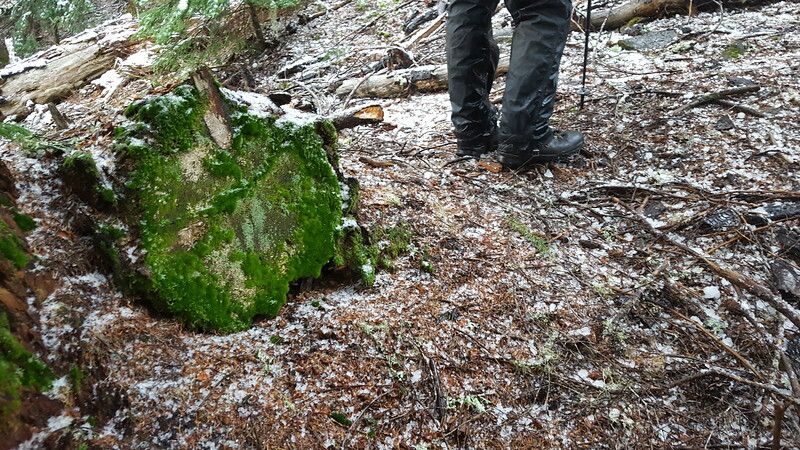 We continued searching the area for a while, looking for more artifacts, but other than some more cut logs, didn’t really find anything else – but what we found was quite enough! We headed back down to the trail to find a spot for lunch. 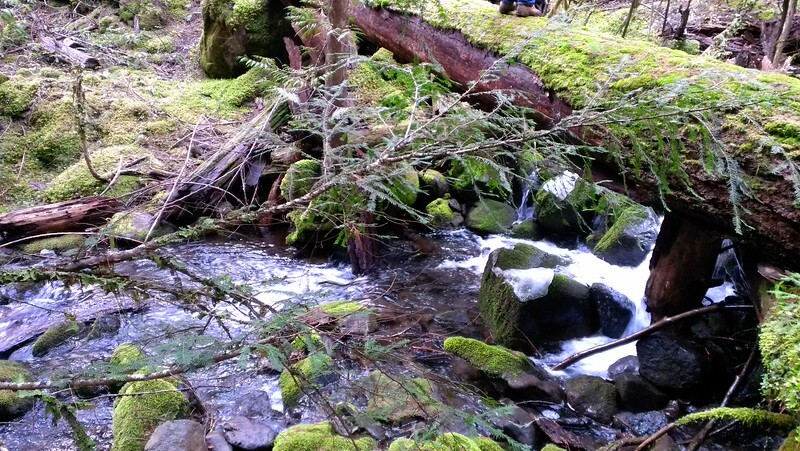 We stopped at a spot next to the creek and ate our (late) lunch. We then headed back down the trail to the truck. We made really good time on the way back, just as we had on the way in. The weather alternated between almost sunny, drizzly and rainy as it had all day long. I was a bit worried we would not make it back out by dark, but we got back to the truck before 4. We headed back to Estacada for a celebratory strong scotch ale at Fearless and then headed home. For an unexpected hike, this was an AWESOME day! Thanks, Zack for pulling me out of the house! This hike was another short day to get Bodie out hiking while he still can. Don’t know how many more hikes he will be able to do. 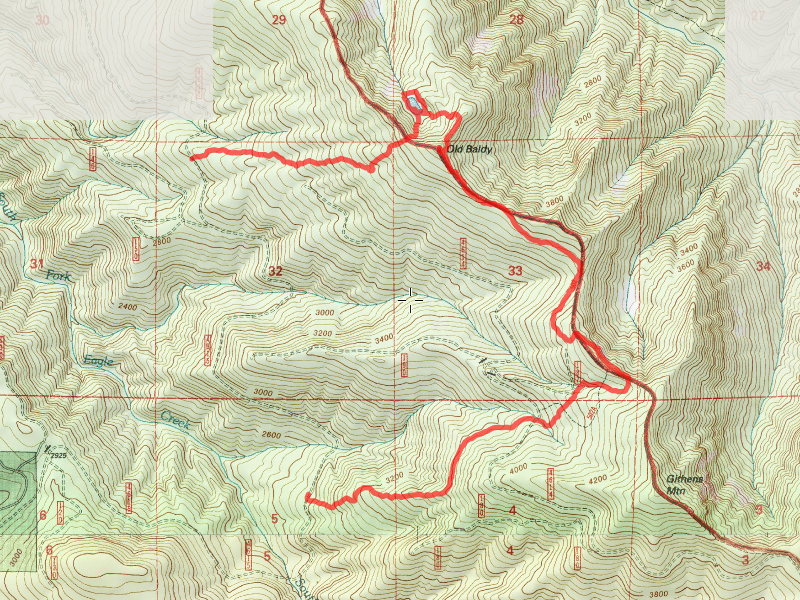 I decided on Cottonwood Meadows since it seemed like a relatively flat and easy trail to do, and it wasn’t too long. The cross country part was a little tough on him, but he did really good all the way. 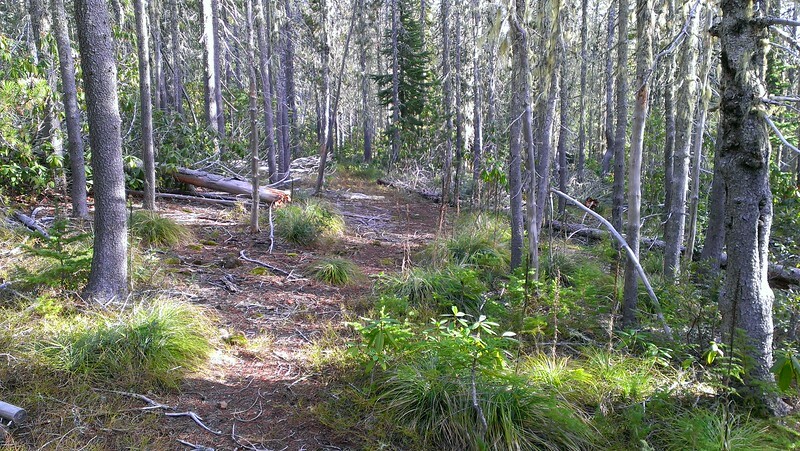 In addition, this is the perfect time to visit this trail, since the meadows are all dried up and the bugs are all gone. I had not been here in several years (looks like it has been 7 years!!!! ), and wanted to go back. 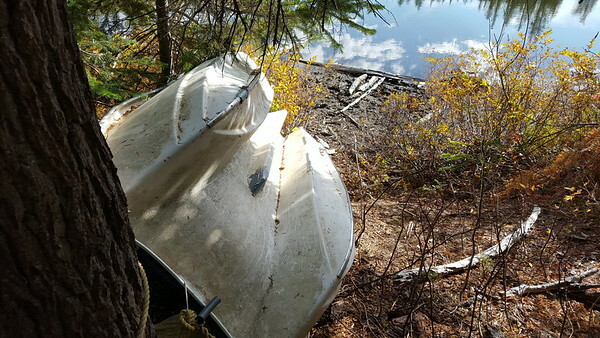 I can’t believe that someone drug a boat all the way into this lake. 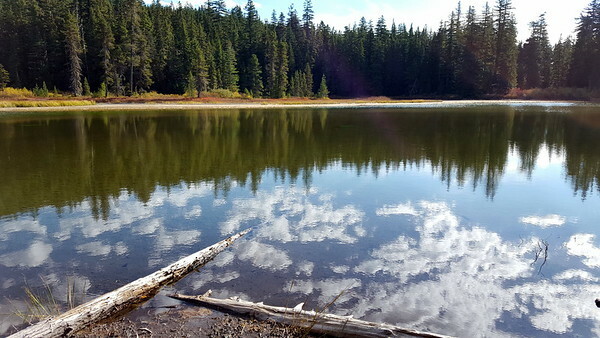 I can’t imagine there are any fish in this lake – it is very shallow. We wandered down the trail to the end of the official trail at the 5830-240 spur road. 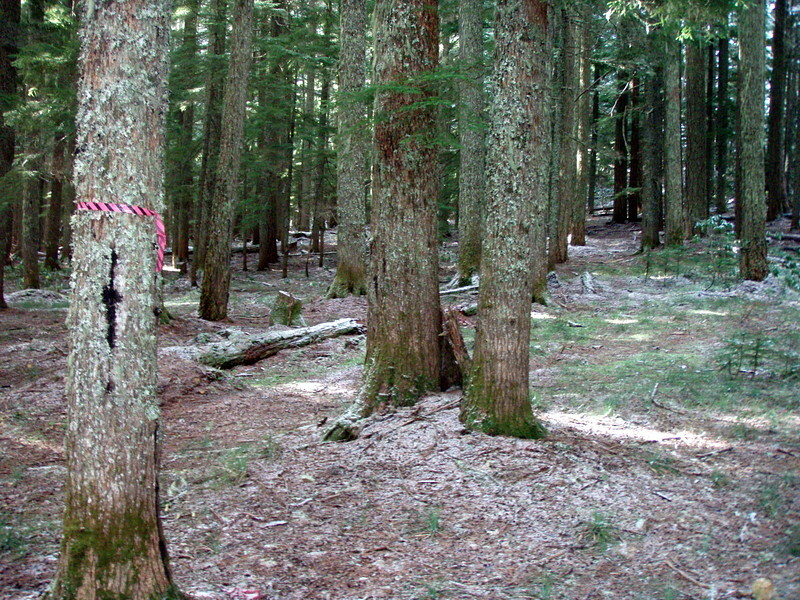 From here, you must go cross country through an old clearcut (that isn’t recovering well) to get to the lower section of trail. 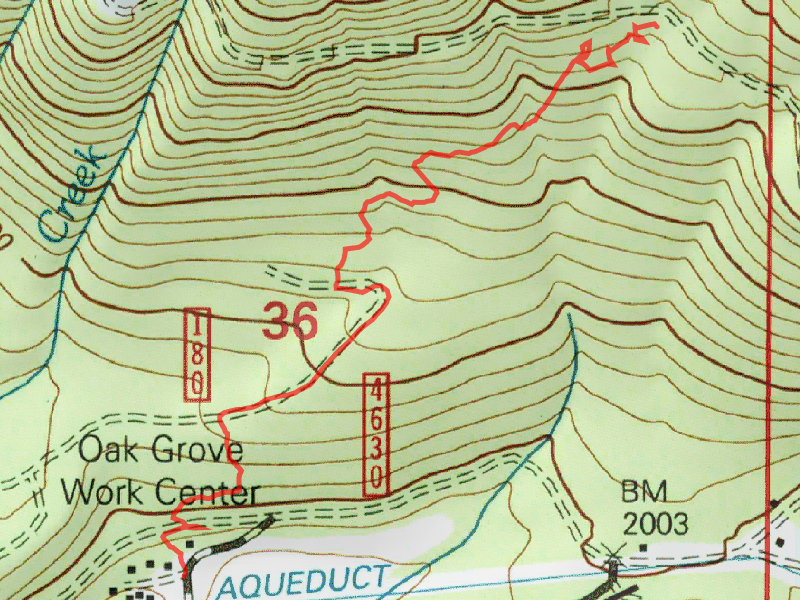 Basically, you need to go from the 5830-240 spur to the 5830-260 spur road thru the old clearcut. 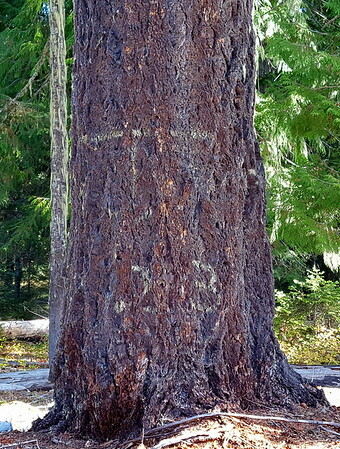 About in the middle of the clearcut, right at the edge, we found this tree that had something painted/written on it, but we couldn’t make it out. 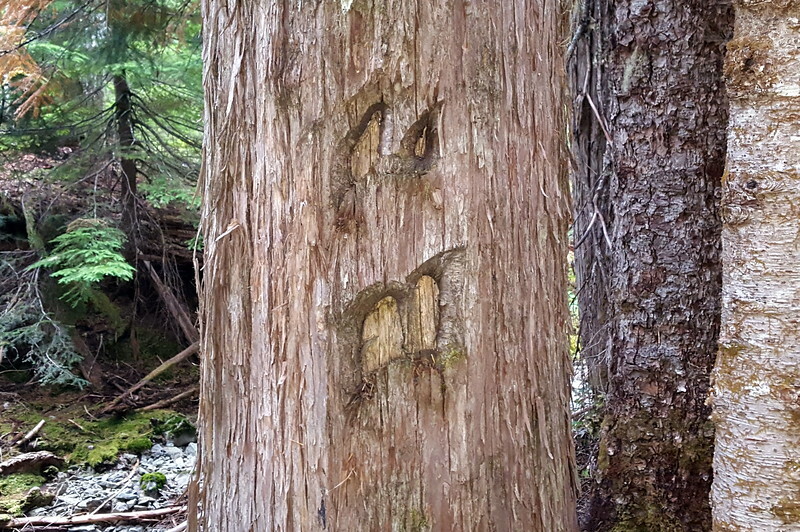 What does this tree say? 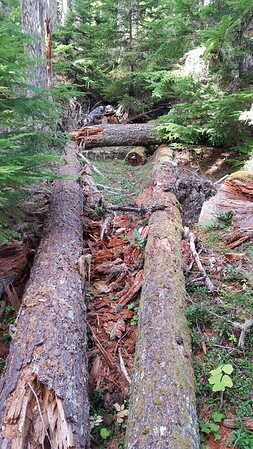 There were only about 10-12 trees down on the lower section – less than the upper section. The tread down there is REALLY good! 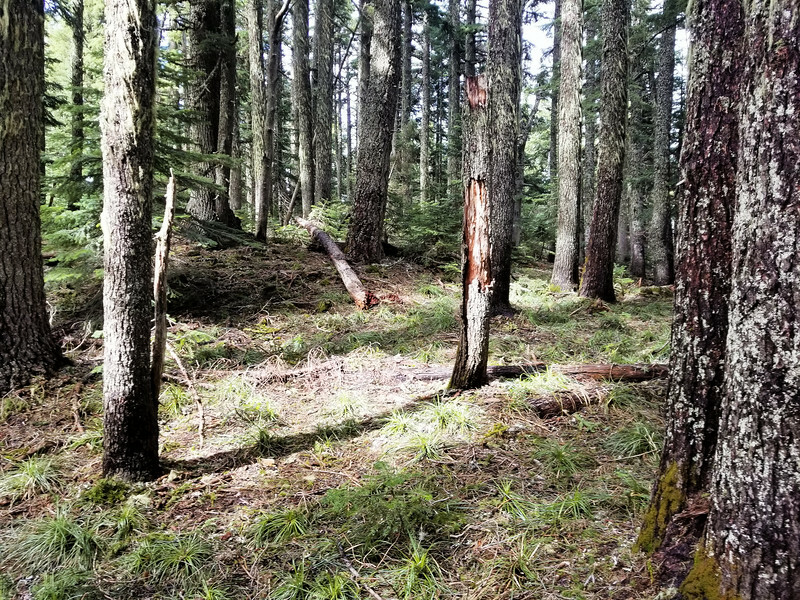 We continued back up the trail – I’m sure I took a different route thru the clearcut on the way back, but ended up close to where we were started. Got back up to the truck pretty quickly and then headed home. A very nice, peaceful, pleasant day in the woods. 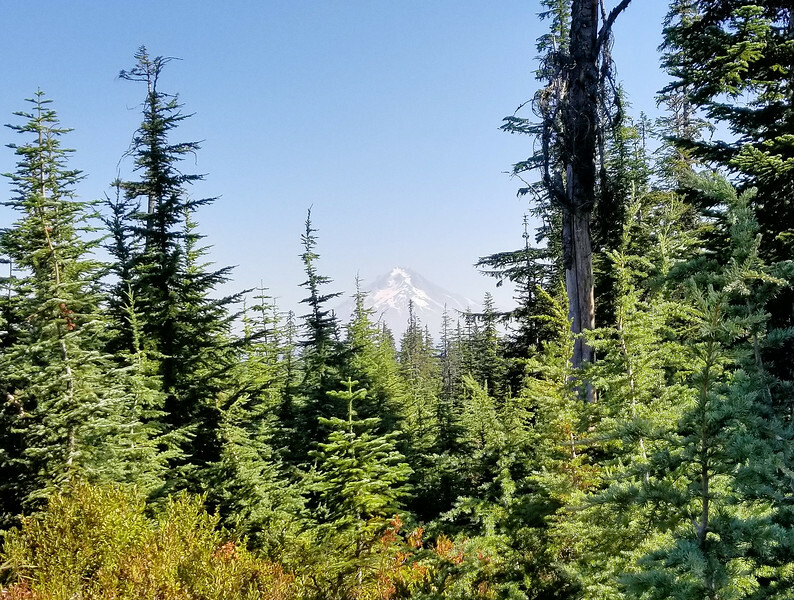 With all the turmoil the last week (coming back to work after vacation, and Carly leaving for Mozambique), a hike sounded like just what the doctor ordered. It has been over 5 months since Bodie’s diagnosis of a brain tumor and he is still doing pretty good. I thought today would be a good day to take him out hiking – I don’t know how much longer he will be able to go, and he loves it, so I took a look at trails I’ve wanted to hike (or re-hike) and came up with hiking Baty Butte with the possibility of hiking to the top of the Butte to check out the location of the old lookout. This seemed like a good choice since there isn’t a ton of elevation and we could make it as long (or short) as he needed to, turning around at any point. We headed out a little later than normal – it was kind of foggy and looked like rain – but that was supposed to clear up and be partly sunny in the afternoon. It has been several years since I’ve been here, and on the way up the 7010 road, it was obvious that thinning has been going on for a while. 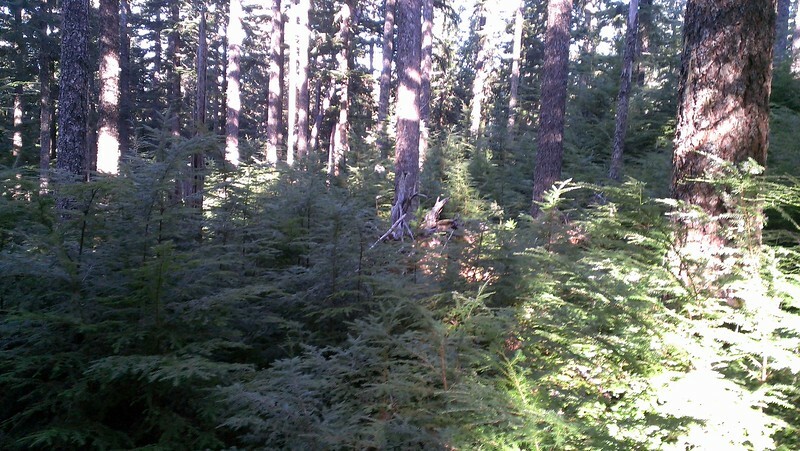 The forest looked really good where they had thinned. 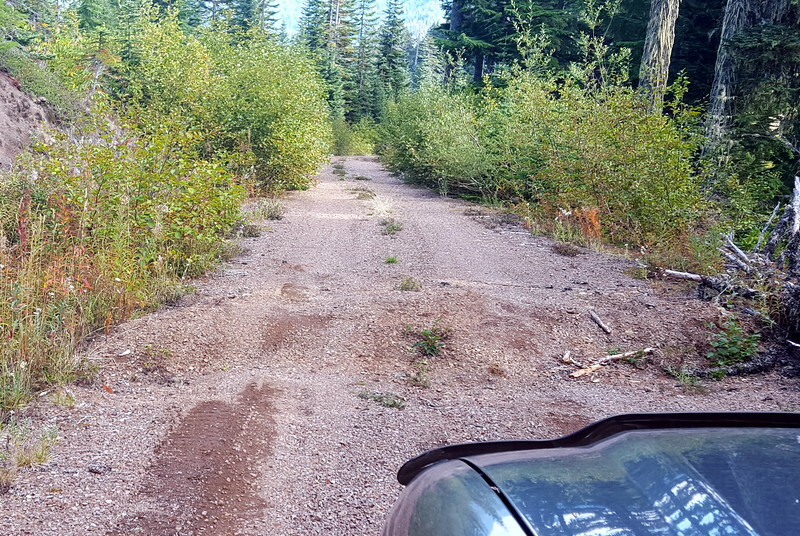 The road up to the point where the thinning stops was in great shape (obviously because of the thinning projects). 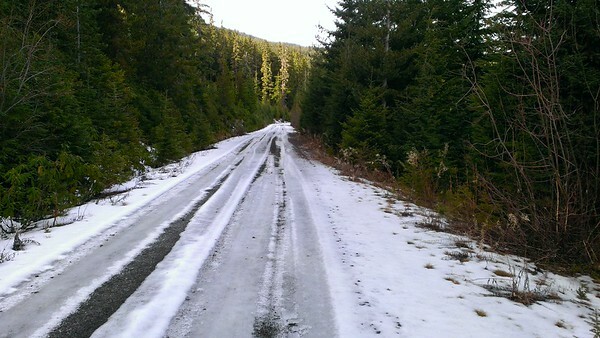 Beyond that, the road deteriorated a bit – got narrower and a little rougher, but wasn’t bad. You have to take these VERY slowly as some of them are VERY deep. I’m not sure a passenger car could navigate some of these. We arrived at the trailhead and headed down the trail. 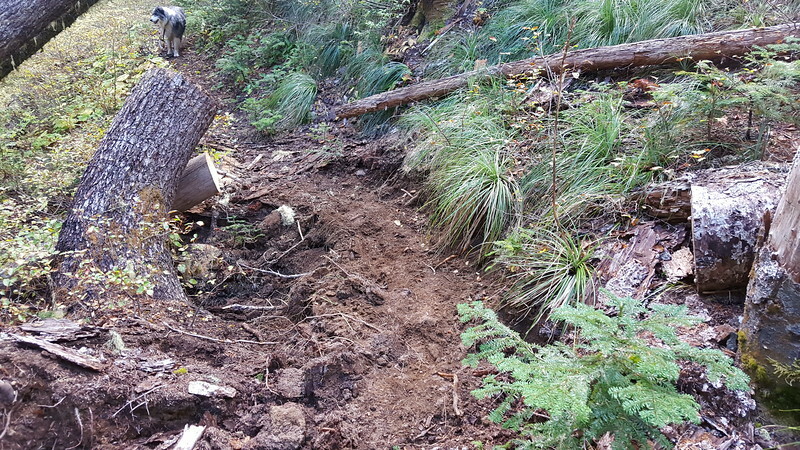 Very quickly, we found some VERY recent trail maintenance! A big thank you to whoever did this work. 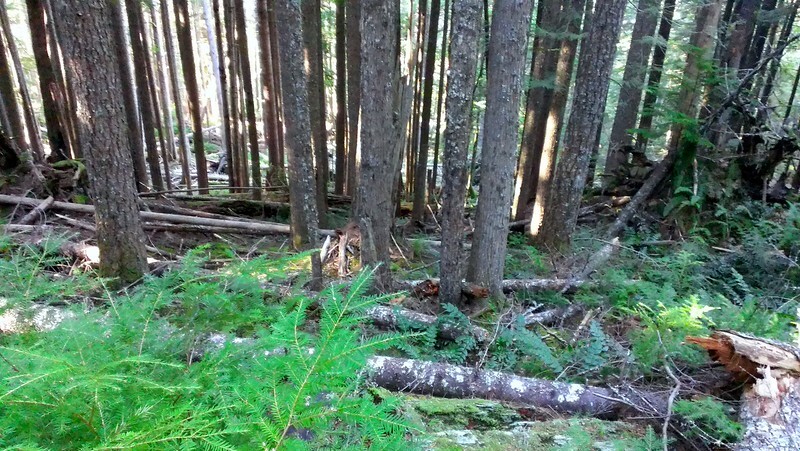 Both logging and brushing were done VERY recently. 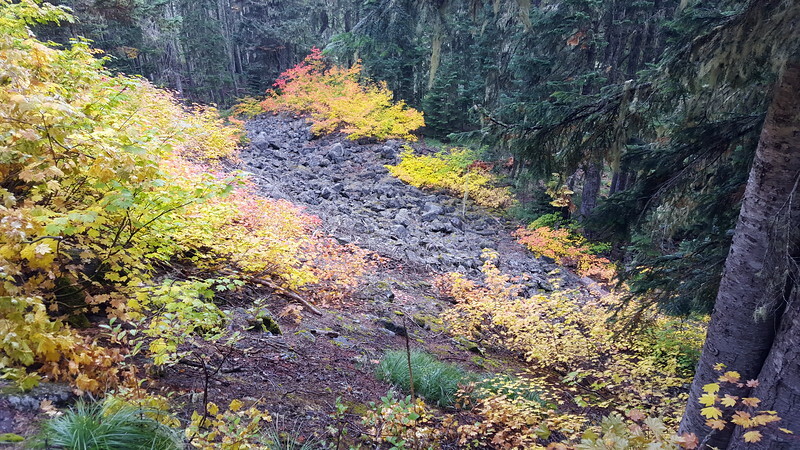 As we proceeded down the trail, we came to the first rockslide and found brilliant fluorescent fall colors – this photo doesn’t even begin to do it justice – the colors were so vibrant – it was amazing! 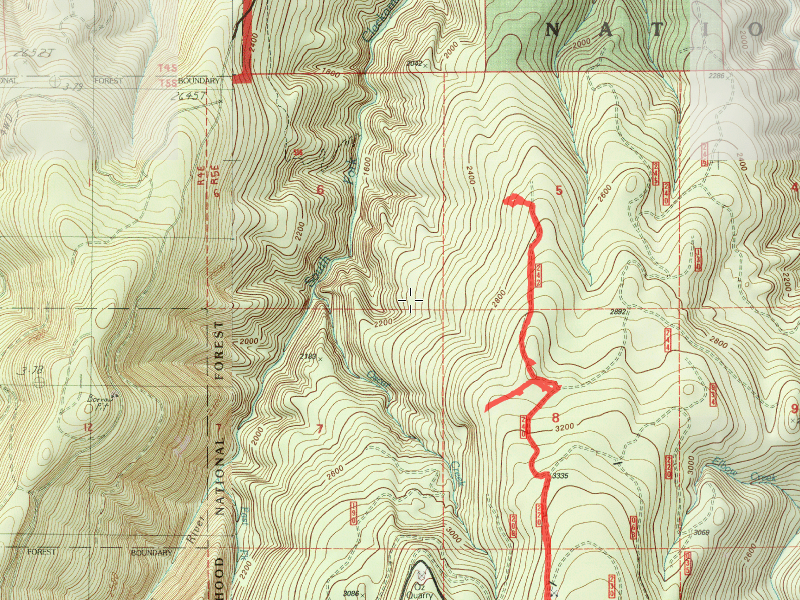 We came to the junction and headed north/east – the goal was to get to the top of Baty Butte and have lunch there. 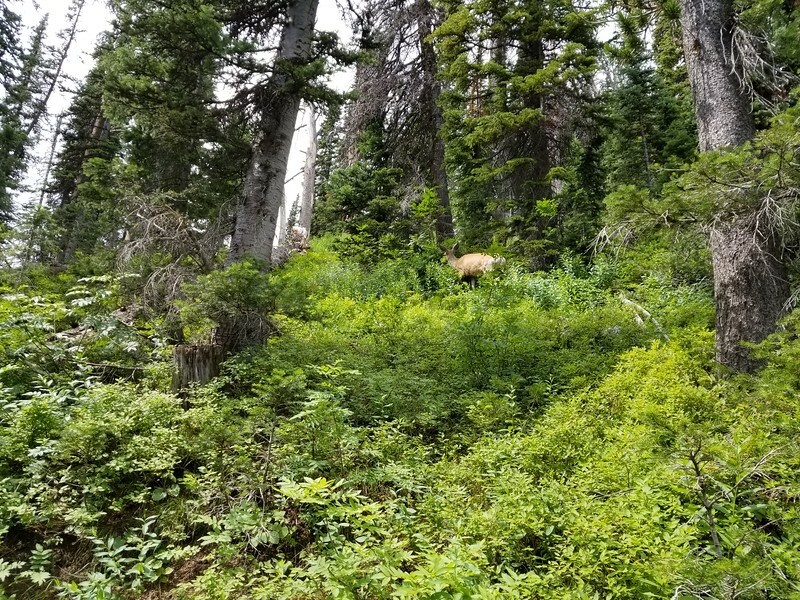 On the way, I met a bow hunter (he was VERY quiet-didn’t even know he was there until we were right on top of him) and later we met another couple – the husband had a bow but said he really wasn’t hunting. We finally found the real trail again and headed southwest down the trail. 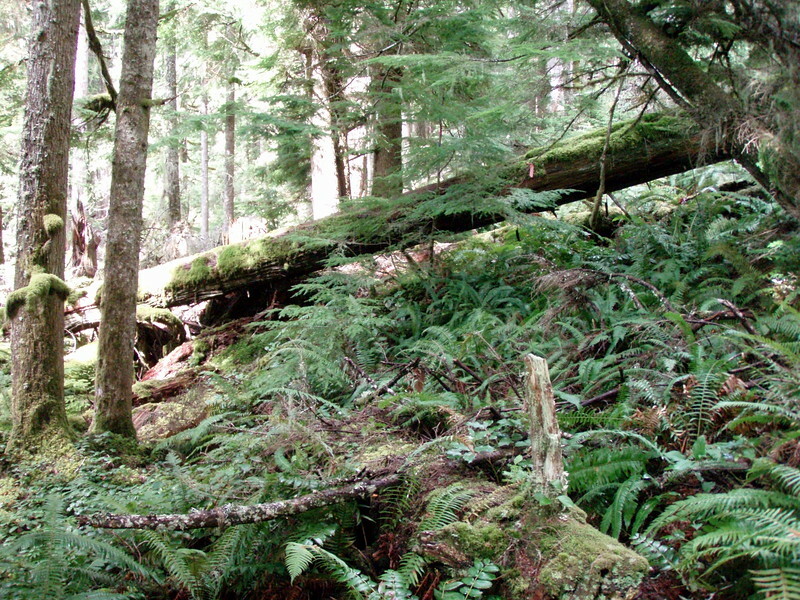 When we got to the southern part of the trail, it was obvious it hadn’t had much activity. 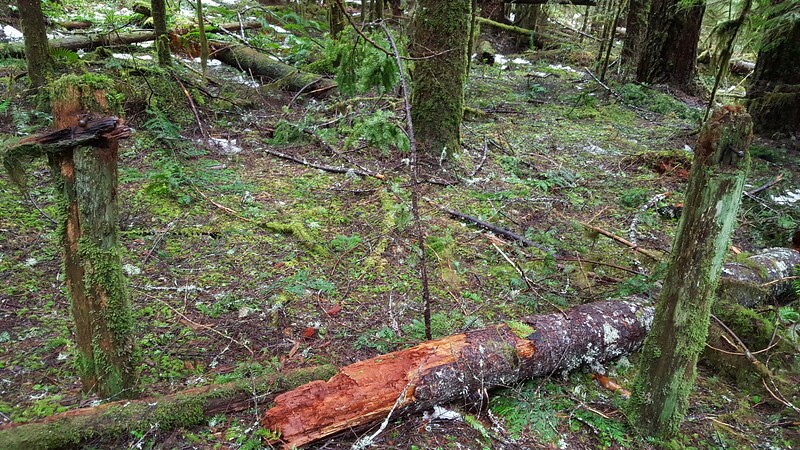 It was VERY brushy in places and had quite a bit of blowdown. 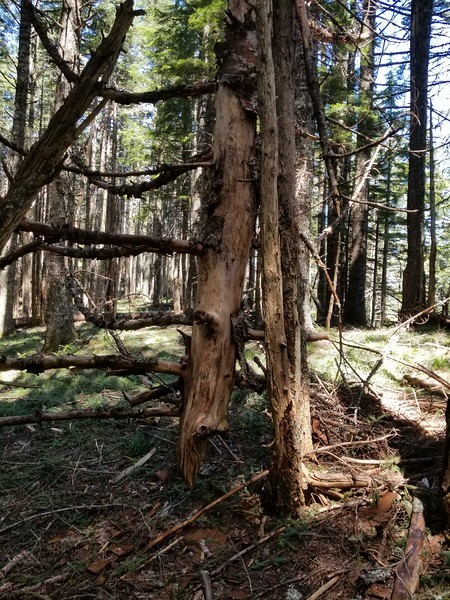 We ended up hiking about a mile south of the junction, and in that mile, we counted about 40 trees down – and some spots in the trail are almost completely grown over with brush. This portion of the trail needs a bit of love. 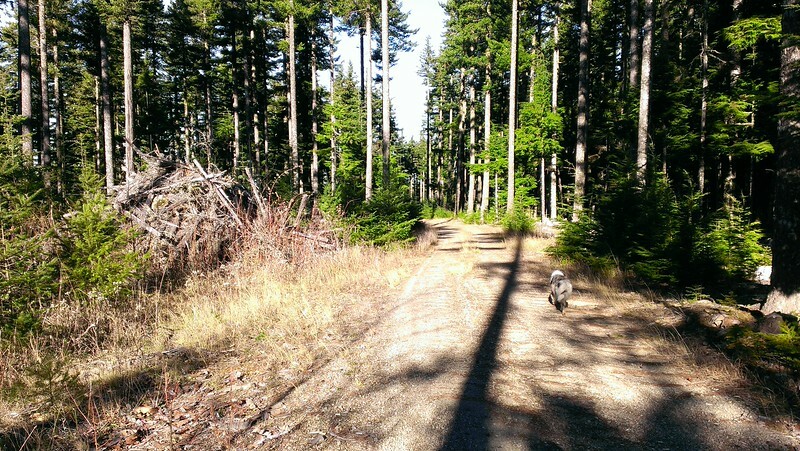 We walked down the trail for about a mile and I could tell Bodie was getting tired. We were nearing our turnaround time anyway, so I decided to turn around and come back. I think it was just about the perfect length for Bodie. Had we not expended so much time and energy trying to climb to the top of Baty Butte, we could have gone farther south, but I was glad I finally got to see the top of the Butte. A very nice and pleasant day in the woods. Today’s hike was going to be interesting due to the weather – we haven’t had any significant rainfall for almost 3 months now (except one really short intense storm about a month ago), and they were predicting a rather stormy, rainy weekend. I just wanted to get out in the woods! The weather ended up being much more cooperative than I had expected. 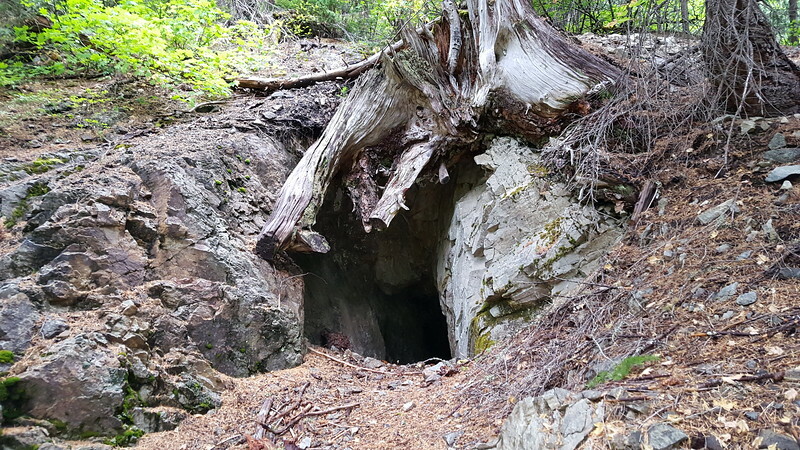 Zack and I talked about a few options, and decided to hike up to Pansy Lake to see if we could find the old mines up there, as well as some other artifacts from long ago. Zack also had an off trail lake he wanted to explore to see if there were any fish in it. He said it had been stocked with fish in 2011. We arrived at the trailhead a little before 10:00 and were surprised to see several other cars there – 2 of them were leaving as we got there, and 2 guys headed in just ahead of us. We figured we would see them later in the day. 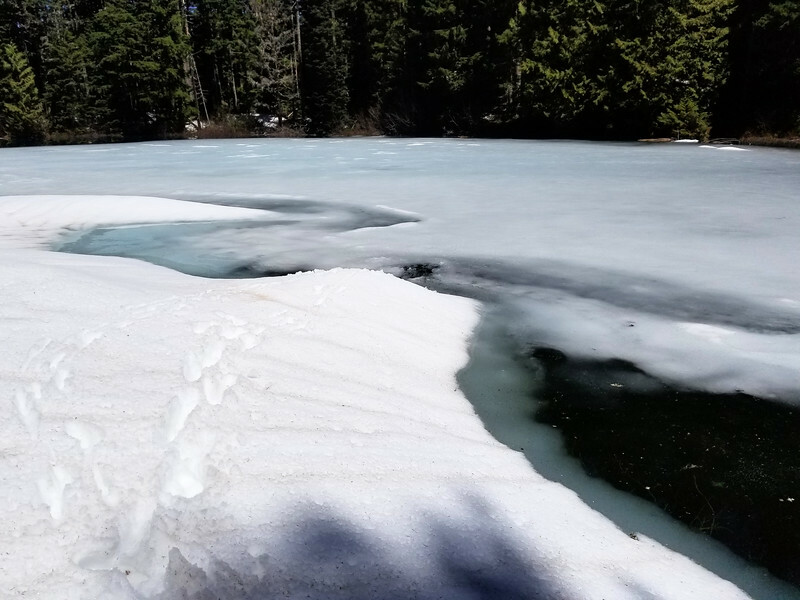 We also figured that some people were probably camped at Pansy Lake – that was an incorrect assumption – no one was camped at Pansy. Zack got out his fishing pole and tried some catch and release fishing. He got a strike on his first cast, and then nothing for a while – he worked his way around the lake and eventually ended up catching (and releasing) 3 fish – one of them a really nice one. We were concerned that we wouldn’t have enough time to get back, so we started back downhill a little after 3:00. It was easier going downhill and quickly met the Motherlode trail and headed back up the hill. We didn’t really stop on the way back up except to cut a few of the “bent” trees that were hanging over the trail. We made really good time, and ended up getting back to the truck a little after 5:00. We were thinking it would take us 3 hours to get out and it only took us slightly over 2 hours! 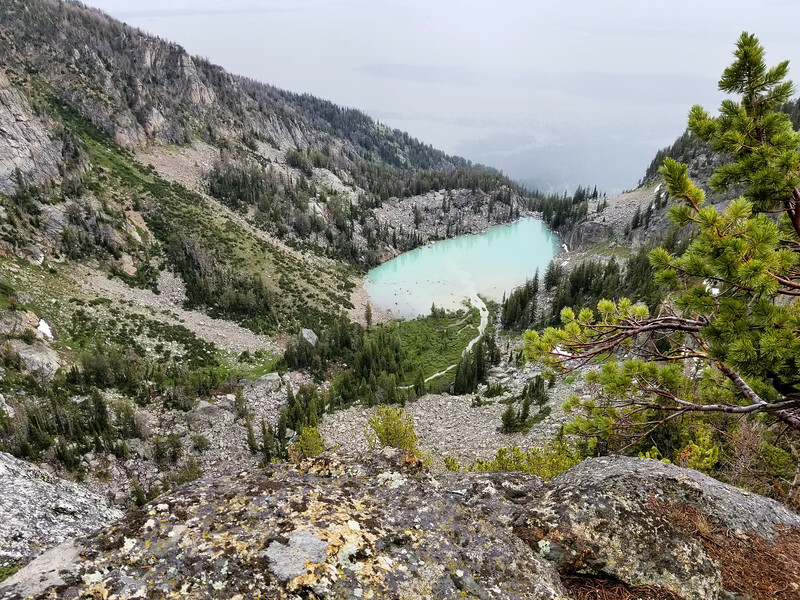 We only saw 4 other people on the trail all day – the 2 who headed out before us (we figured they took the loop up the BOTW lookout), and what looked like a mother/daughter coming up Motherlode – they were coming from Twin Lakes. It was a great trip, although a bit farther than we had anticipated. We got very little rain, and only periodic short spurts of wind – a lot better than I thought it would be! We even got some short sun spots! On the way back down from the saddle, we started getting a little mist, but we really only felt it in the open areas. 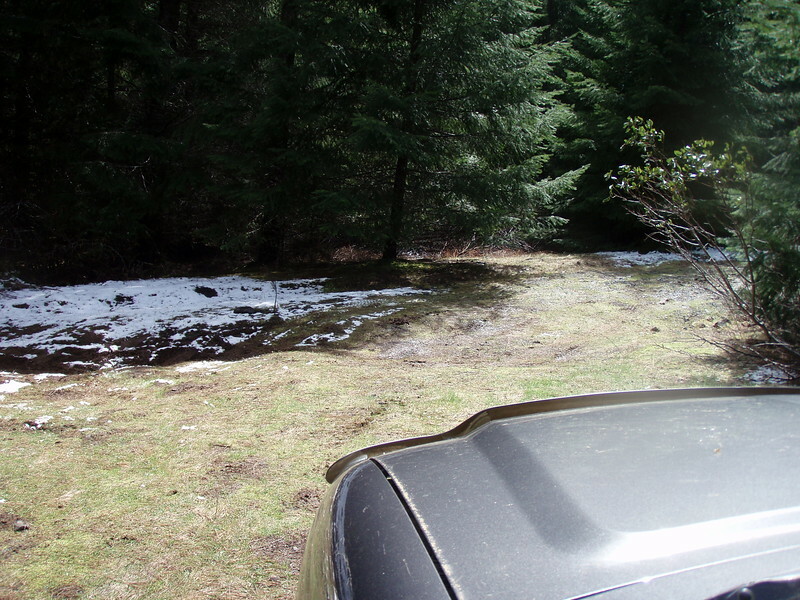 When we got back to Estacada, it was really raining. Either the hills didn’t get as much rain as the valley, or we lucked out and missed the brunt of the rain. We stopped in Estacada at Fearless for a burger and a beer. 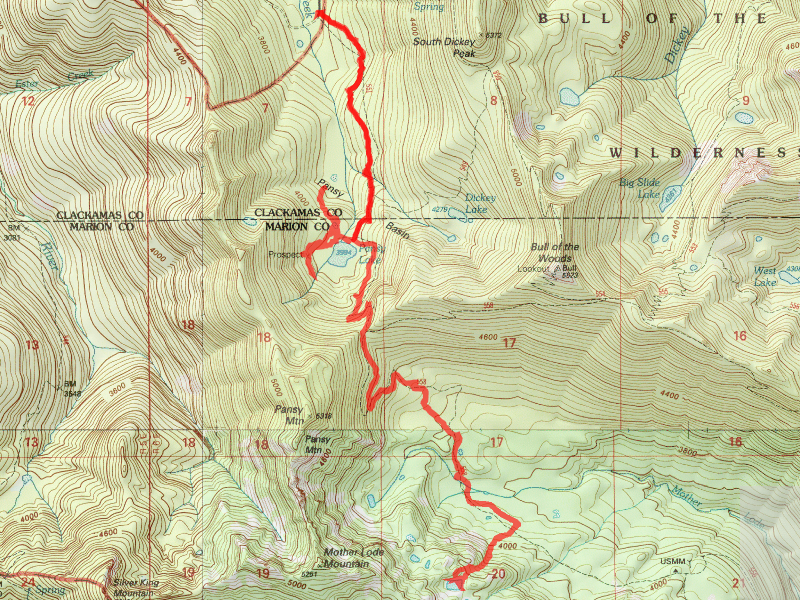 This was my birthday hike – in figuring out where I wanted to go, a trip report on the trailadvocate.org site intrigued me. 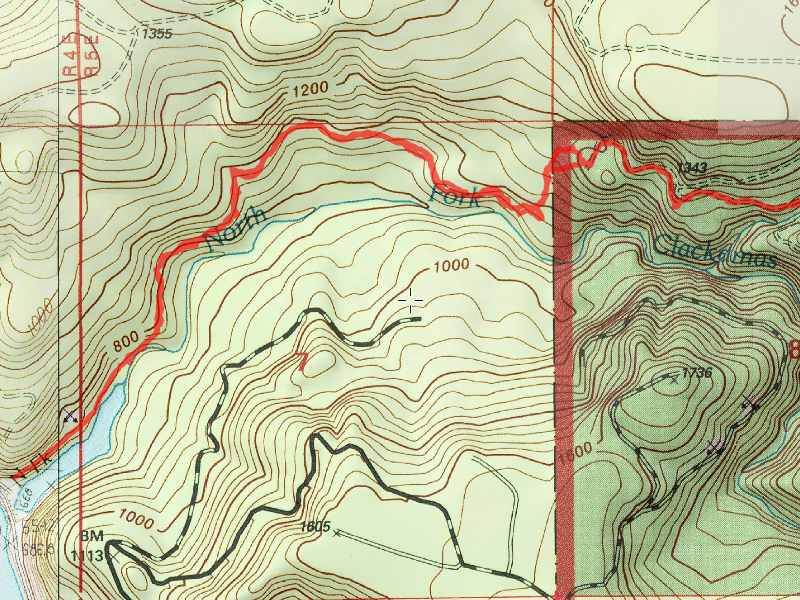 It was a report about someone finding a trail I stumbled across reference to in some old hiking books/maps. It was referred to as the Three Lynx Trail (maybe because it went all the way down to Three Lynx at some point?). Anyway, he found it and I thought it might be fun to follow his findings. 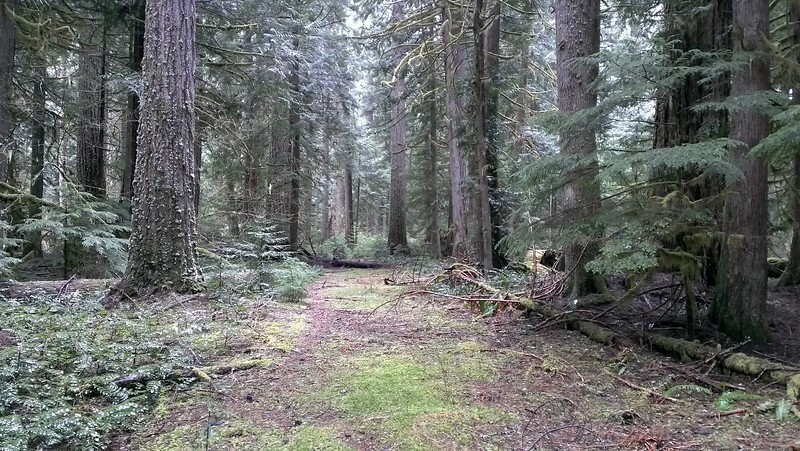 I always love to find/follow abandoned trails. While I’m not as good at finding them as many others, the more I look, the better I become. I don’t think I’ll ever be as good as some of the seasoned veterans I know. 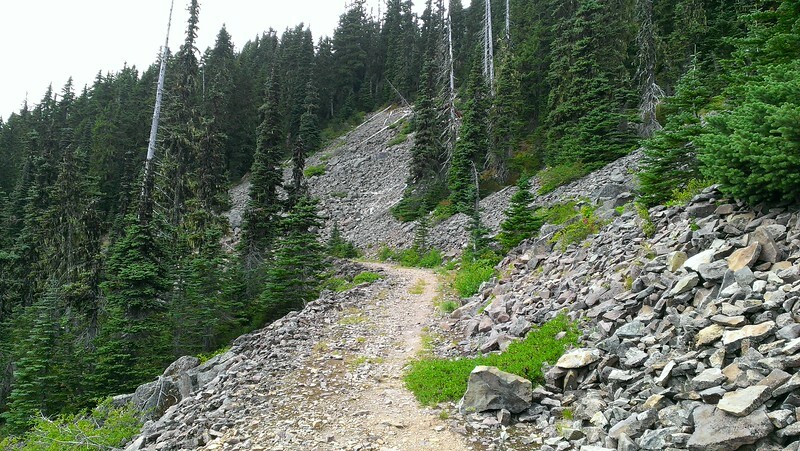 And then back to the shortcut trail and down the Shellrock Lake trail back to the truck. 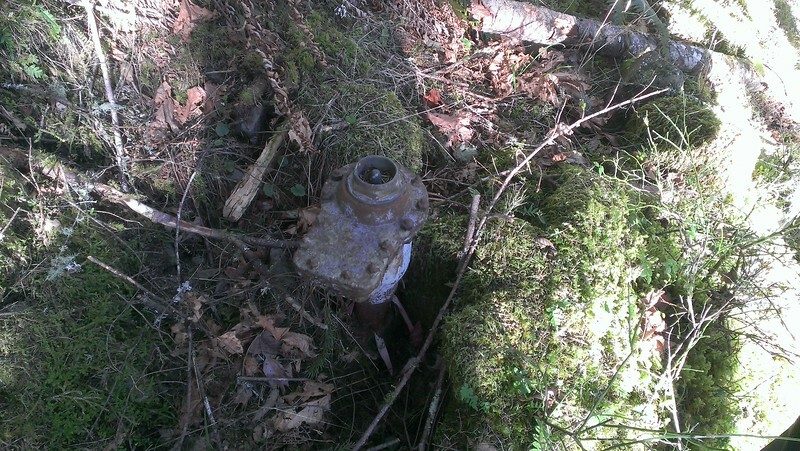 I’m guessing this is some sort of water “cache” for fighting fires. It kind of looks like a small swimming pool. 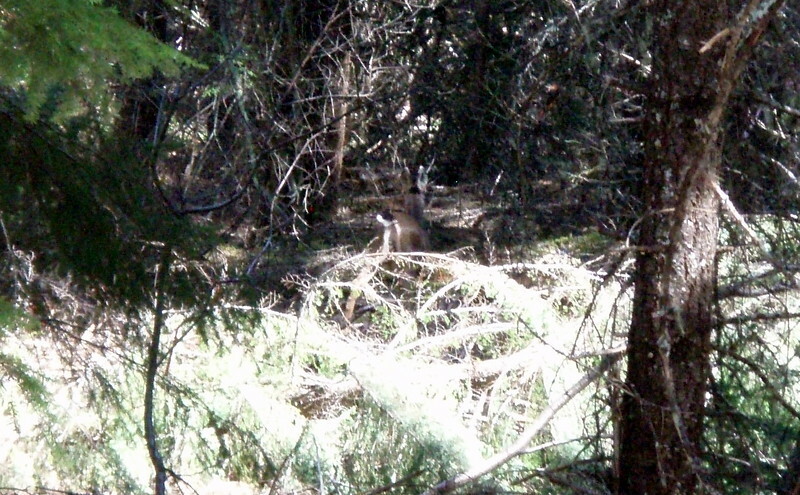 It was on the 5380 road on the way to the Shellrock Lake trailhead. This was a wonderful way to spend the beginning of my birthday! 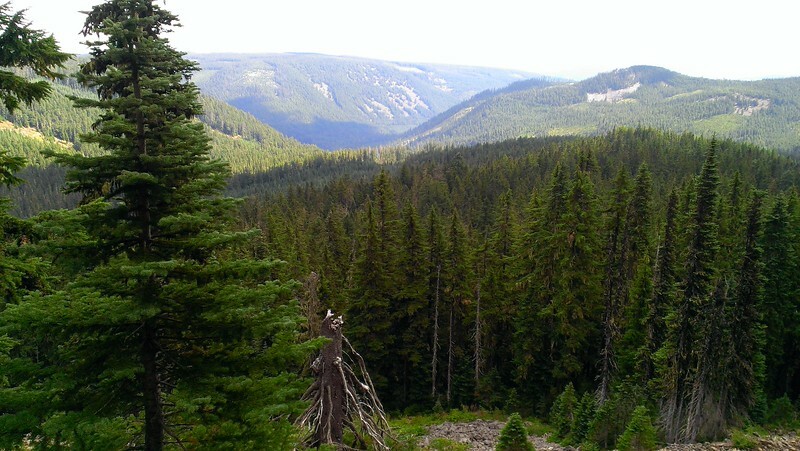 Weather was just about perfect for hiking – not too hot and not too sunny. 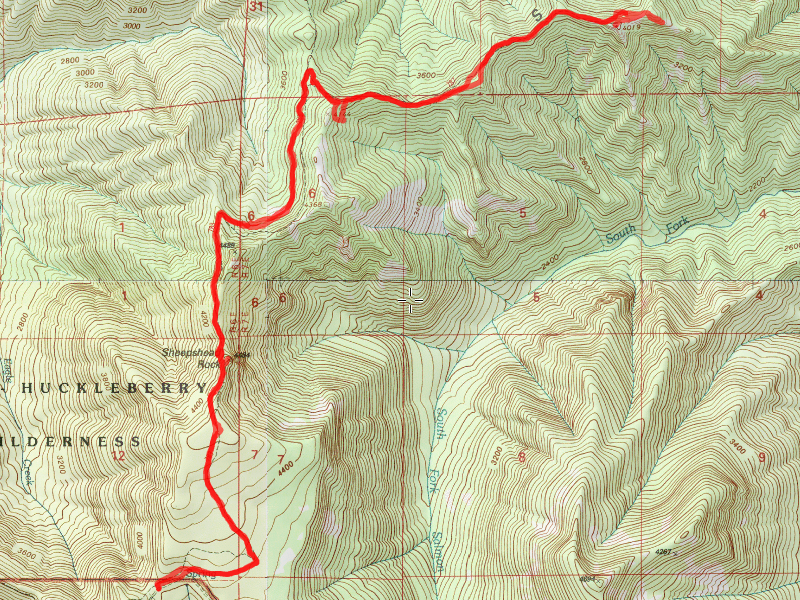 Originally, this was going to be a hike up to Cold Springs to start the year. I had gotten up there one week prior with little difficulty (most of the roads were free of snow, with the exception of a few spots). 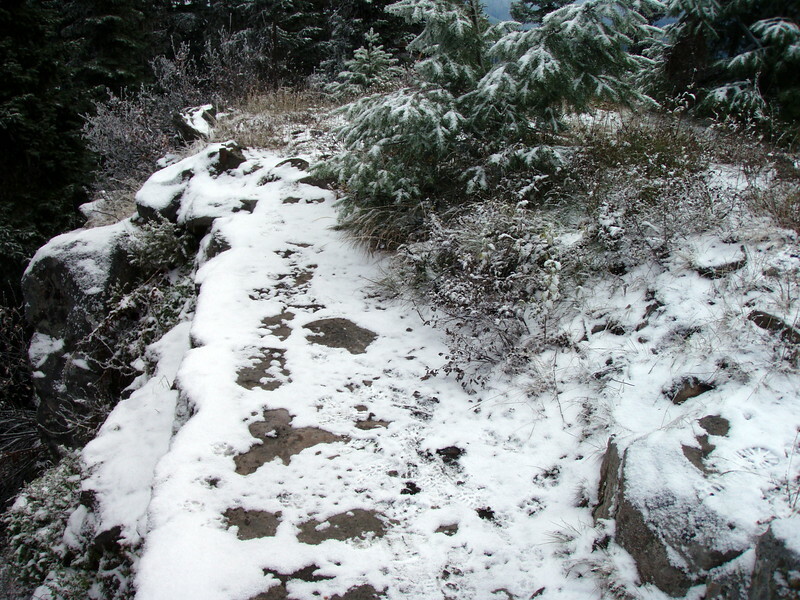 Due to the 6″ or so of snow that had fallen earlier this week, we were unable to make it all the way to the trail. I forgot to get a photo of where we turned around, unfortunately. So we came back and had to figure out another place to go. 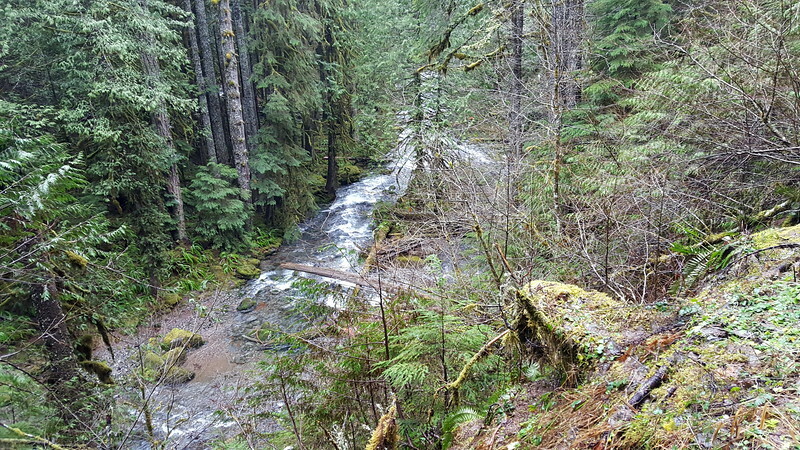 We decided to try the trail up the North Fork of the Clackamas. 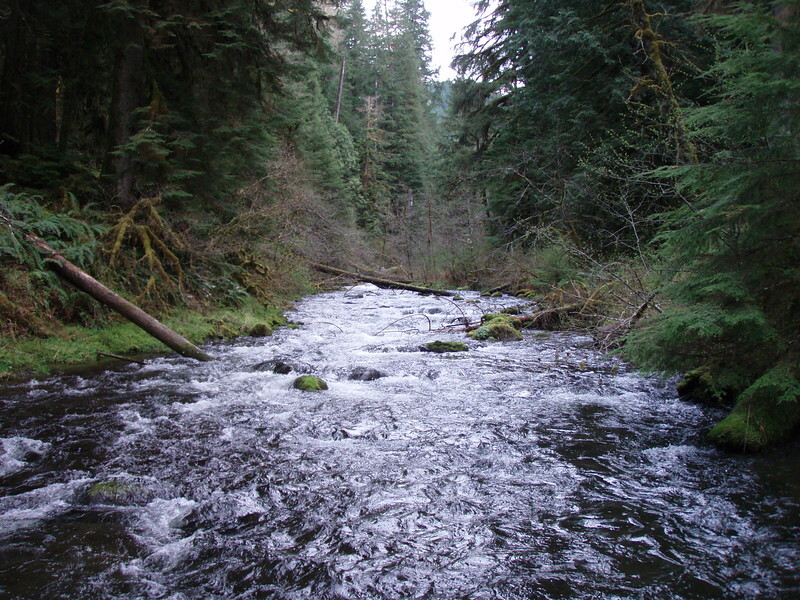 It heads up the NW side of the North Fork of the Clackamas at a side pool on the reservoir. The beginning of it is pretty good, with just intermittent blow down, but you can tell that many people walk this old road. It was a nice day in the woods. I really enjoyed hiking with Zack, although it wasn’t as good of a day as it would have been if we had been able to get to our original goal. Still, any day spent in the woods is better than a day anywhere else! 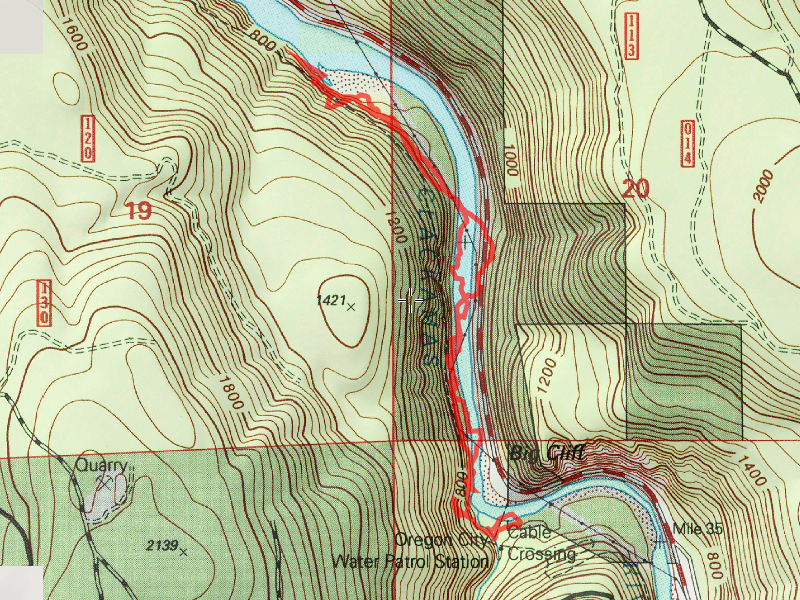 The day started at the location of the old “Oregon City Water Patrol Station” (that is how it is labeled on the maps). 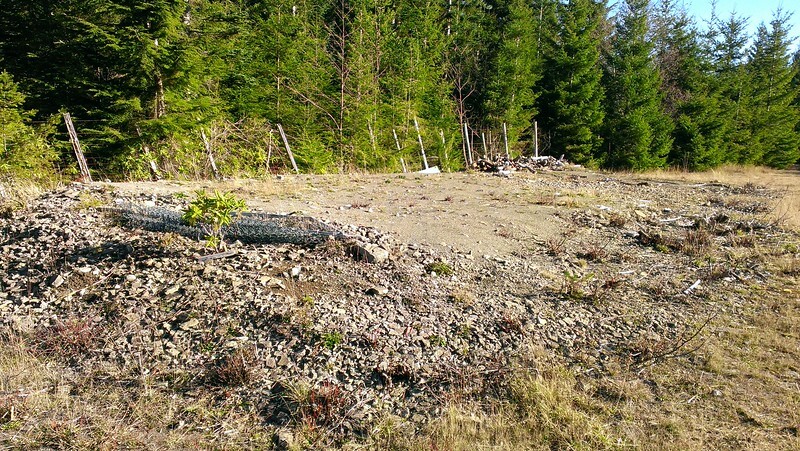 The house is no longer there, however there is a nice big pullout and lots of parking there. Kirk brought his canoe and the plan was to canoe across the river over to the landing on the other side and then follow the pipeline trail north as far as we could. The trip across the river went easier than expected – the current in the middle of the river was relatively fast, but it was pretty narrow – on the far side of the river was an eddy that was actually moving upstream! Anyway, we quickly made it across the river, got the canoe out of the water and then proceeded to find the pipeline grade. 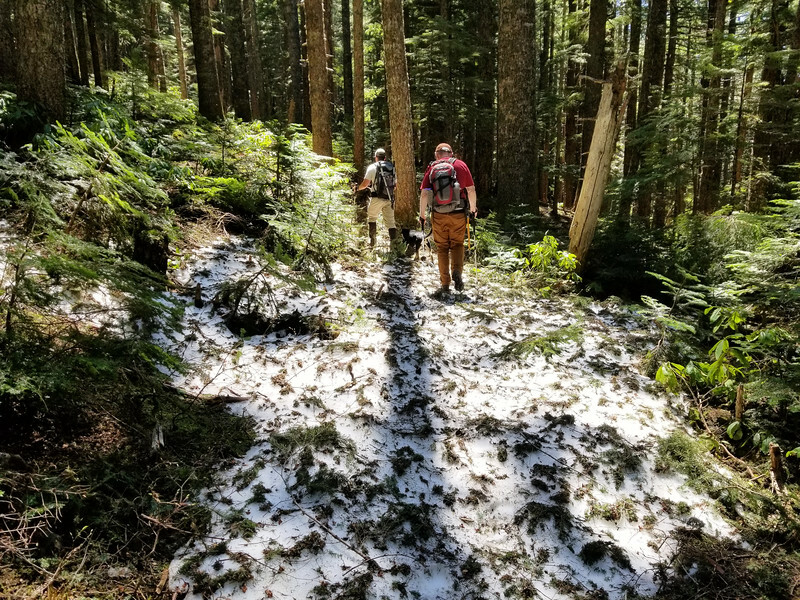 Doing this trip in the winter is really the best option for two reasons: 1 – there is LOTS of woody brush (salmonberry, blackberry, various grasses) that would be tough to navigate in the summer. 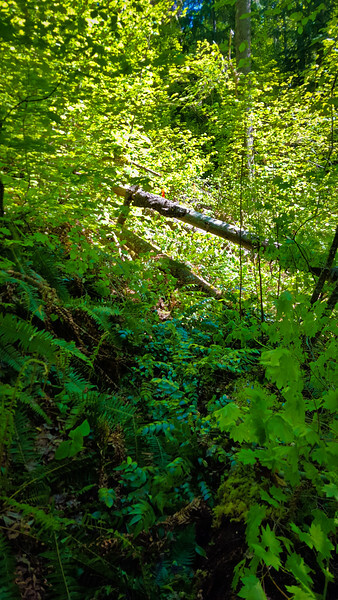 2 – There is a fair amount of poison oak along the pipeline grade – in the winter it is dormant, so it a lot easier to move past without getting itchy. 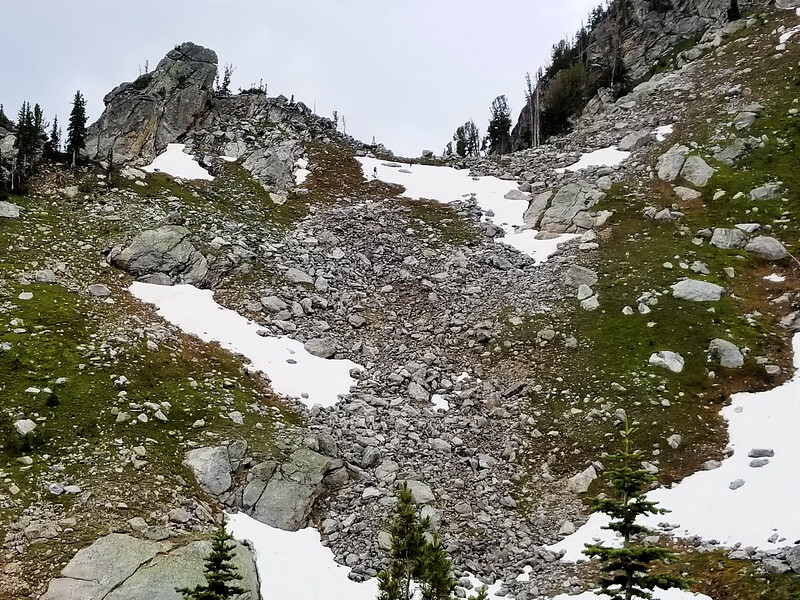 Around one of these rock slides, an interesting/scary thing happened: When Kirk moved a log off the trail and threw it downhill, the rocks started giving way – a mini slide occurred. We were waiting for it to take out the trail, but it didn’t (thankfully). It did slide a LOT of rock downhill however. 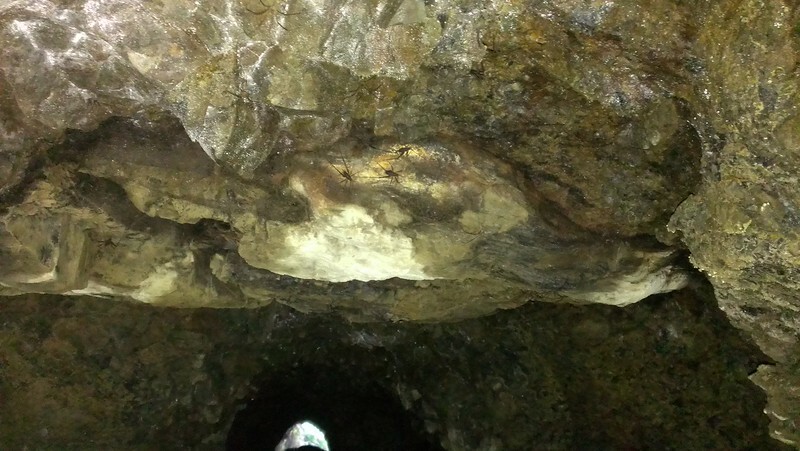 It reminded me of stuff I remember seeing in the Oregon Caves. 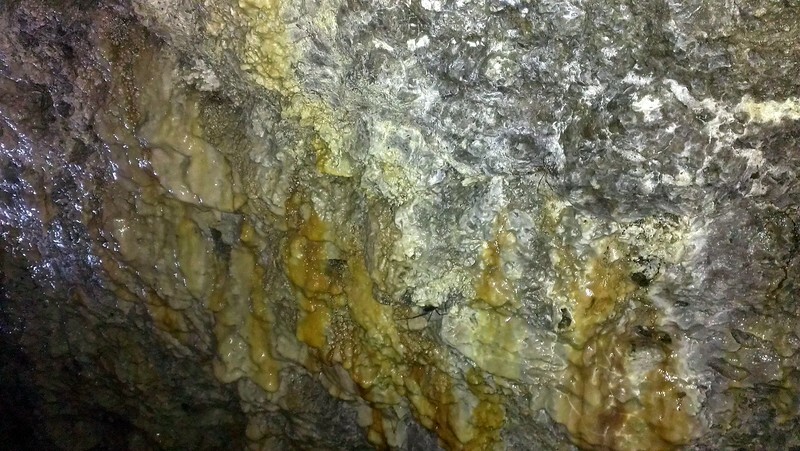 When looking it up, they referred to this as calcite deposits. It looks like it is soft, but it feels just like rock (although smooth). After exiting the 4th tunnel, and realizing we were pretty much at the end of our route, since the pipeline went down to the water and seemed to head at waterline for a while, we decided to head up to the top of the hill and see what we could see – we got up there and saw a very difficult bushwhack. We decided this would be our turnaround point, so we stopped for lunch. After exploring up the Gipper trail a bit, we headed back down, back to the canoe, and made our way back across the river without incident. Kirk had to go home to a family dinner, but Zack and I headed to Fearless for a beer and some sweet potato fries. On our way back, we stopped to look at the point we got to, in order to see where the pipeline went. While we were looking we saw an AWESOME sight – A Bald Eagle flew up from the river into a tree! As we made our way down river, the eagle followed us for a bit. They are absolutely beautiful creatures, and it was amazing to see in the wild. 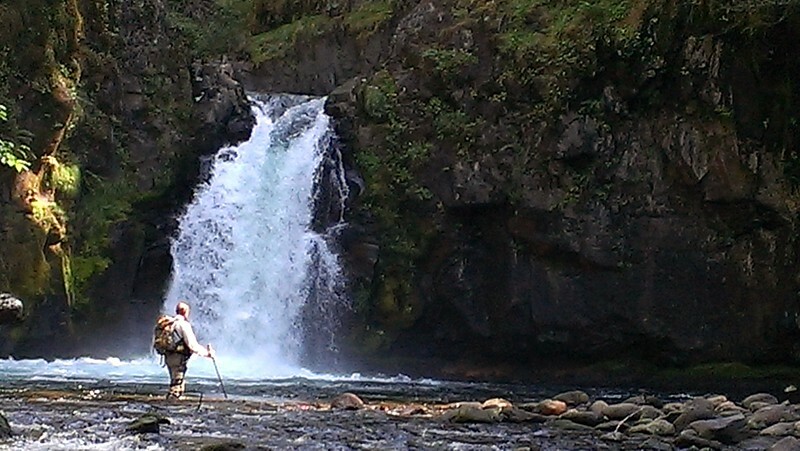 An amazing way to spend an incredible winter day in the Clackamas. It felt more like a fall day! This was a (quickly becoming) traditional New Years Day hike. 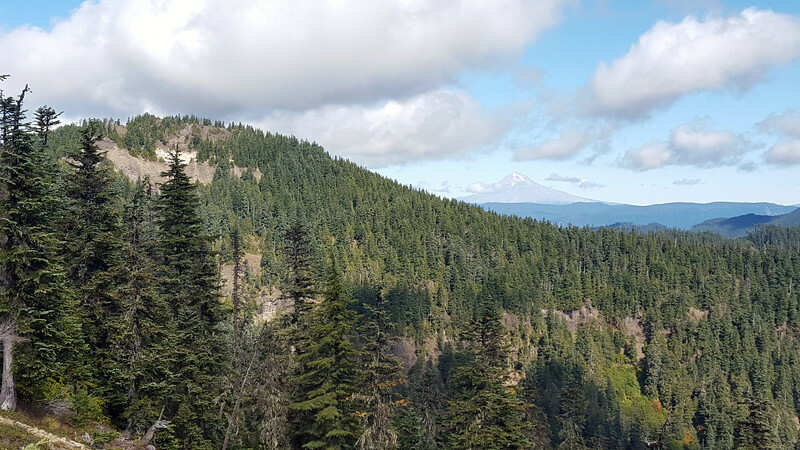 Originally I had wanted to do a low hike, since it is January, but with the lack of snow up high, I thought I would take advantage of the availability of higher elevation trails. 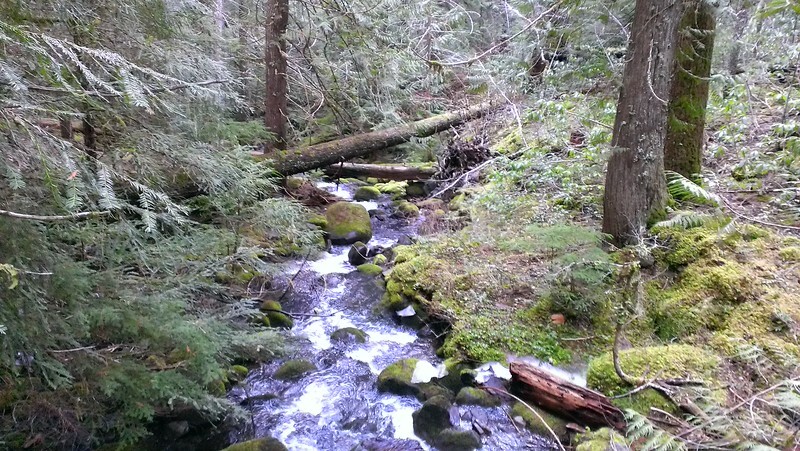 I hadn’t hiked Rho Creek in quite some time, and I had wanted to go back and do it again. The first time I was there, I wasn’t sure I followed the correct path to the 4672 road. I wanted to go back and make sure I had done it correctly this time. We got a lazy start, since it was New Years Day, but got up to the trailhead by a little after 10:30. The driving was a bit tricky, since there was lots of ice on road 46, and also LOTS of rocks that had come down from cliffs – some rather large rocks that required driving around. After following this for a while, we got to a post that used to have a sign on it. We weren’t sure what it was marking. The notes I had sounded like this was a trail junction, and “turning left” would take us to the Guard station, which we wanted to find. 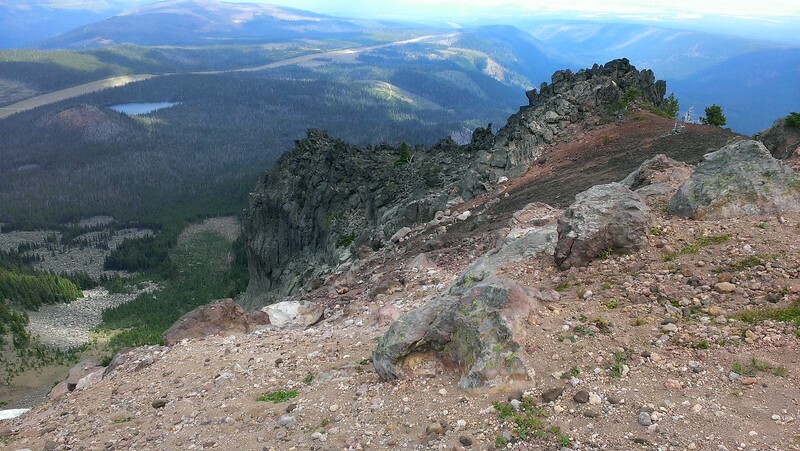 We followed a very rough, faint trail for a while – it kind of came and went. 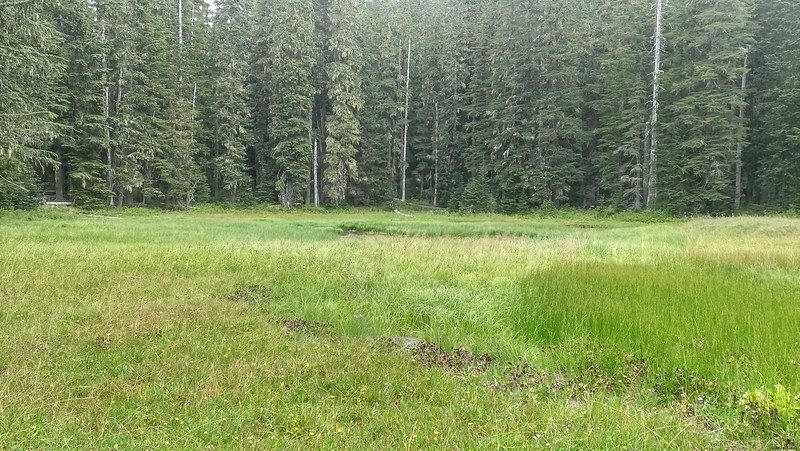 We thought the guard station was near the meadow, so we continued on to the swampy area – it is actually called a meadow – Rhododendron Meadow. Maybe later in the year it is drier – today it was icy, otherwise it would have been hard to walk across. 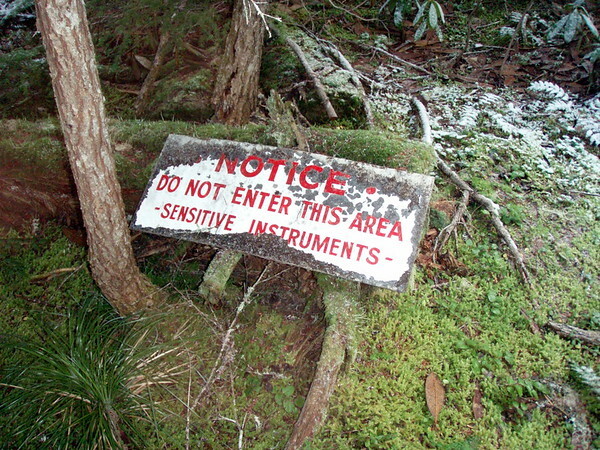 We didn’t see any sign of the guard station site, but we were a bit confused about where exactly it was. 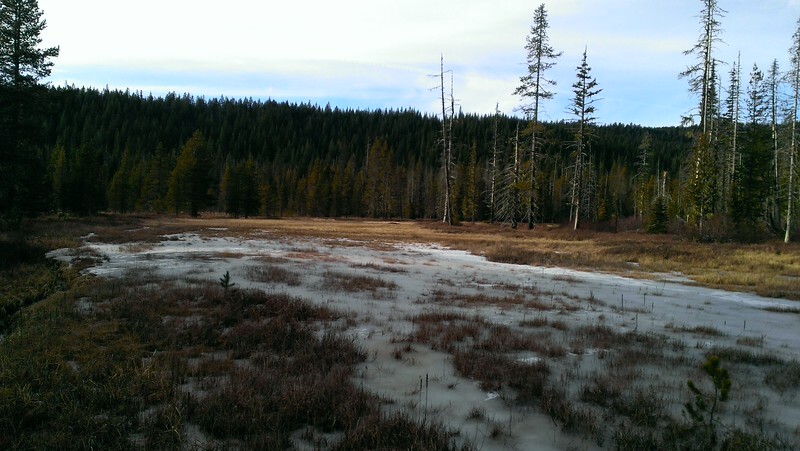 We were running out of time for the day, so we decided to head around the meadow and find the trail that we came in on. 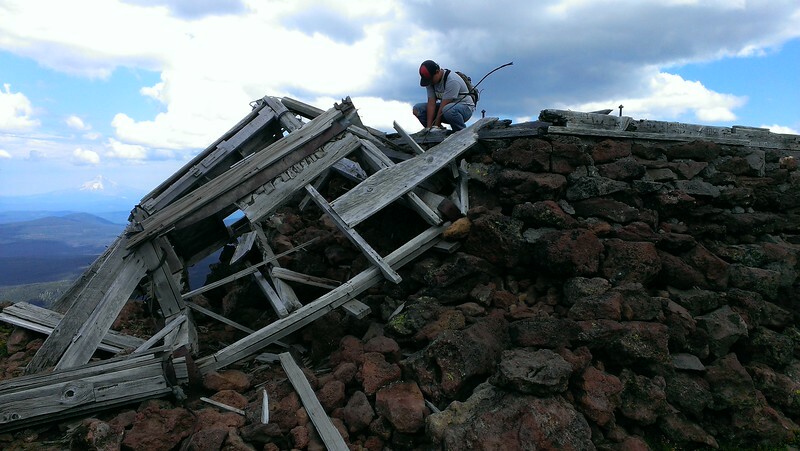 We found the trail and started heading back, and lo and behold, we stumbled across the old collapsed guard station! I can’t really say this is “typical” since this trail goes through so many different areas. But it is a very pleasant area. This trail is a very under appreciated trail. I will be back again sooner than 7 years next time. We capped off the day with a burger and pint at Fearless. What a great way to kick off the new year! This hike was kind of planned last minute. We’ve had an extended run of nice, sunny (but cold) weather, and I needed to take some time off before the end of the year, so I took a weekday off to do a hike in the nice weather. 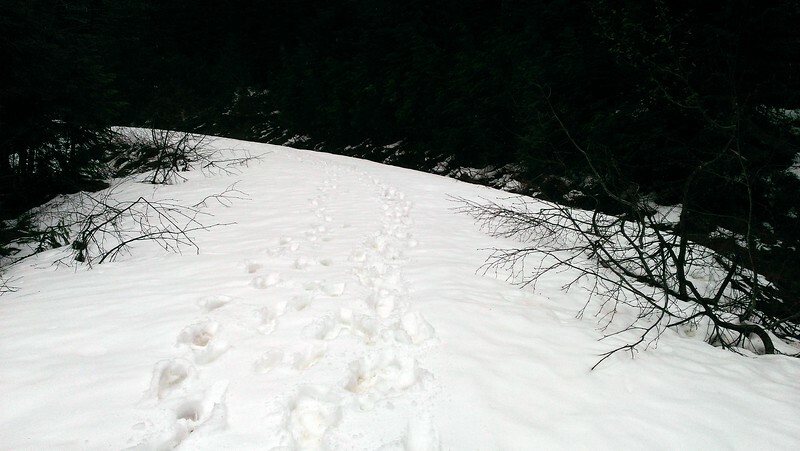 While the snow has not buried all of the higher elevation trails, anything above about 4000′ or so seems to be out of range for hiking. 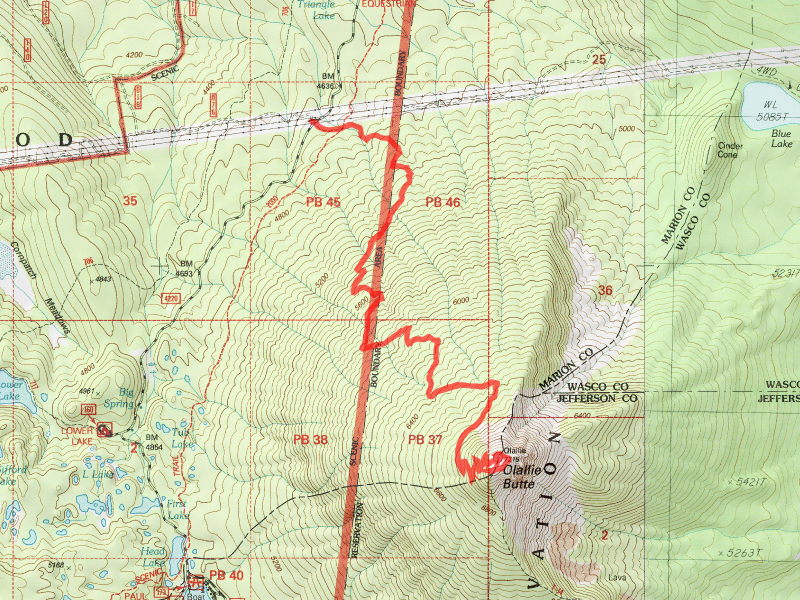 So, I had to try and find a trail that appealed to me that was lower than 4000′. My first thought was to go back to Cold Springs and do some more cutting on areas that badly need it. My saw was still in the shop, so that idea did not fly. I looked at a few others, but they were either too high, or too far for a short day trip. 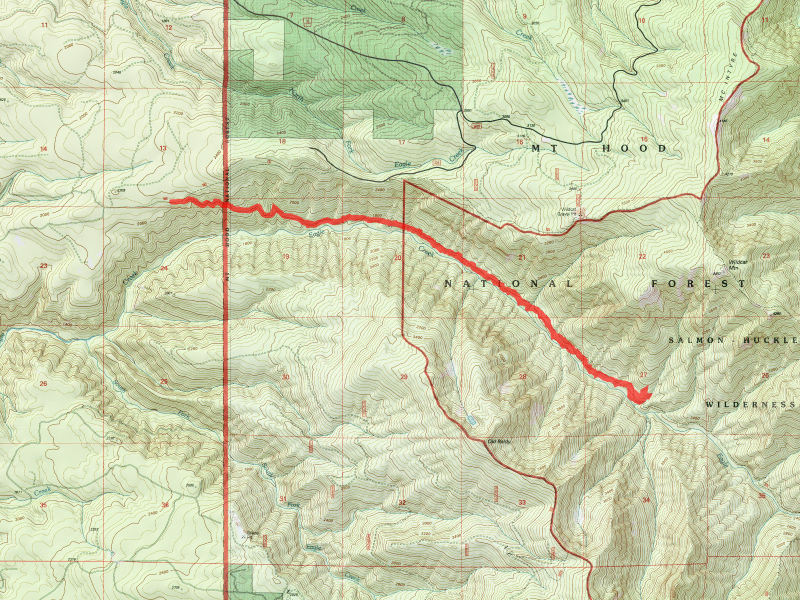 I was still recovering from the Cold Springs trip two days prior, so I wanted a relatively easy, short hike. So we ended up walking all the way down to the jump off point. It was an easy and interesting walk. The day turned out to be a lot more about the Silvacultural research station that used to be located here. 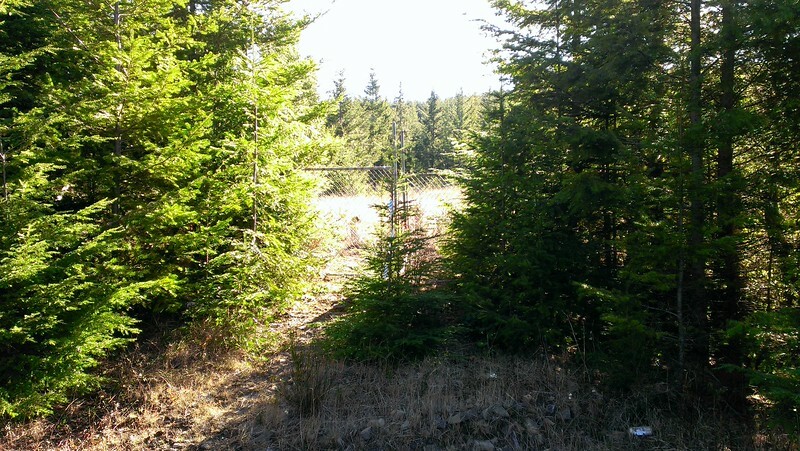 I’m not sure when it was abandoned, but the research areas are still all fenced off, with tags on trees. At the junction of the 240 and 242 spurs is where the research station used to be located. 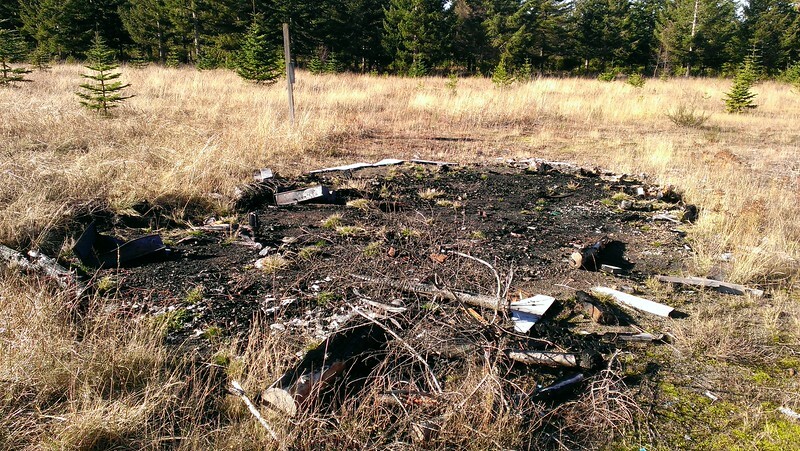 You can still see a lot of remnants of what was there – an old outhouse (turned on its side with a missing roof), old roofing materials, lots of firewood, and the outline of a burned structure, which I’m assuming was the actual research facility. You can see what looks like office chair pedestals, and a couple of filing cabinet drawers along with some other rusty burned stuff. It was interesting to poke around all this stuff. When I came down the 240 spur, I saw the turnoff to the research station and mistakenly thought it was the 242 spur road. We walked north until we hit a fence, then we followed the fence mostly west (a little south) to another fence. These fences are 8′ high, and are still in surprisingly good shape. I found a couple spots where people have jumped the fence, but the top of it still has 2 rows of barbed wire. I wasn’t about to try and navigate that, plus I had the dog, who wouldn’t be able to climb the fence anyway. I headed back thinking we were done for the day. When we got back to the 240 road, I looked down the road a bit farther and lo and behold, there was the 242 spur road heading north. We took off down that road to our jump off point. 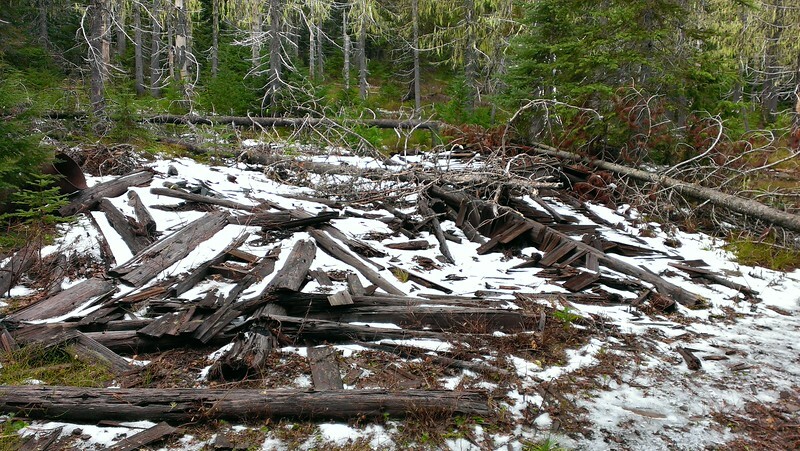 One thing that was troubling – we saw several piles of neatly stacked logs – probably 25-30 cords of firewood at least. All sitting there just rotting away. Why did they leave so much wood? When we got almost to the end of the road, we headed west, downhill searching for the point where we had come up from the other direction several months ago. The going was brutal. 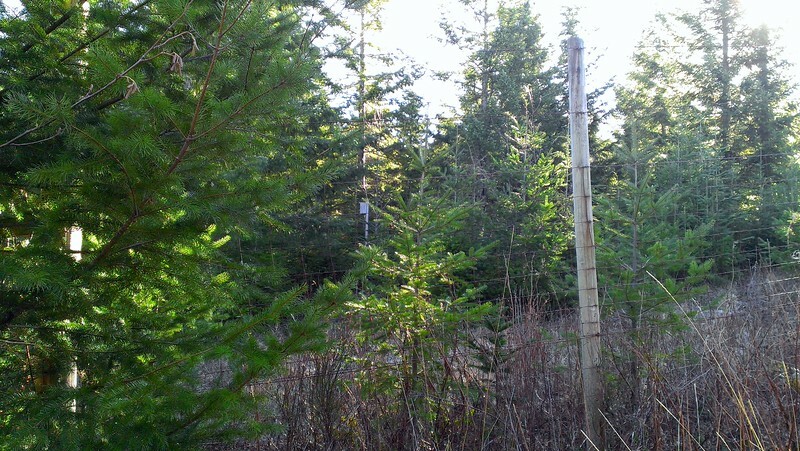 First, we had to navigate a VERY dense thicket of small fir trees. Actually, I think there were a couple of those. 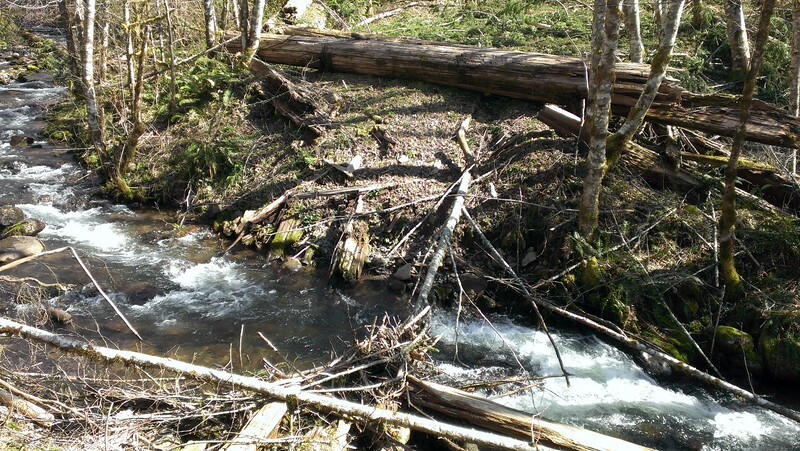 After the difficult day we had Saturday, I didn’t think I was up to navigating all of those downed logs. We still had to hike back up to the truck! So, we decided to turn around and head back. We ended up getting about halfway to where we ended up last time (probably about a tenth of mile away). The trip back was relatively un-eventful and went quickly. The elevation gain was pretty easy since it was all well graded roads. We ended up back at the truck about 1:15 and then headed home. A short, but very nice day in the woods. The weather was SPECTACULAR! 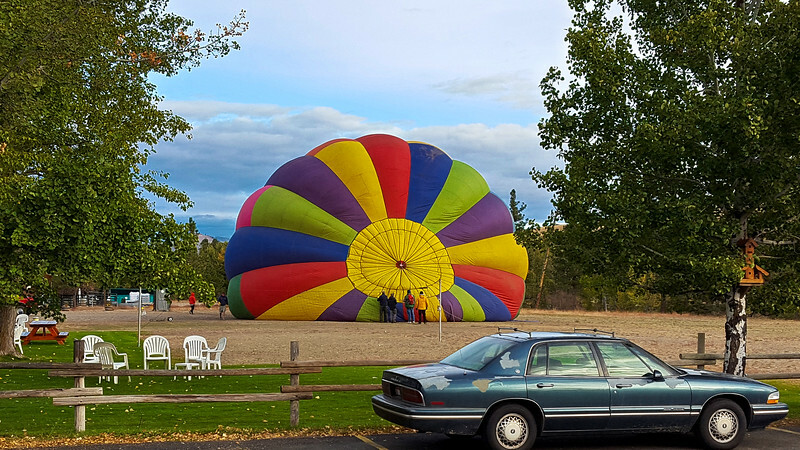 I was dressed for cold weather, and although it was a big brisk in some of the shady areas, it really was pretty warm up there – especially in the sun. It was nice to get out and enjoy a unique area on a nice fall day. 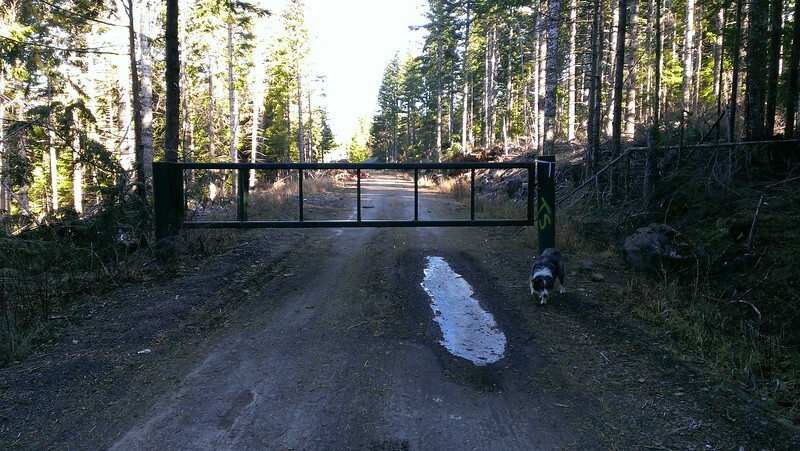 Maybe I will return when that gate is open and I don’t have to walk all that way – then I would have enough energy to negotiate all the underbrush and downed logs. 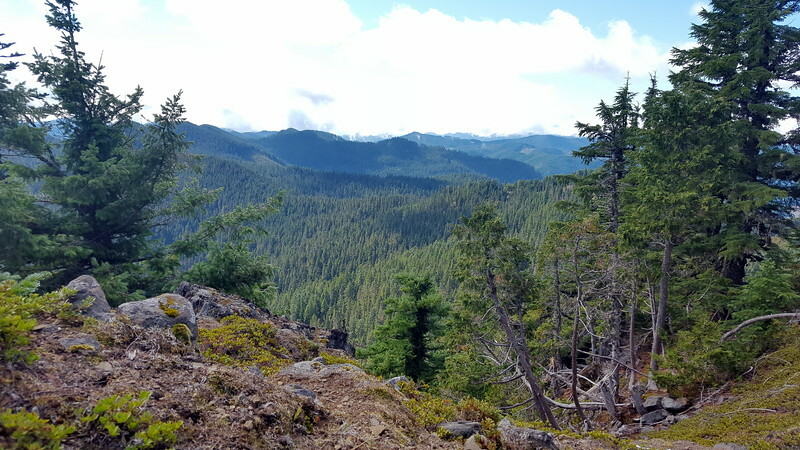 The goal for this hike was to capture a track for the Shellrock Lake trail, and to capture the east end of the Grouse Point trail (that is a LONG trail!) for inclusion on the trailadvocate website. 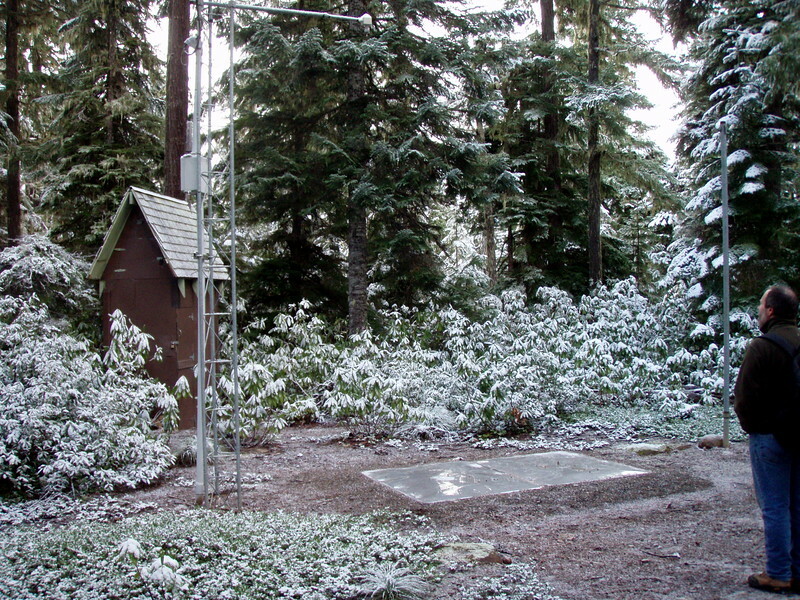 In addition, I had heard rumor that there was a telephone box on top of Frazier Mountain – I wanted to see if it was still there. 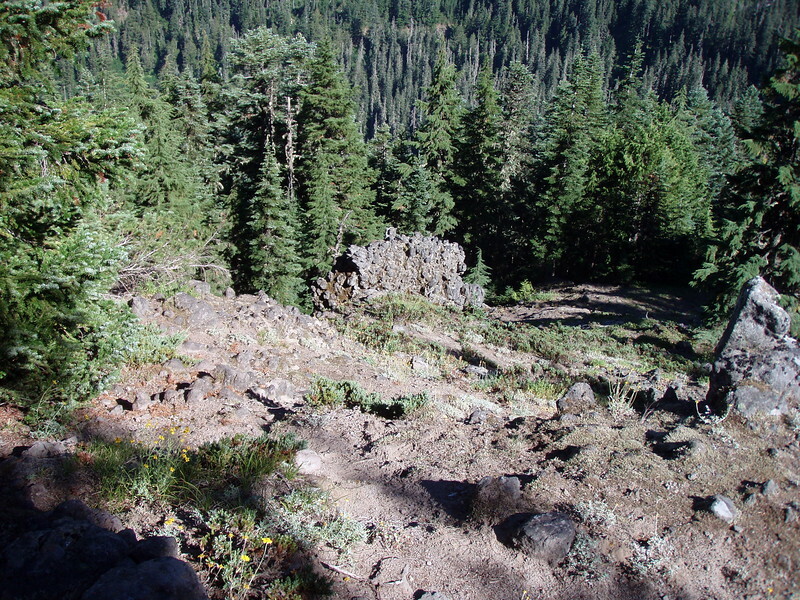 I had also been informed of an old “cutoff” trail that went between Cache Meadow and the Shellrock Lake trail which I wanted to explore a bit. So, a bit of a mismash of objectives. 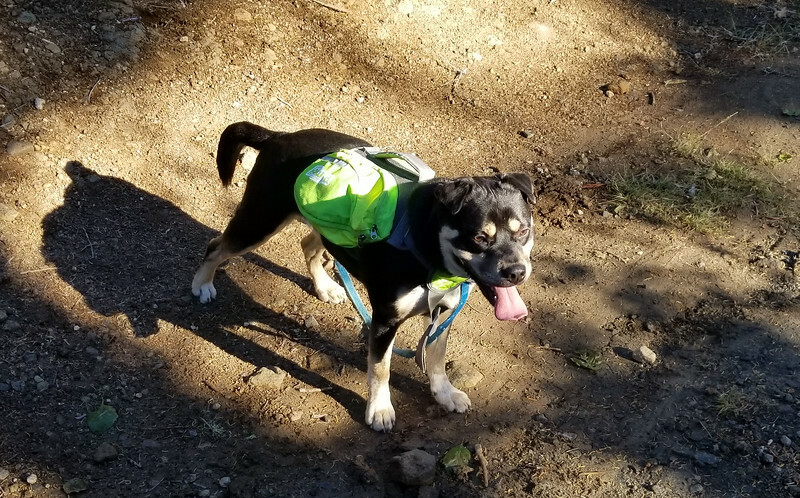 Since Don knew the cutoff trail location, and he also wanted to go up on Frazier Mountain, he came with me. 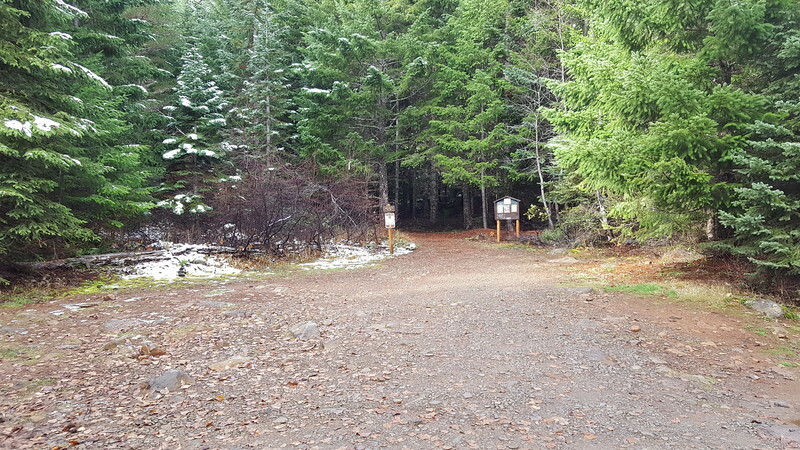 We started at the Shellrock Lake trailhead parking lot about 10:30 under sunny skies. Shellrock lake starts through a clearcut, and it pretty open and hot, but thankfully, it wasn’t too warm this day. 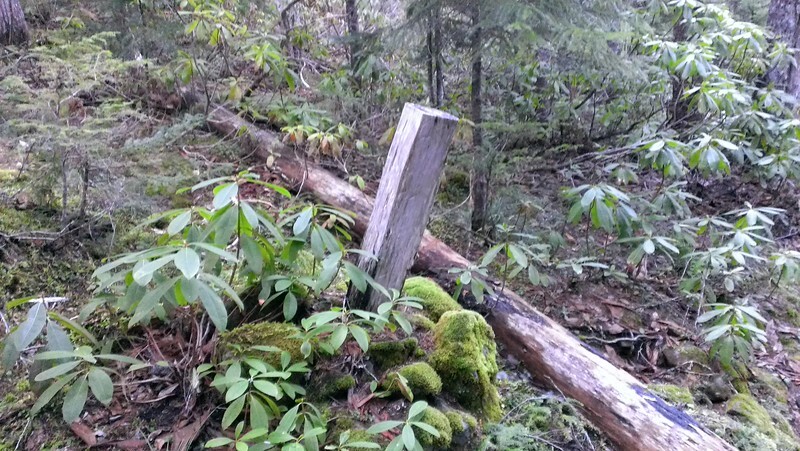 Almost immediately after entering the forest from the clearcut, there are 2 posts on the side of the trail (wonder what they used to say?). 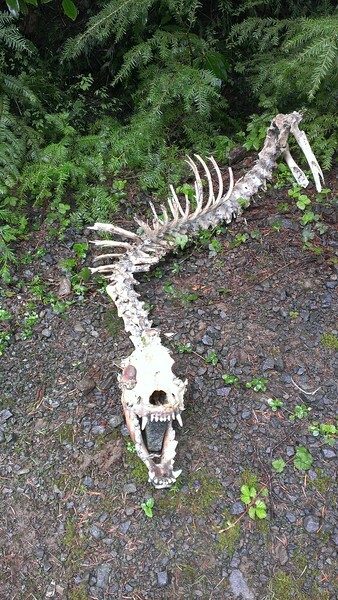 This was our clue to head uphill to find the cutoff trail. 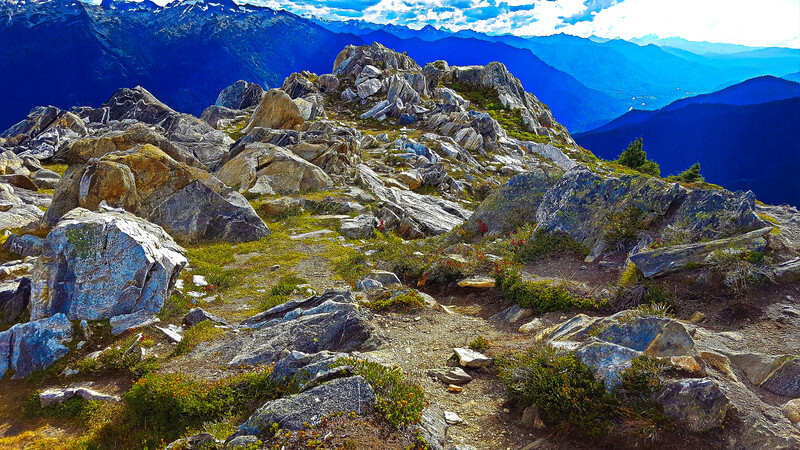 You only have to head uphill 100 yards or so and you’ll see blazes and the trail. 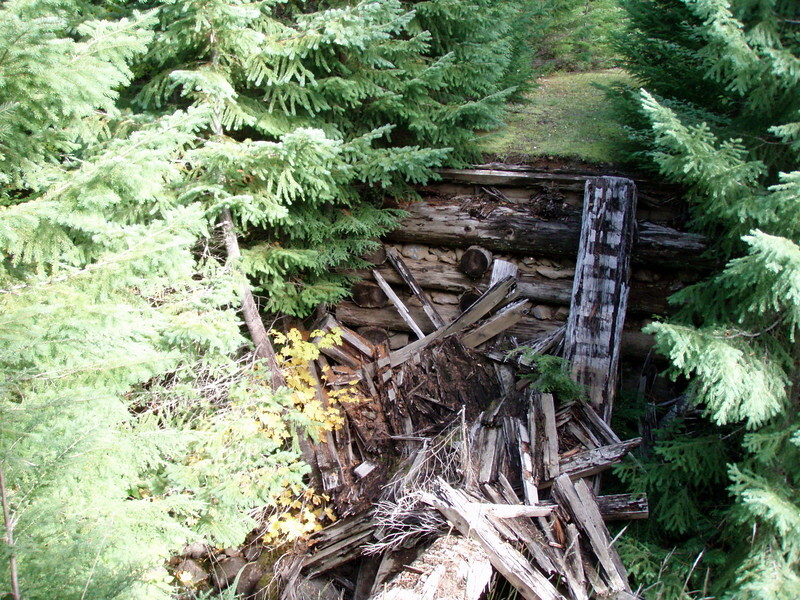 It is in pretty good shape – amazing shape actually, for a trail that is no longer used. 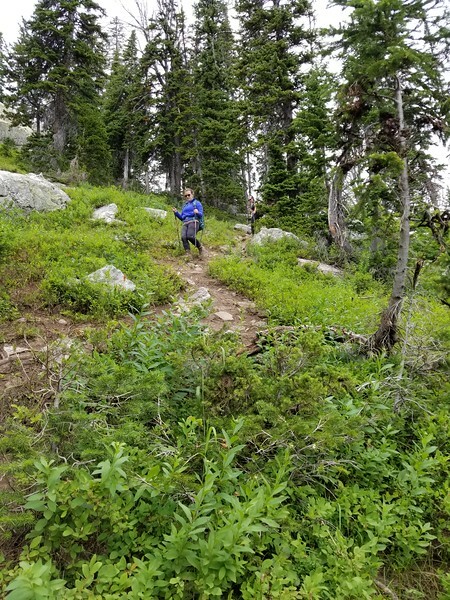 We made our way up this trail until we came to the first “excitement” of the day – a nest of wasps/hornets/yellow jackets that had been dug up next to the trail (just like the hike from 2 days ago where I got stung 3 or 4 times). I tried REALLY hard to be careful around it, but I ended up getting stung on my left hand anyway. STUPID BEES! Don gave me some Benadryl which helped a bit. We continued up the road until we got to Frazier Turnaround. 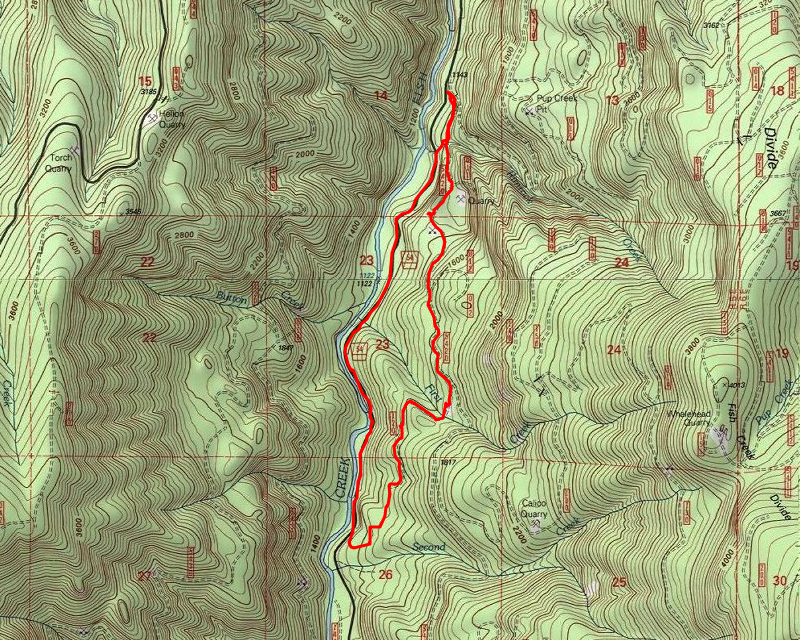 Another old trail that interested me was the old South Fork Roaring River (511) trail. 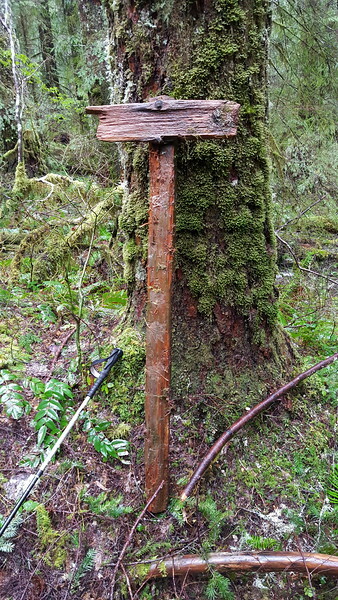 Supposedly there was a junction off the Serene Lake trail not too far from the beginning. Don had seen it quite a few years ago, and we headed up to see if we could find it. We didn’t go too far, but couldn’t find the old junction – a quest for another day. We stopped to eat lunch at Frazier Turnaround and then headed back down the Grouse Point trail (east) to a jump off point to make our way up to the top of Frazier Mountain. 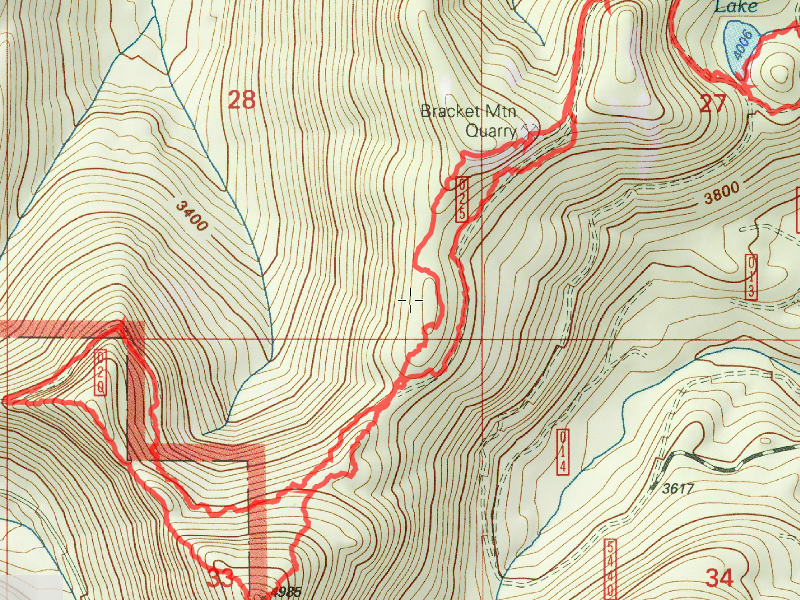 Our plan was just to walk the ridge from the road up to the top of Frazier Mountain. We did, and it wasn’t long before we found an old trail! This anomaly really needs to be investigated. 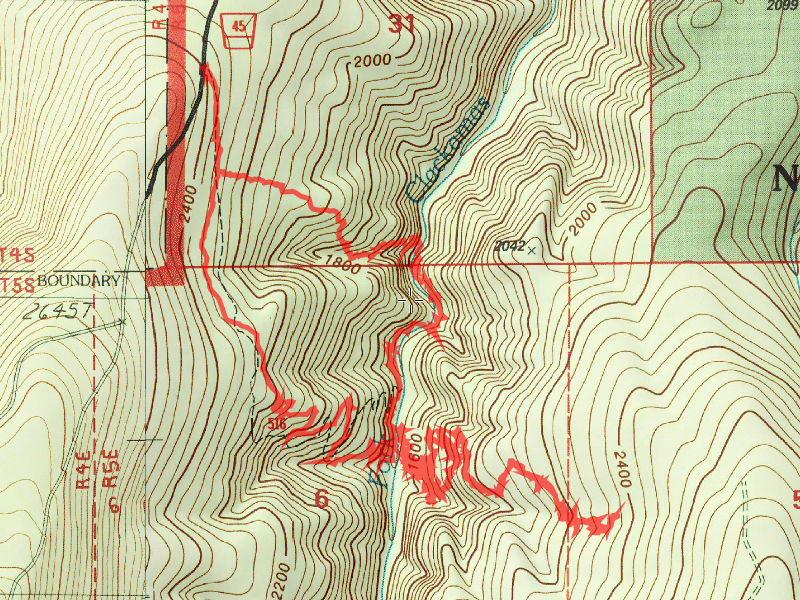 That trail heading up the South Fork would be AWESOME if it could be located. This visual clue certainly looks like a trail, however it will be need to be investigated up close to determine exactly what this “line” is. Maybe it is the first hard evidence that the 511 actually exists? We took in the views of the lake (and the MANY campsites surrounding it) and continued back towards the beginning of our journey. We got back to the parking lot around 3:30 – a day well used and lots of new things found and as usual, more items to explore another day. A short stop at Fearless in Estacads for a beer made a great ending to the day. 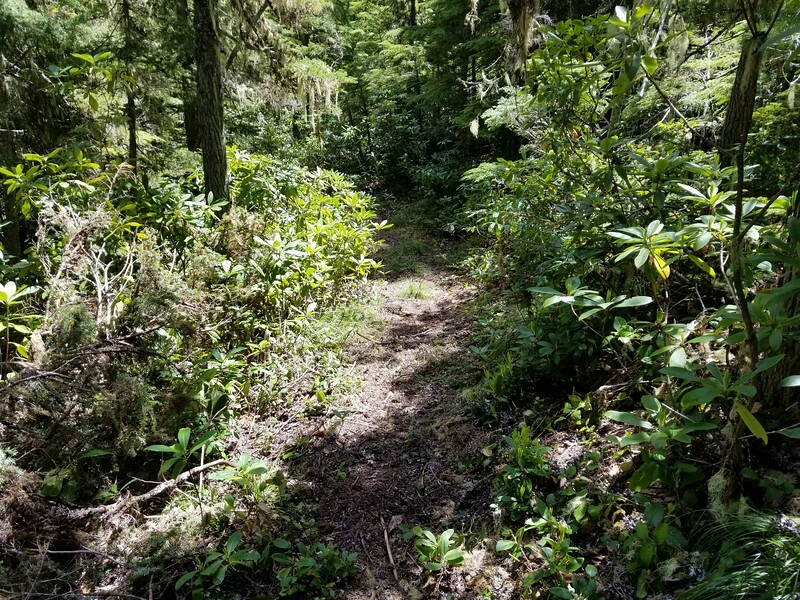 This has has been on my “to do” list for a while now, mostly due to it being one of the last trails I do not have an official, full trail track for. 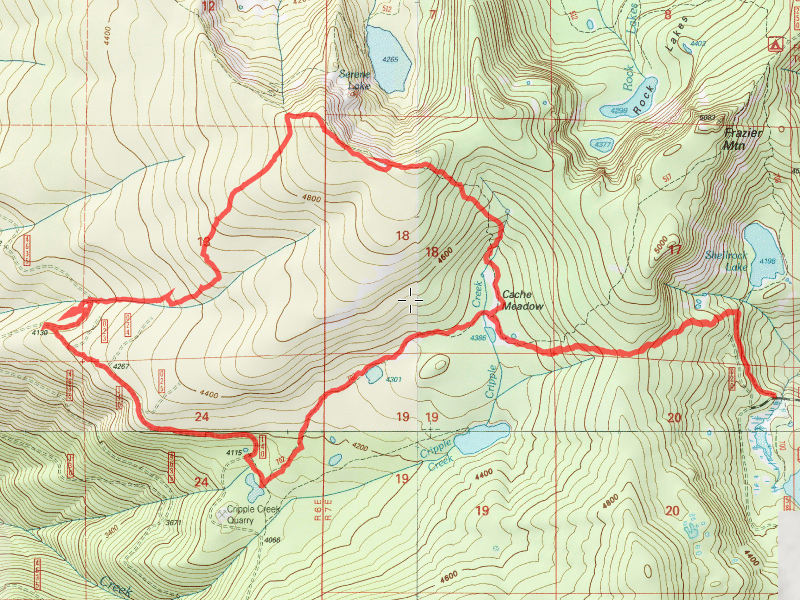 Kirk was camping with his family at Olallie Lake and asked if I wanted to do this hike while he was there. Since I had some extra vacation I needed to use, I decided to burn a Friday and take this hike. I’m glad I did. 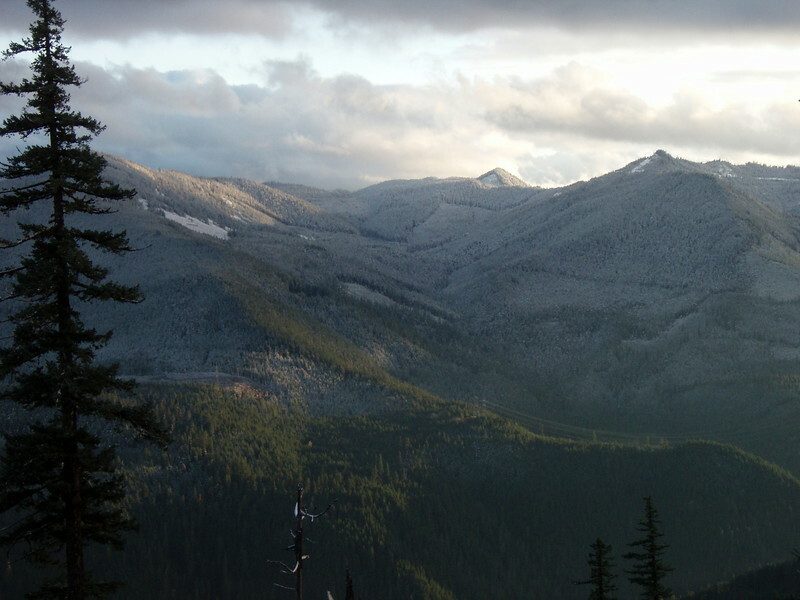 I had seen photos of the top of Olallie (it looks like it has a hat from a distance) and had wanted to see it for myself. 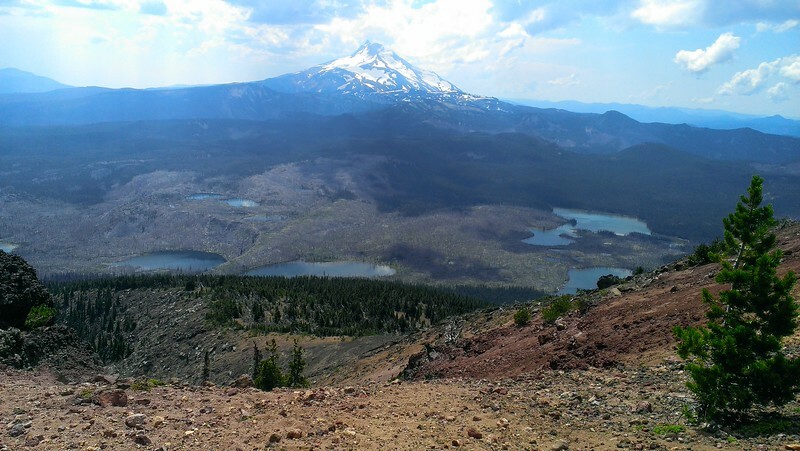 That, coupled with this peak being the highest peak between Mt Hood and Mt Jefferson made it even more attractive. 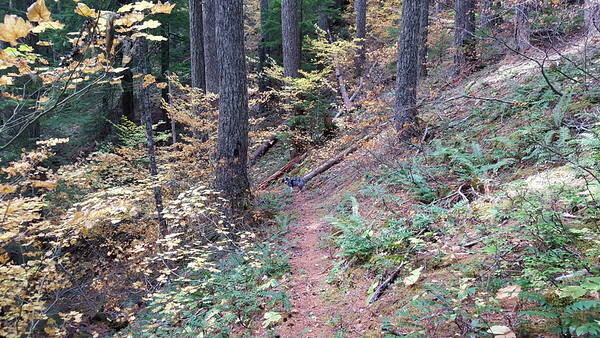 One thing that I wasn’t so sure of – I like more of the “deep woods” trails, and the Olallie area is much sparser and drier. I wasn’t sure I would like the trail itself – maybe the view from the top, but I figured the trail would be kind of “ho hum” at best. Well, I was pleasantly surprised with that as well. This day was giving me all sorts of surprises! 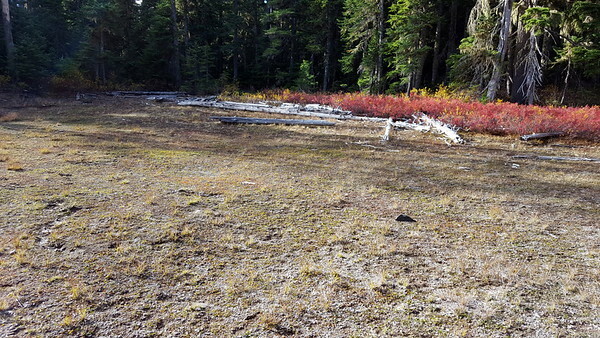 We started out around 10:30am at the southern edge of the powerline clearing, just north of Olallie Lake. 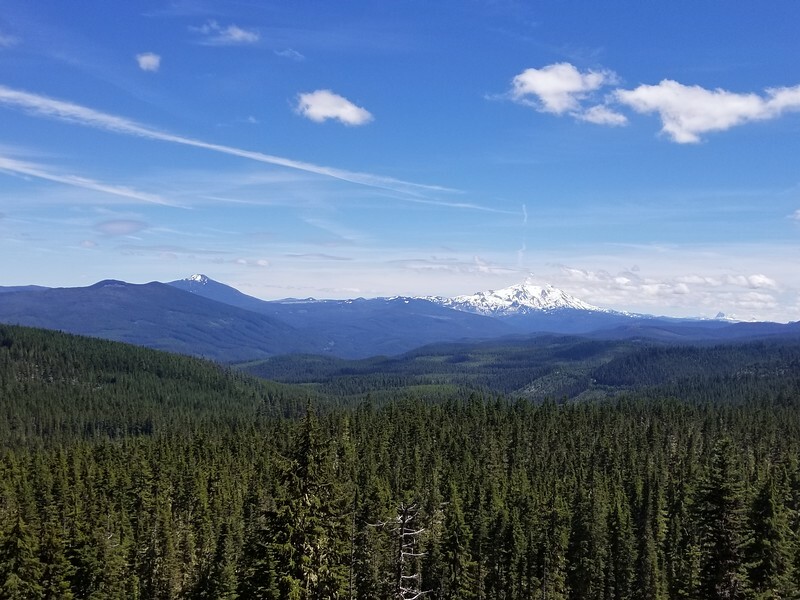 There is a powerline road that takes off from here and near the beginning of that powerline road is where the Olallie Butte trail takes off. 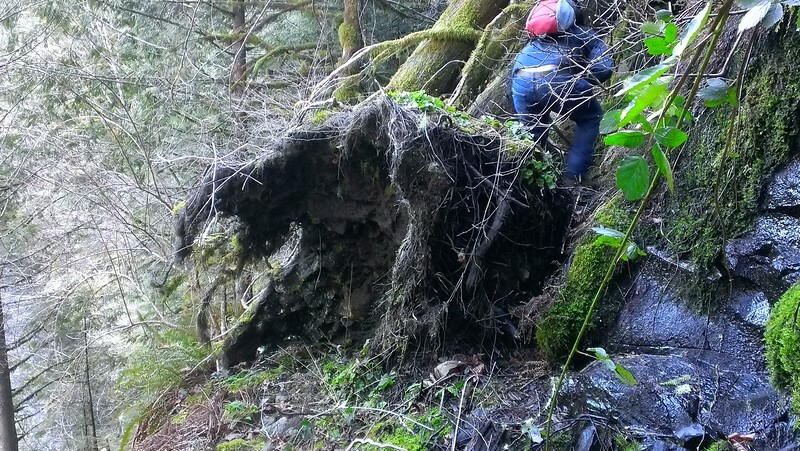 It was in great shape, with little blowdown. 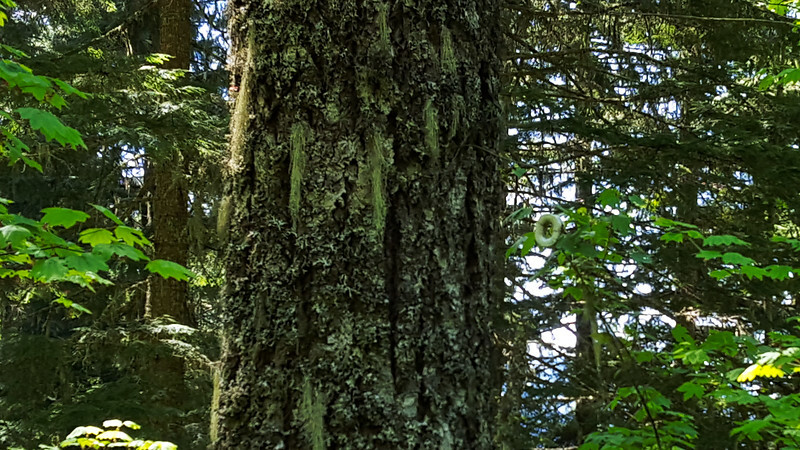 It stays in the trees, and shortly crosses the Pacific Crest Trail, and then continues its rather relentless trek uphill. 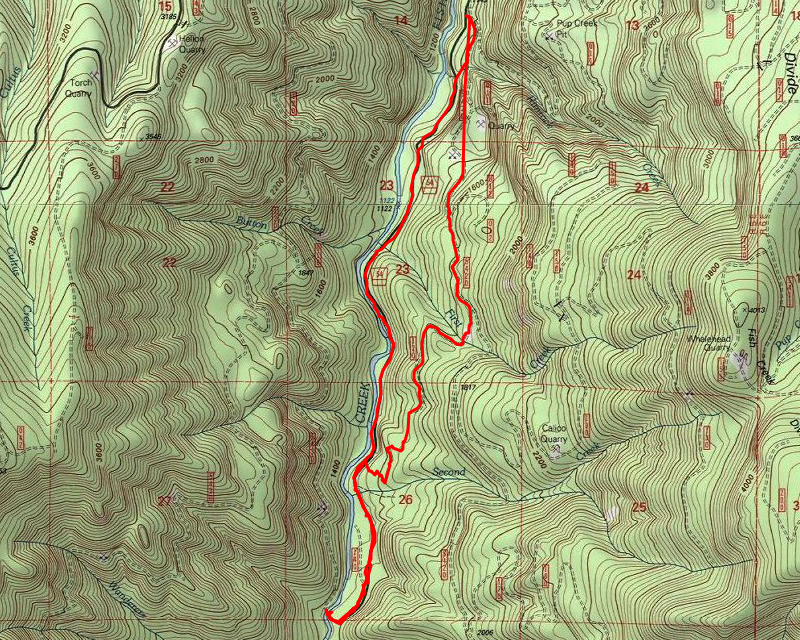 Since the trail has to gain about 2500′ of elevation in 3.5 miles, it has to be reasonably aggressive. The nice thing was that this trail really was well graded – it pretty much just is continually going up, but almost never at a steep grade. 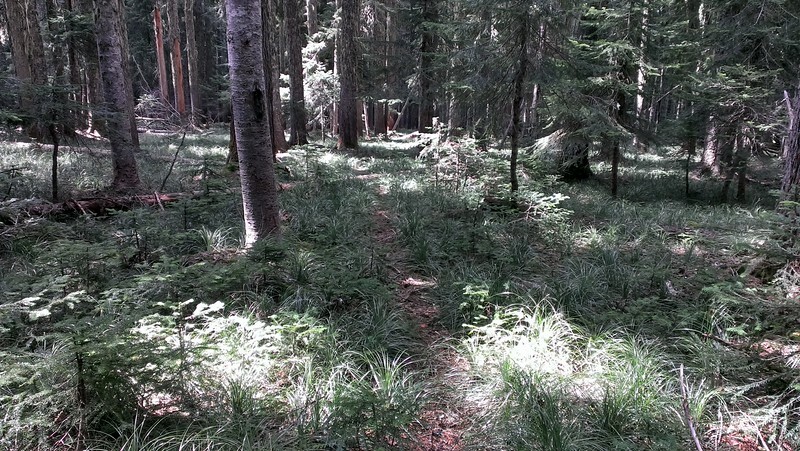 It was much easier than I had expected – especially for all the elevation gain. 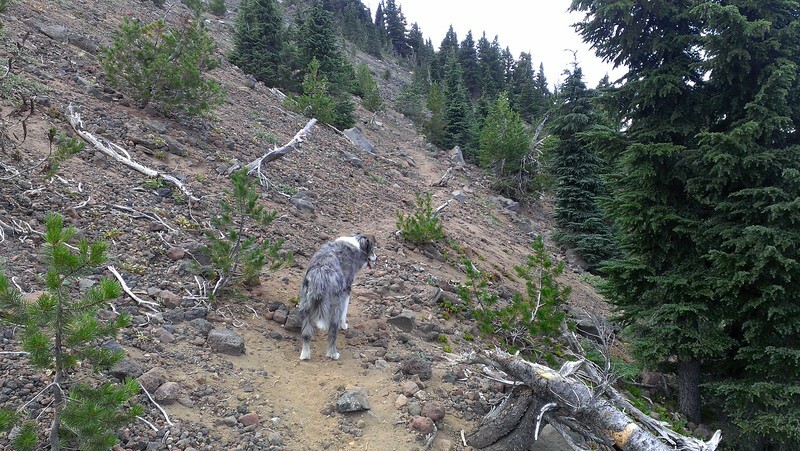 Although Bodie LOVES to go hiking with me, he is not terribly good around other people or dogs. 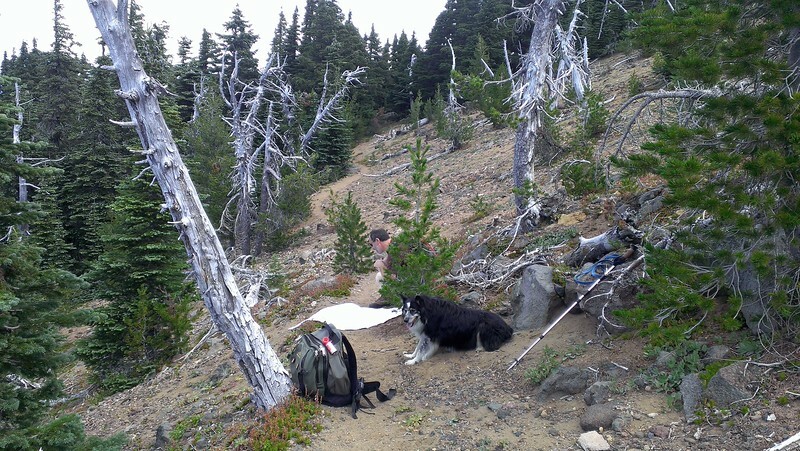 Kirk has taken Bandit with us on several occasions and he is a great trail companion. I thought (maybe) that if Bodie was not at home he might do better with other people and dogs. Turns out I was partially correct. If I let him off leash he could do his own thing and run away from other dogs – if I left him on the leash he got rather scared and snippy. It worked out OK, but I don’t know if I will take him on another group hike. He tends to do better when it is just me or the family. 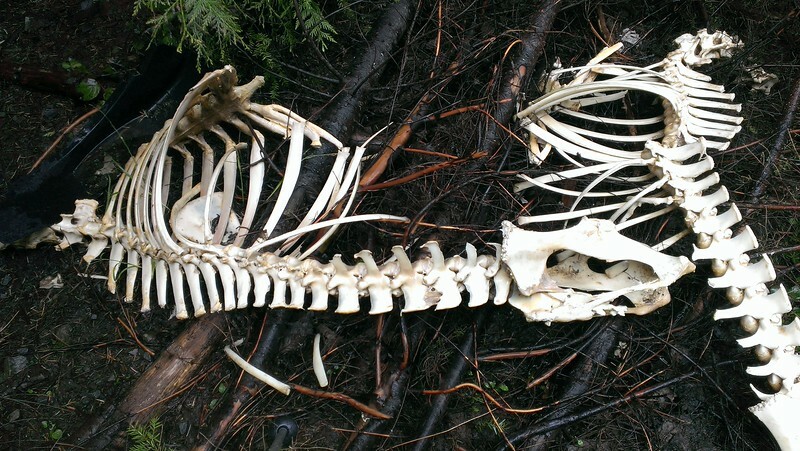 OK, back to the hike…. After eating some lunch and taking in the views one last time, we headed back down. 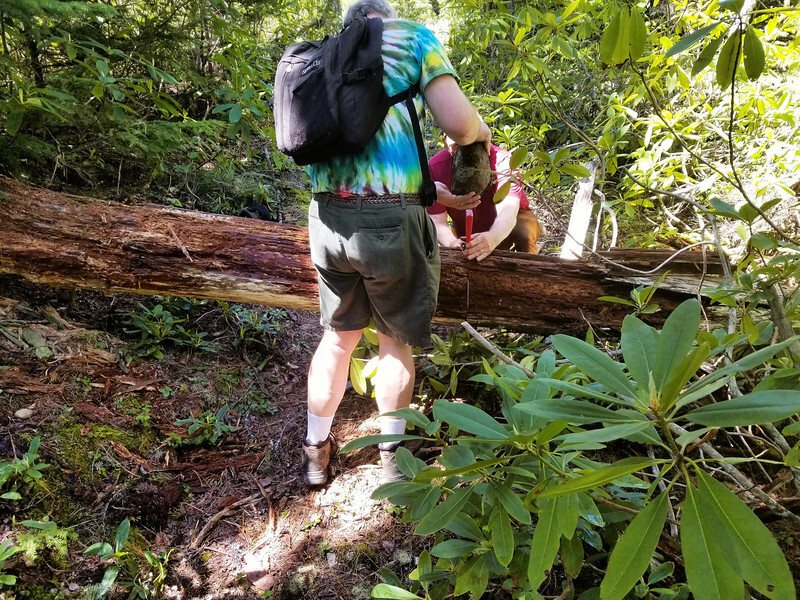 We did a little bit of trail maintenance on the way down, nothing major – just a little brushing and moving logs off the trail. We did hear one burst of thunder on the way down. Thunderstorms were forecast for the evening, and I guess they were correct. The trip down was much less strenuous than the trip up for sure. 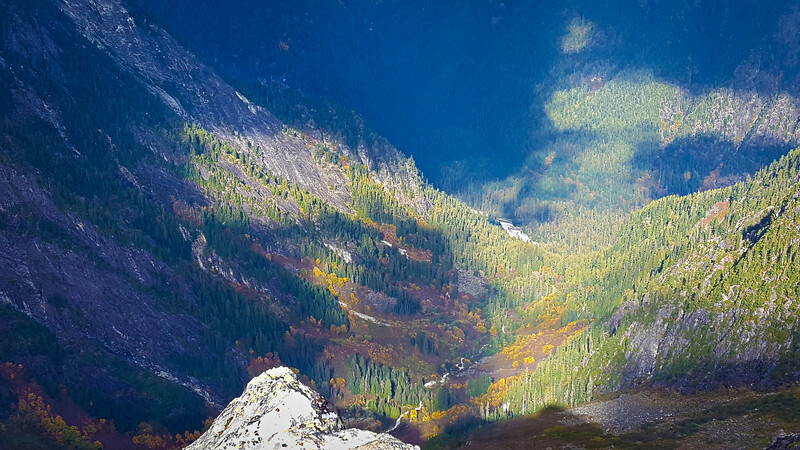 A great day – and a surprising hike. I would definitely do this one again. It is all about the views! 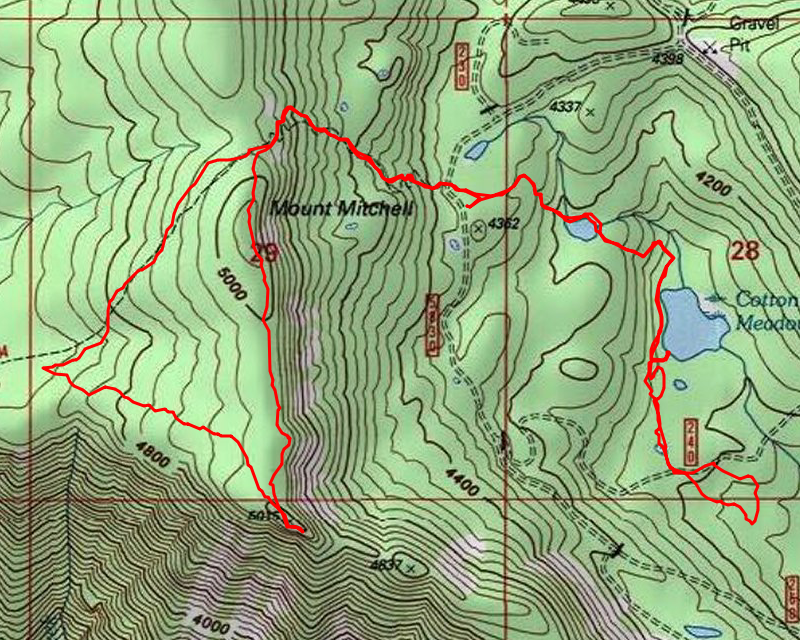 This hike was a re-do on one we tried to do about 2 months ago. 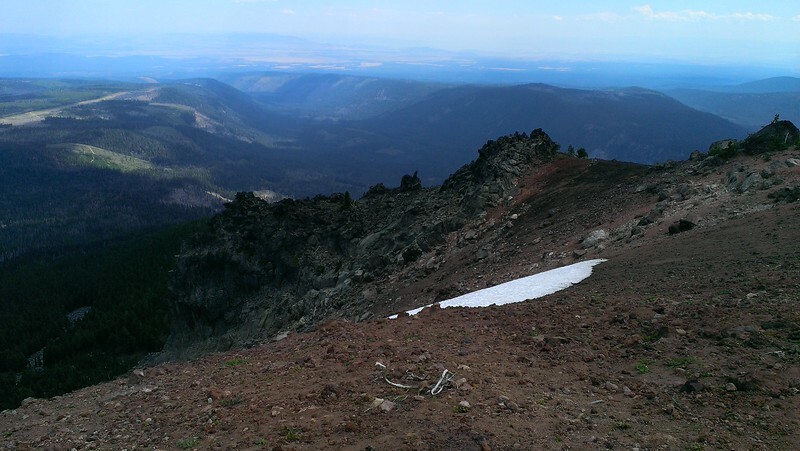 We were turned back by snowdrifts, so we did a “plan B” hike. 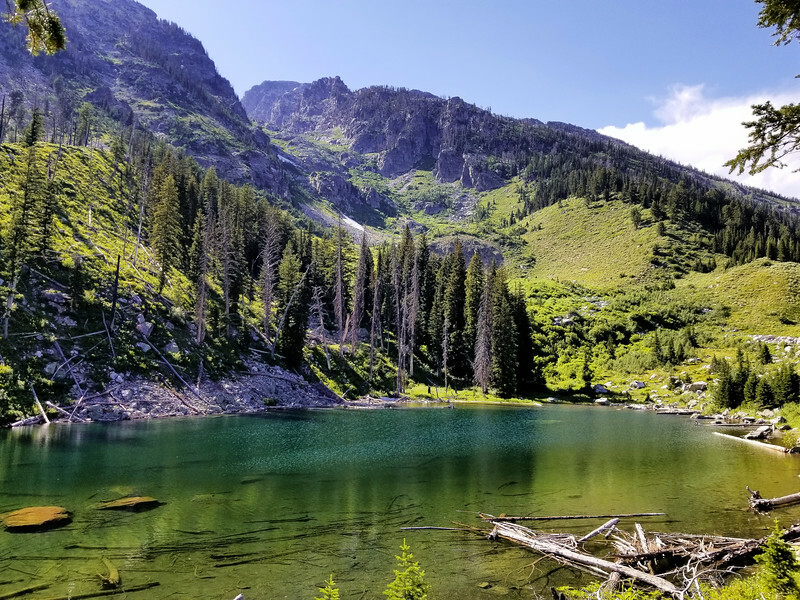 The intent of this hike was to find an easy way to get to Surprise Lake in the Fish Creek drainage. Since the roads were closed after the ’96 floods, this lake is very difficult to get to. 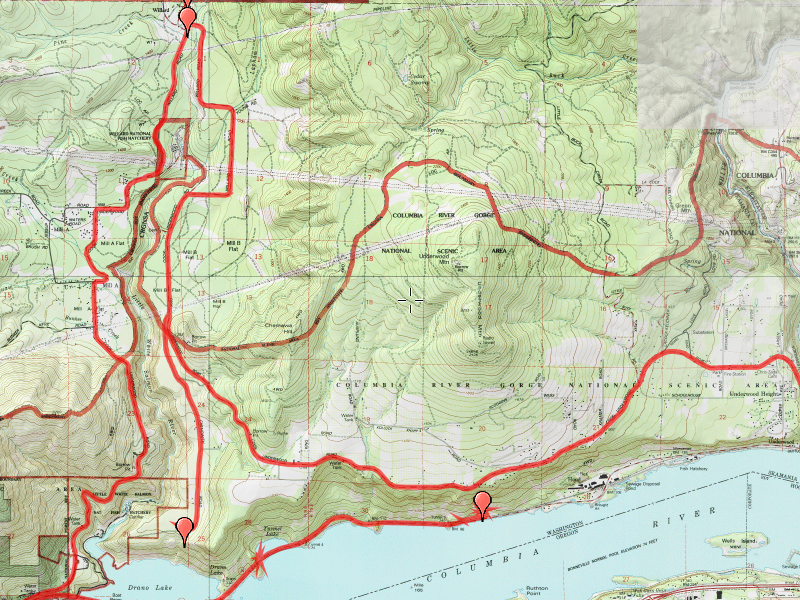 The plan was to drive out to the end of the road, then take the decommissioned road to the end – from there, the idea was to hike on the same contour line (same elevation) until we got to the decommissioned road on the other side. According to the map, that distance was only about 3/4 mile. Reality on the ground proved to be much different. 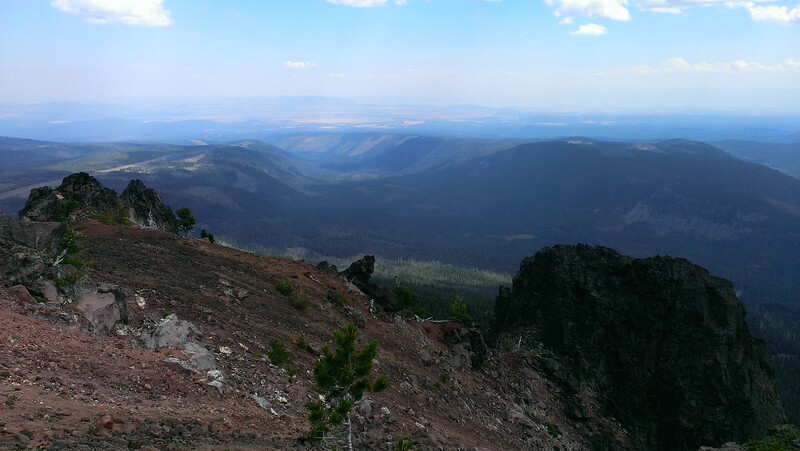 Once we enjoyed the views for a bit, we decided on a route back to our rig. 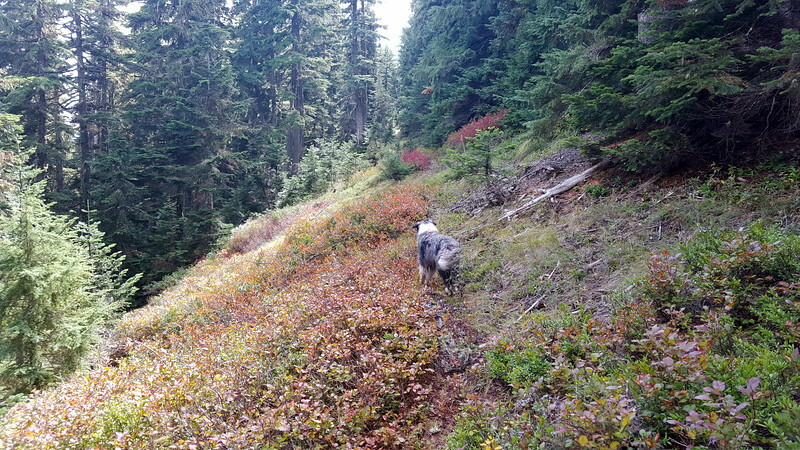 We decided to continue along the ridgeline, to keep out of the brush. This plan worked pretty well. Until the very end of our hike. 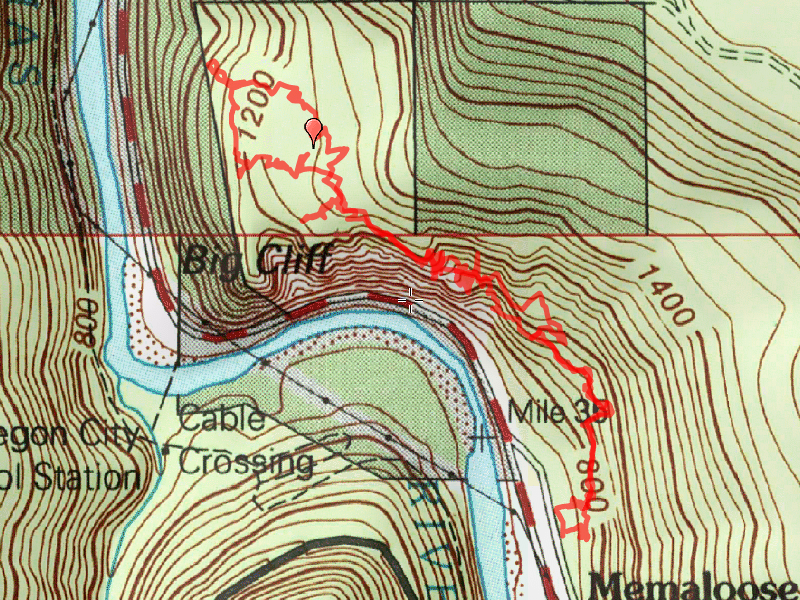 On the map, it looked like the ridge went down pretty easily back to the road. What we found was pretty steep. A couple of times we thought we might have to turn around, but very carefully and slowly we managed to work our way across rock faces and down a pretty steep hillside. We ended up about 20 feet from our rig! 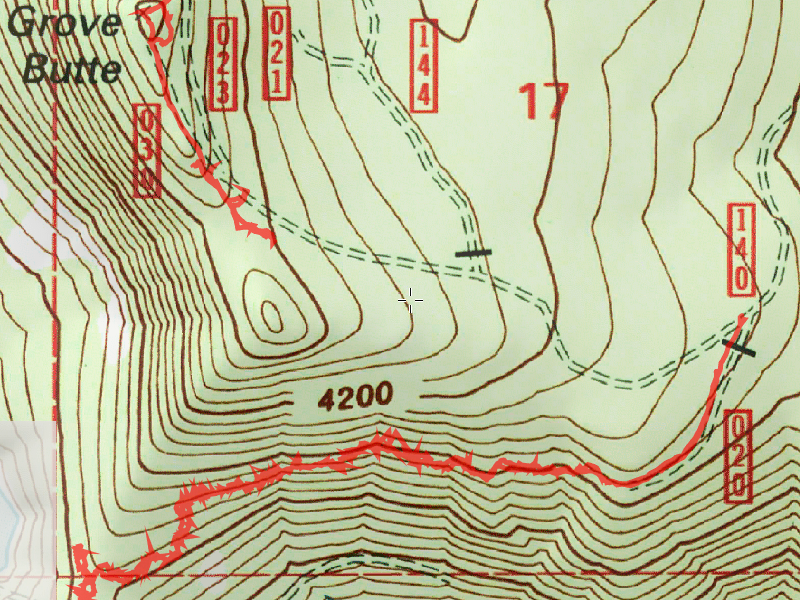 Nothing in the Fish Creek Drainage is as simple as it looks on the map. Don’t ever wear shorts when planning to go cross country. Going cross country always takes longer than you think it will. 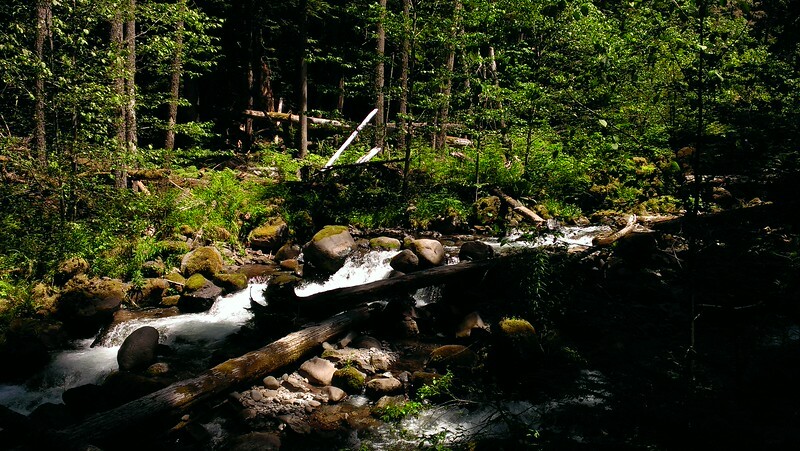 Fish Creek country is beautiful – but you have to earn it. 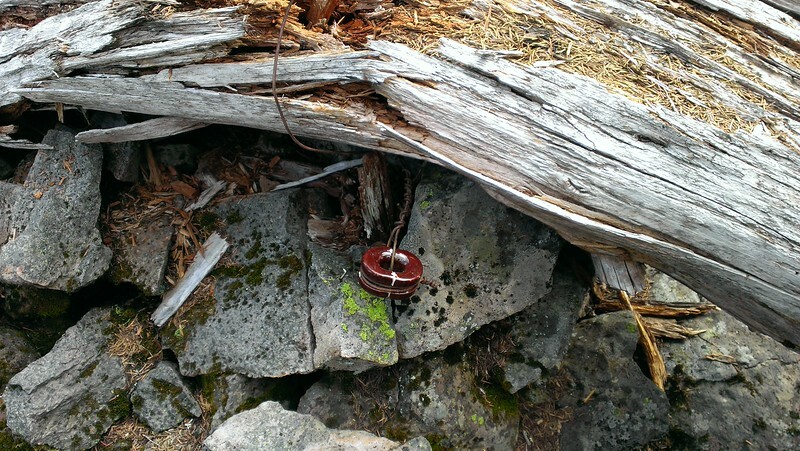 You never know when you will find a geocache (we found 2 of them!) even when you aren’t looking for one. We ended up getting back to the rig at about 6:30pm – about 4 hours later than planned. 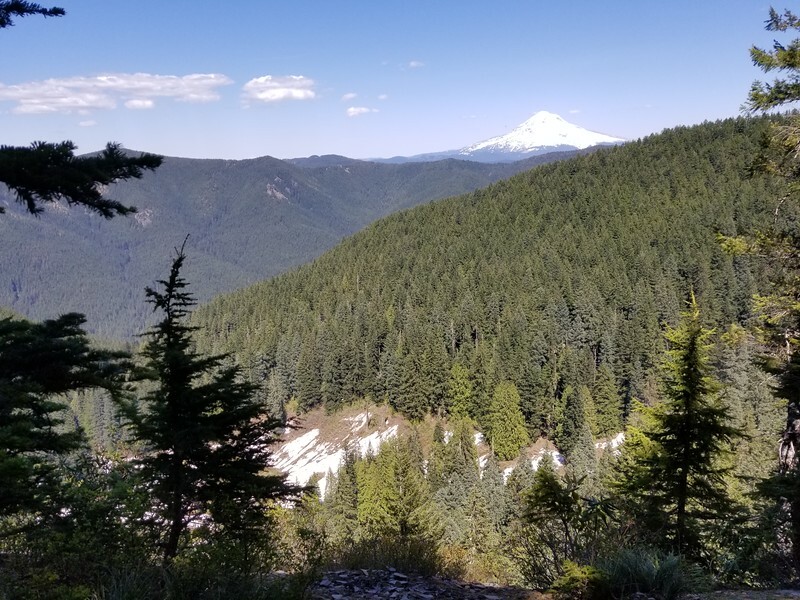 Since I was a bachelor all weekend, I had planned on hiking the Rimrock trail (a relatively easy task) on Sunday – but after this trek, I was too wiped out. I ended up staying home to recover. This was a fantastic (albeit very difficult) adventure on a fantastic day. The visibility was great, and even though it was exhausting, it was a bunch of fun. 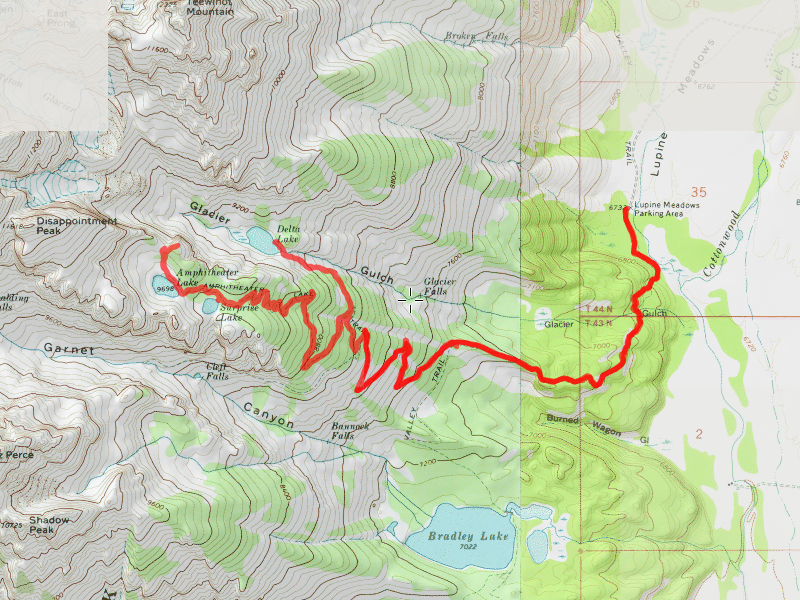 Today’s goal was to capture a good track of the Huxley Lake trail and to do a little exploring around the area. It was a beautiful day, not too hot, not too cold and sunny. What a great day for a hike! 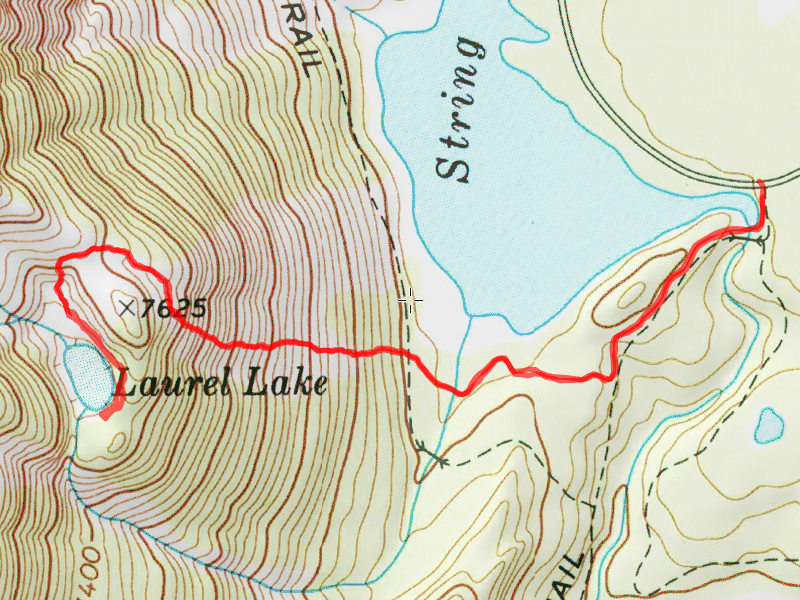 We started out at Lookout Springs about 10:00, and headed down the trail to Huxley Lake, passing the old corral (which I assume is what Corral springs was named for). At the junction, we started our steep downhill down to the lake. The trail is pretty steep (I should have gotten a few photos of it) due to it being abused by ATVs over the years. 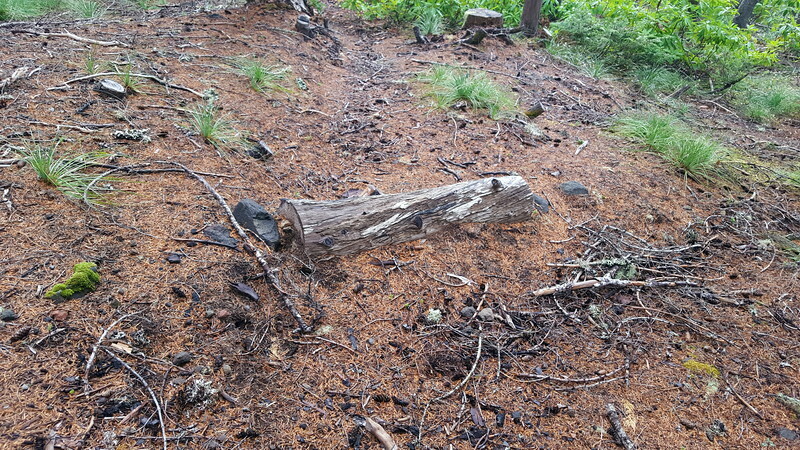 We believe we found remnants of the original trail that switchbacked down the hill a lot more than the existing trail does. 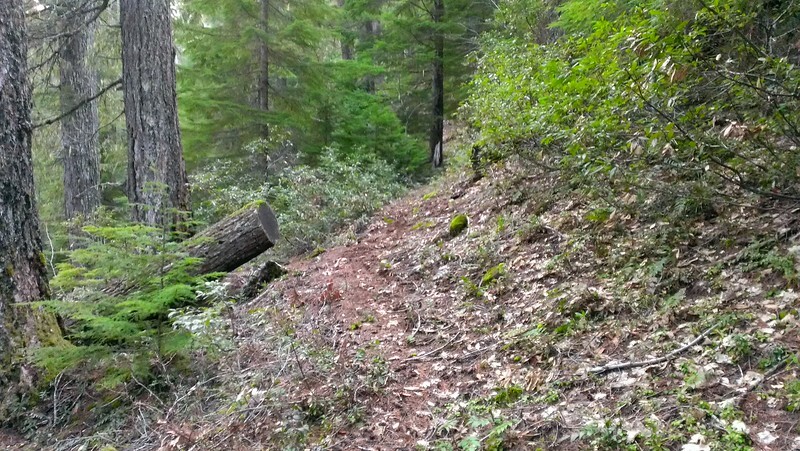 The existing trail just heads straight downhill in a lot of places. After enduring what seemed an endless series of steep downhill sections of trail, we finally came to the old road described in the trail guide. The trail to the lake takes off to the left, however we kept walking down the old road – I was trying to remember where I had gone the first time I hiked the trail. We made it all the way out to the 4612 road, which now has a huge “tank trap” on it to keep people off the old road. 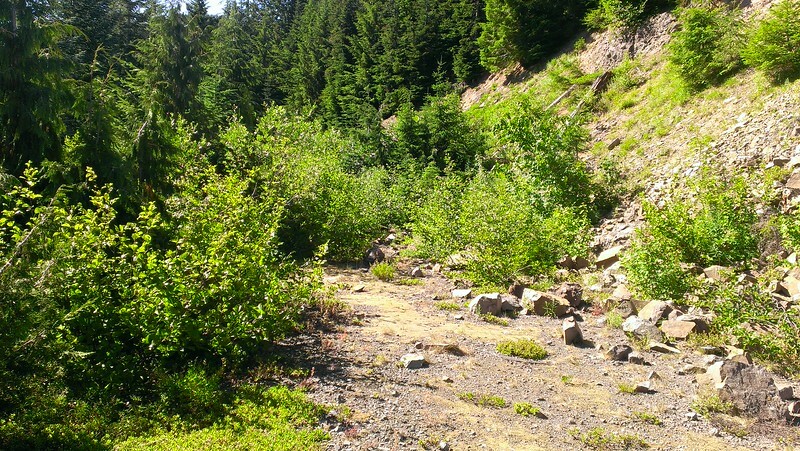 Once we found the old road, we headed back to the Huxley Lake side trail, which we followed down to the lake. We looked around a bit and had lunch at the lake. 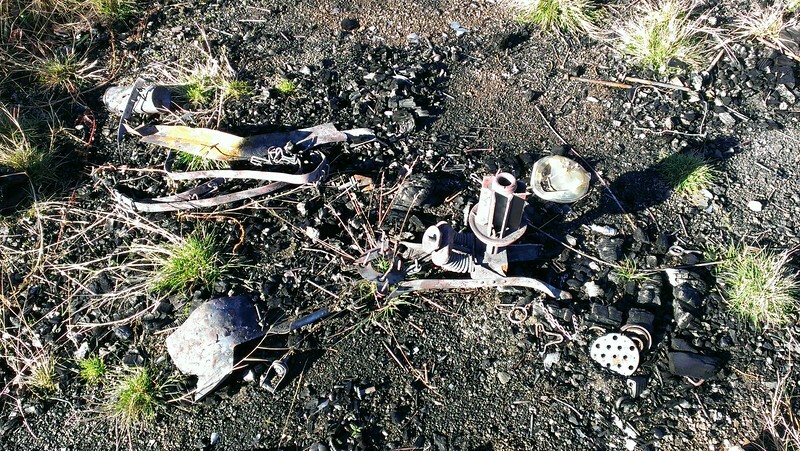 One interesting thing – there was a fire at the lake, and it appears as though it was caused by the campfire. 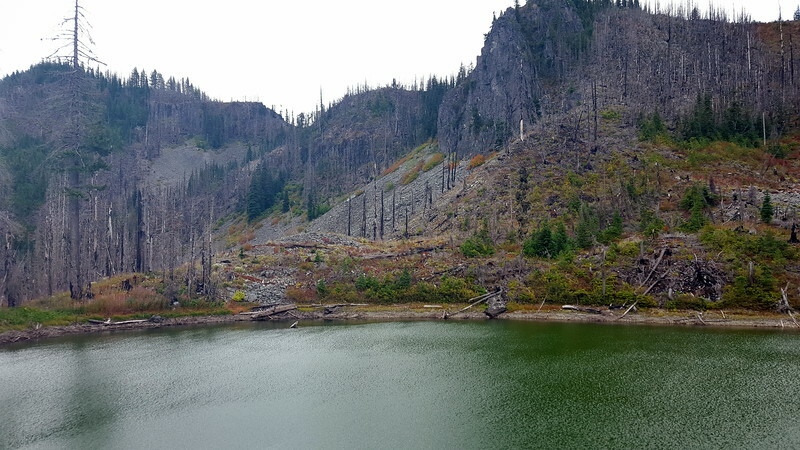 It looks like a “root fire” that smoldered underground and killed several of the trees, which subsequently fell over into the lake. It is a small and shallow lake, but it is pretty. I remember the last time I was there, there was a lot of damage from ATV riders around the lake. 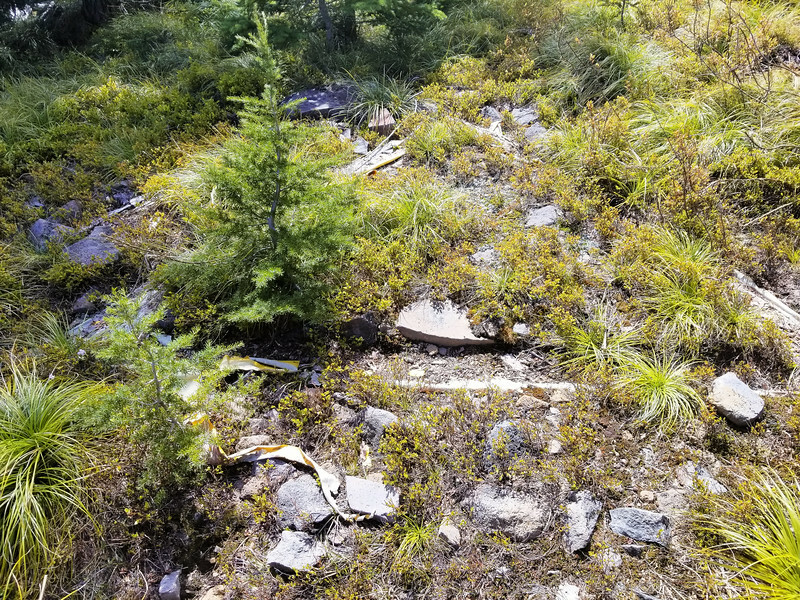 It appears as though some of that damage has been reduced over time, but you can still see the scars left by the ATV riders. 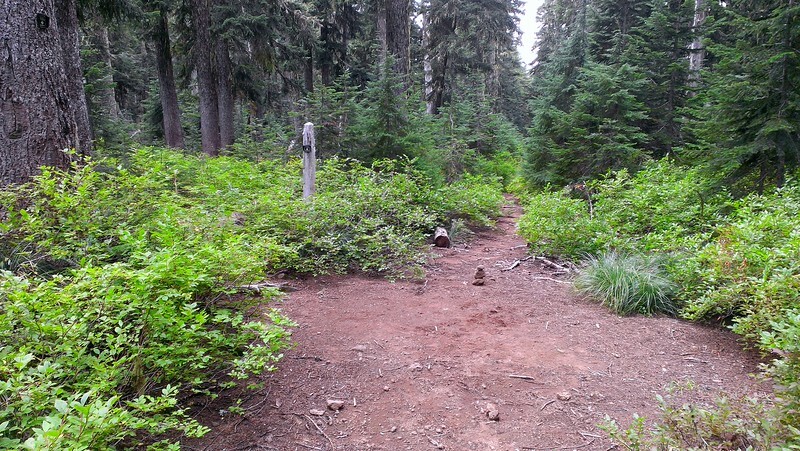 If you start at the 4611 end, keep right at the first trail junction about a half mile up the trail. The route to the left is an old trail which leads back towards Winslow Pit. You can come in from this direction on this unofficial trail (a re-use of a segment of an old trail) if you like. It starts on the left at the crest just before the end of the 4611-136 spur in a recently harvested area, about a mile off the 4611 road before Winslow Pit. The 4611 road gets rough beyond Winslow Pit. 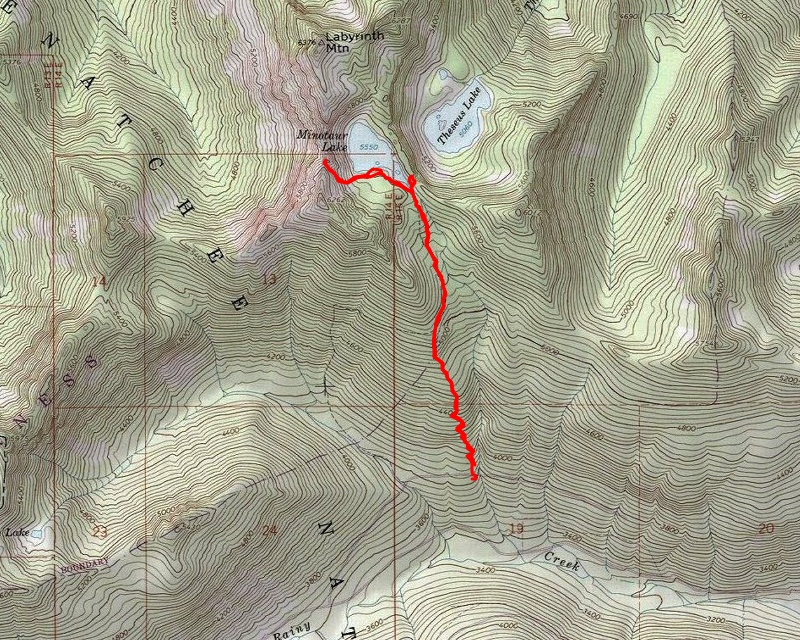 The alternate access is good road but will add a mile and a quarter to your hike. After filling up, we headed on our way, doing some trail maintenance as we headed up the hill (cut a couple of logs, did a lot of brushing of the trail, and kicked branches and rocks off the trail). After what seemed an eternity of steep uphills, (similar to the downhill section), we finally ended up on top. We made it back to the truck without incident – a little tired, but having a great day in the woods. We stopped at Fearless for burgers (we were both hungry!) – a great way to end the day! 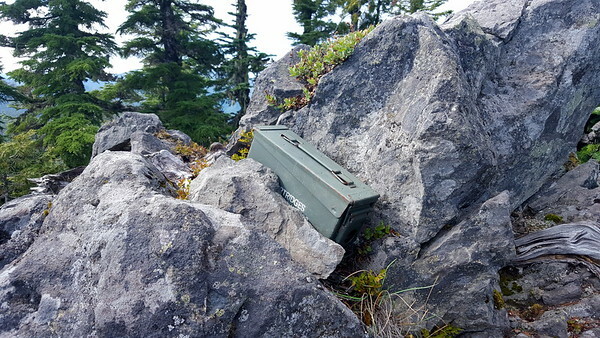 Today’s hike was setup by a couple of hiker friends, Brian and Paul. Paul was the one who took me on the “death march” a few years ago. It was a great trip, but it was quite a stretch for me to do. 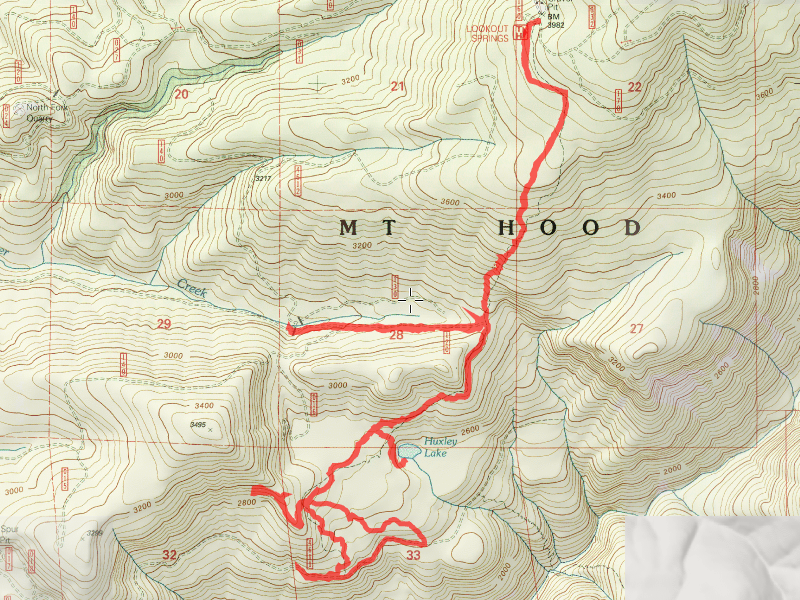 I think the day ended up as 19 miles and 5000′ of elevation gain. I made it, but it took a lot out of me. 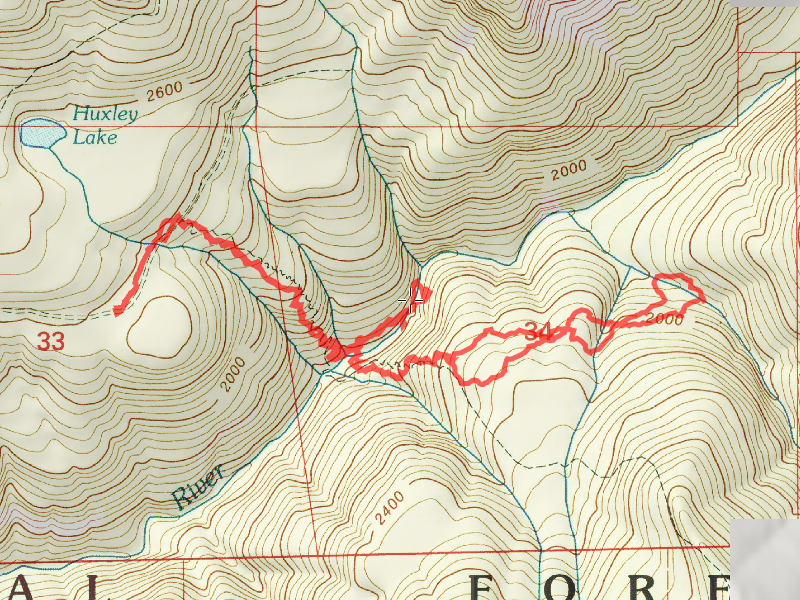 Anyway, the plan for the day was to hike part of the Grouse Point trail, see Parrywinkle Falls on the Roaring River, then cross the river and head up the other side of the canyon. 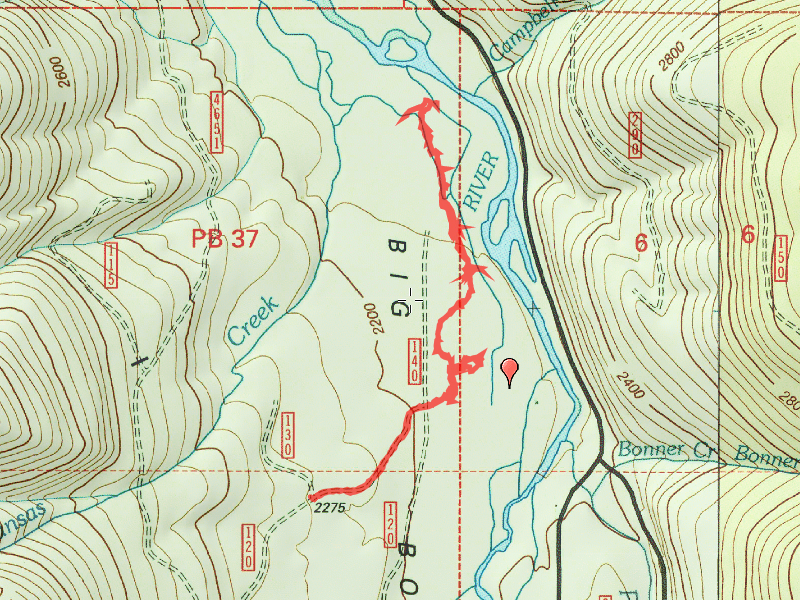 At some point, we were going to bail off the trail and head over to the South Fork of the Roaring River to see it and also to see if we could find any remnants of the elusive 511 trail or a waterfall that was supposed to be near the confluence of the two rivers. 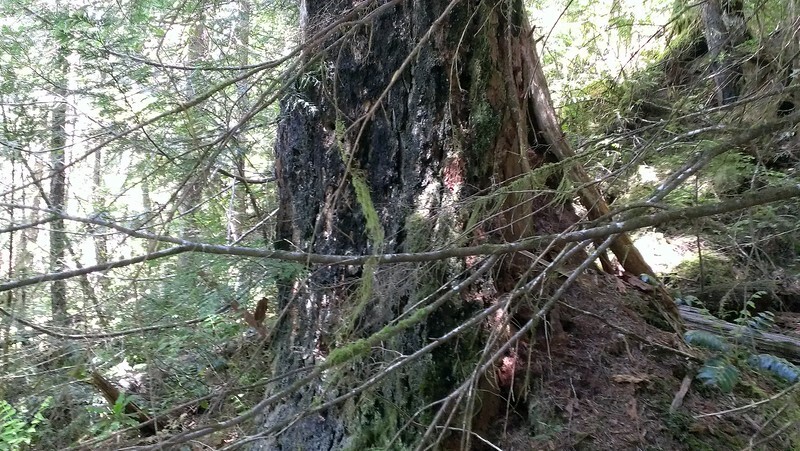 Which has to be one of the trees from the fire so many years ago (1920s?). 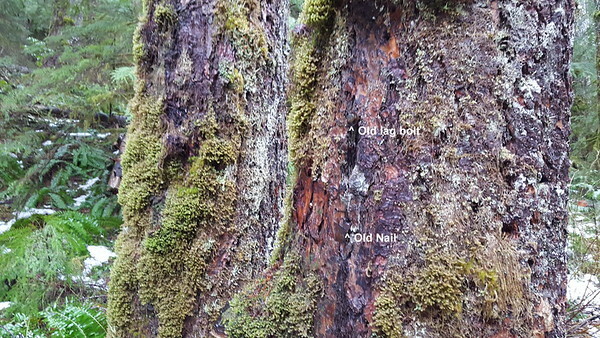 When it was alive, it was a BIG tree. Once we found the trail again, we made pretty good time back to the Roaring River. 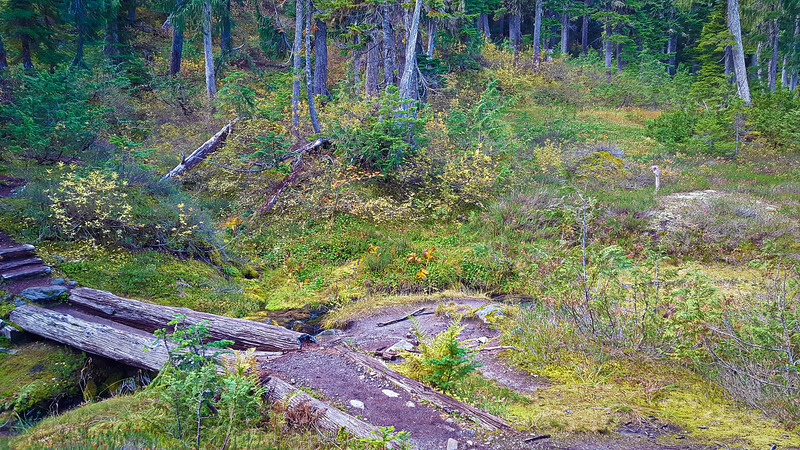 We all crossed the same way we came over – Paul and Kirk waded across and Brian and I crossed on the log. Once back across the river, it was time to regain all that elevation that we lost on the way down. It was tough, especially being at the end of the day. I continue to have breathing issues when doing serious elevation gain like this. I have to stop way more than I would like to catch my breath, but I eventually made it. I was at the back of the pack….. It was a great day, with great company and great weather. Couldn’t ask for a better day in the woods. 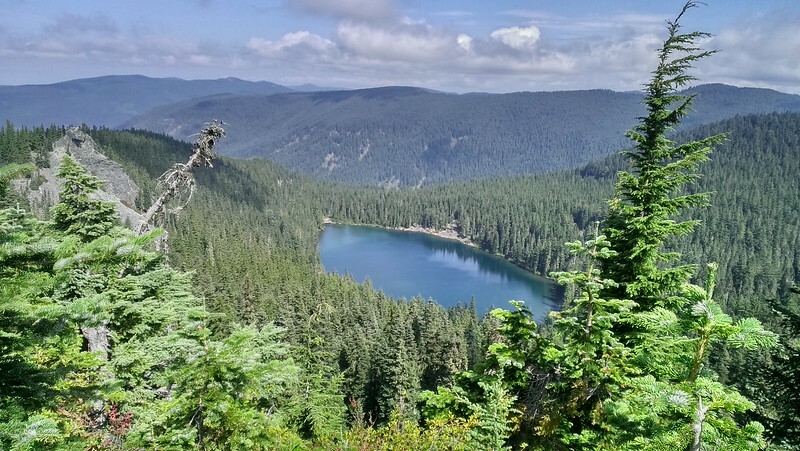 This trip was intended to be to further explore the Surprise Lake in the Fish Creek drainage (there are at least 3 “surprise lakes” in the Clackamas country). 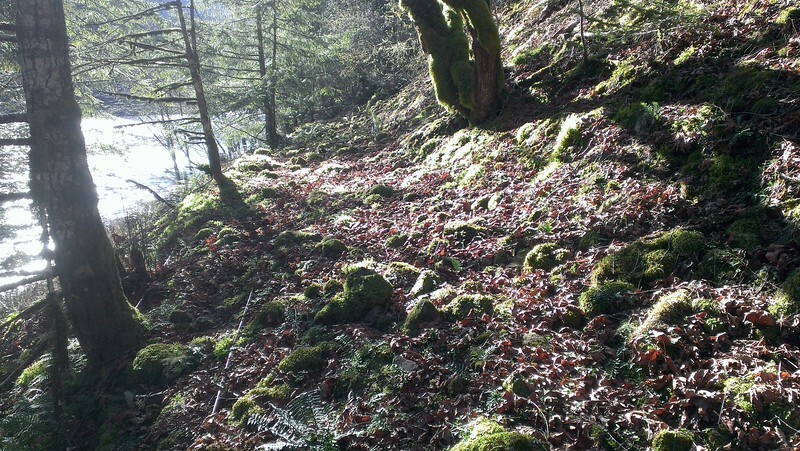 There is no trail to the lake, however there are still the old decommissioned roads in the area that lead to the lake. After some great sleuthing by Brian (who accompanied us on this trip), a potential route was found that wasn’t too long – ~2.5 miles each way, with only about 3/4 mile of cross country travel needed. The rest would be on old spur roads. 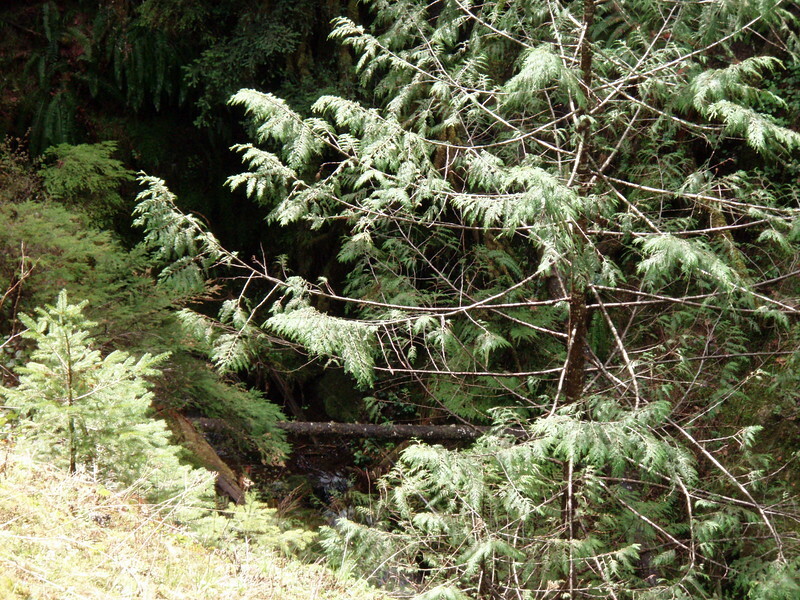 We passed Music Creek and there is a very interesting waterfall just off the road. We turned around and went back to explore this waterfall a bit. 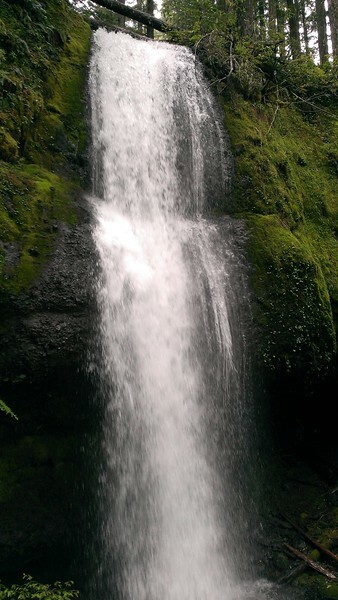 A short hike from the road brought us to this surprising waterfall which is about 60′ or so in height. It was running pretty wild on this day due to all the rain we have had. On lower flow days, you can rock hop across the creek and go into a cave behind the waterfall, but today the waterflow was WAY too much to attempt this (without getting completely soaked in the process – we were getting wet enough due to the rain all day long). The waterfall ampitheater is very interesting – not a typical place for a waterfall. It was just kind of a bowl on the side of the hill – beyond which looked pretty normal. Very neat place to visit. 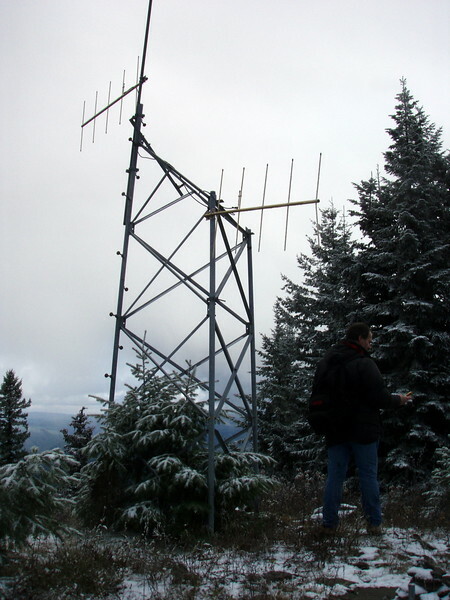 We walked up to the weather station there and explored a bit. 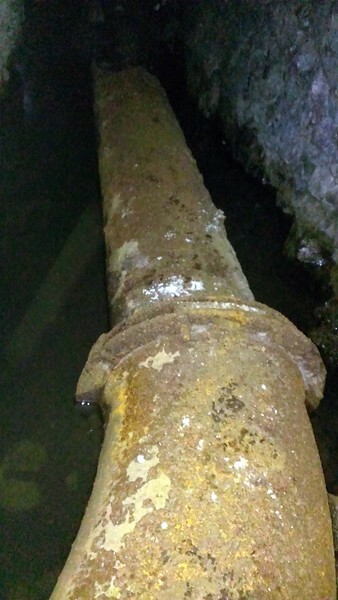 I found that the “conduit” that I had seen last fall in the snow wasn’t really a conduit. 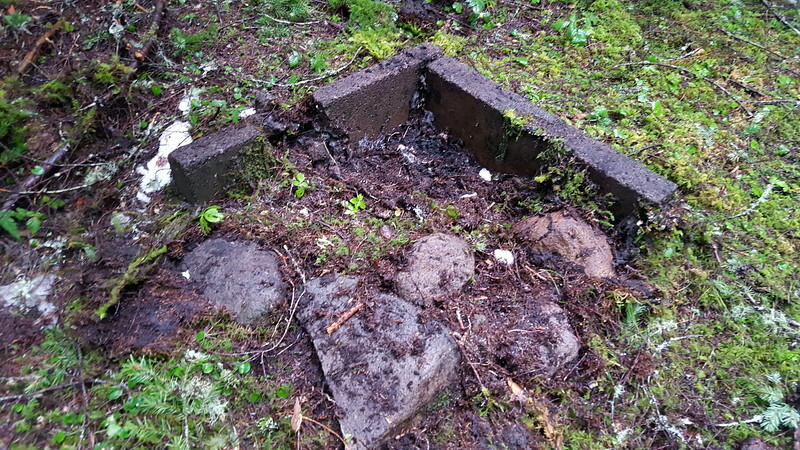 What I thought had gone into the ground was really just sitting there – essentially it was just garbage. Mystery solved. When we got there it was REALLY foggy and rainy off and on, but after being there for a while, the fog cleared out a bit and we got a reasonably good view across the canyon to Fish Creek Mtn, Whalehead and Camelsback. The clouds kind of came and went, but we had a pretty good view from a rock outcropping below the weather station. 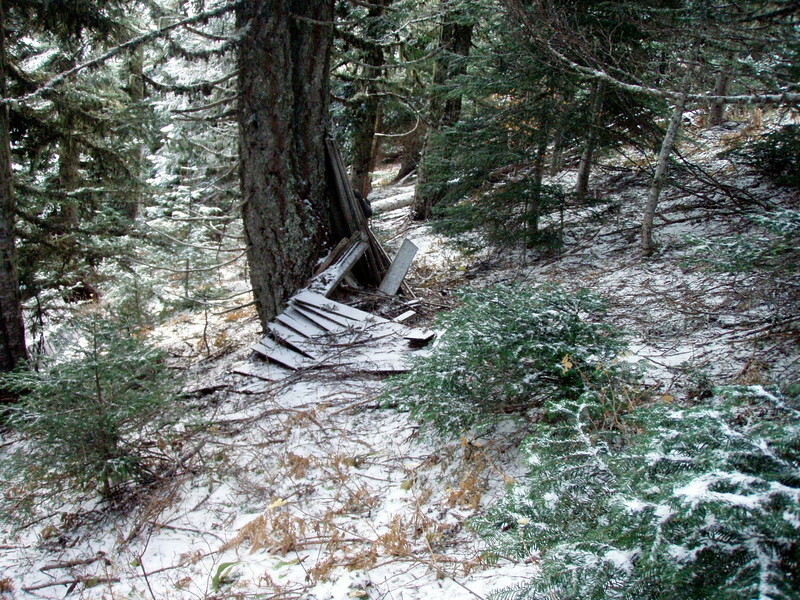 From there, we proceeded to head up to the “summit” of Wanderers peak on an old double track “road”. It led up to a campsite near the peak (it is pretty flat on top of Wanderers peak). 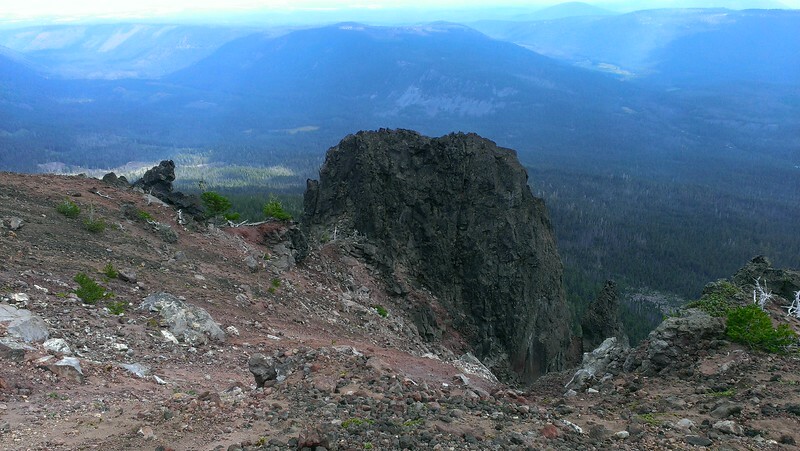 We found another rock outcropping and enjoyed the views for a while until a large dark cloud came in. We then started looking for the mystery trail. 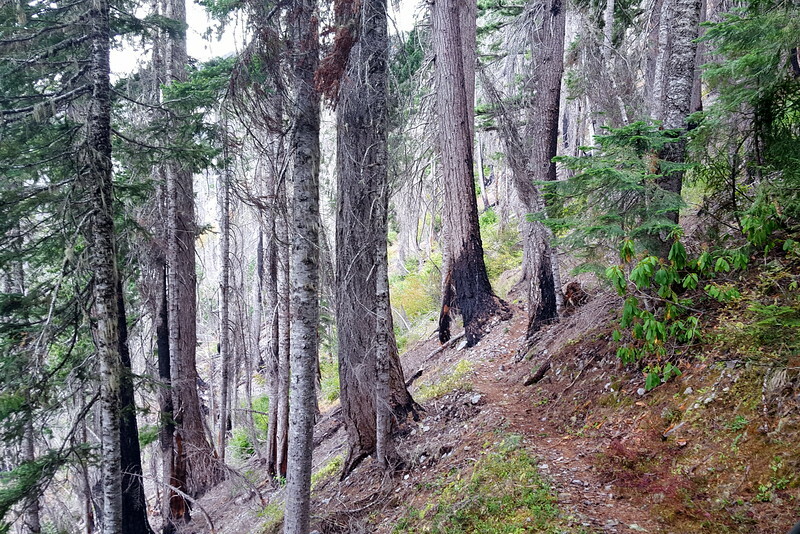 There are a LOT of small little “trails” up on top of Wanderers Peak – we wandered around a bit looking for tread, blazes or cut logs and were about ready to leave when Kirk found what he thought was a blaze (after traversing a particularly difficult section of rhodies and small fir trees). 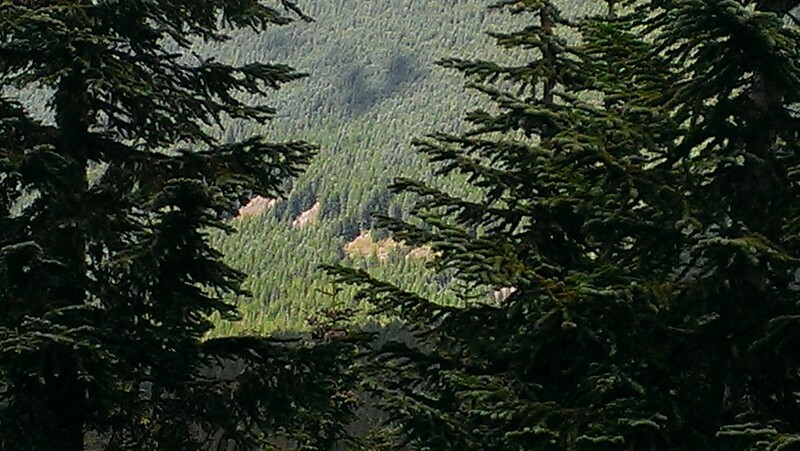 From there we continued north along the ridge, looking for blazes and cut logs. 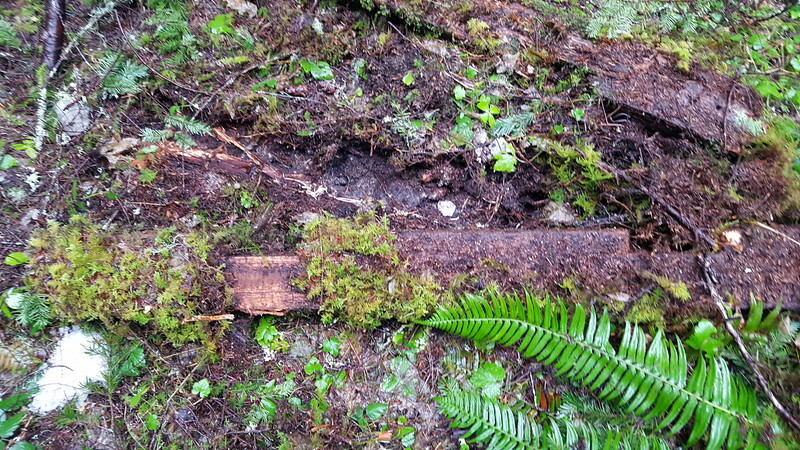 We found virtually nothing of existing/recognizable tread, but we did find quite a few blazes and a few cut logs. 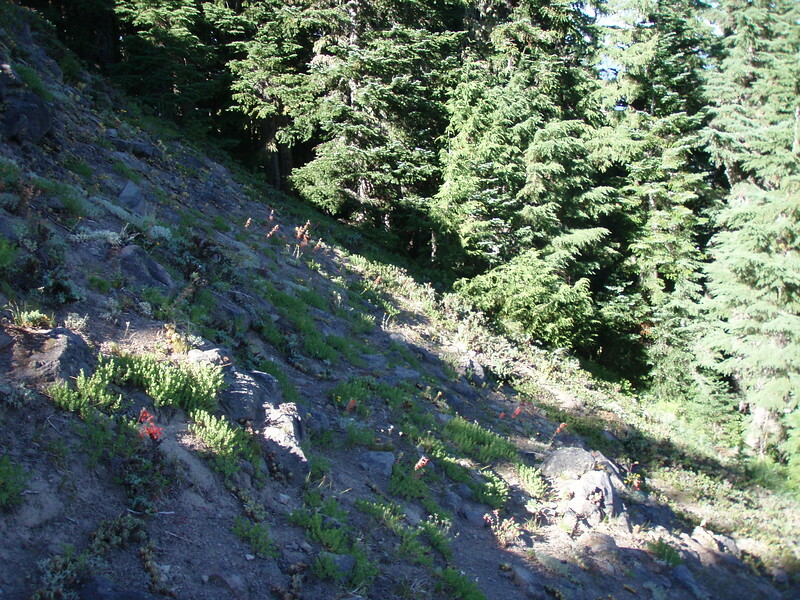 The terrain is relatively flat open as it progresses down the ridge. After progressing down the ridge a ways 3/4 a mile or so, the wind and rain was picking up, it was getting a bit late, and we started hearing thunder in the distance. 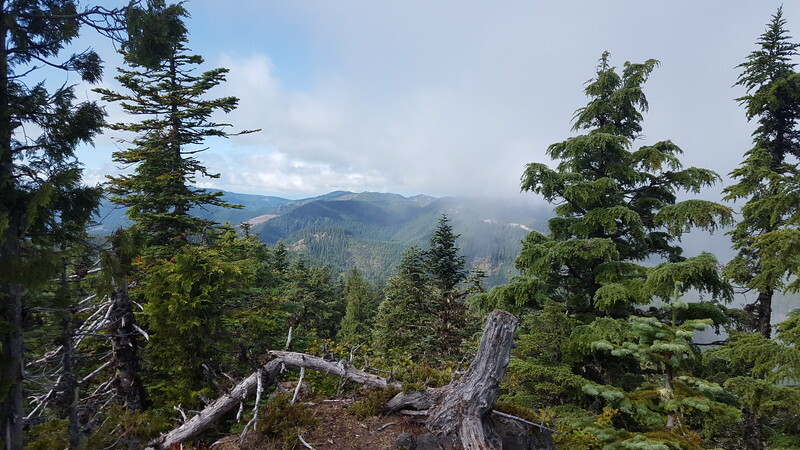 Rather than continue looking for trail and going cross country, we opted to walk down the spur road to the end of the ridge. From there, we went downhill to road 45 through some rather dense reprod. Once on road 45, we walked back to the spur we parked on then up the spur. 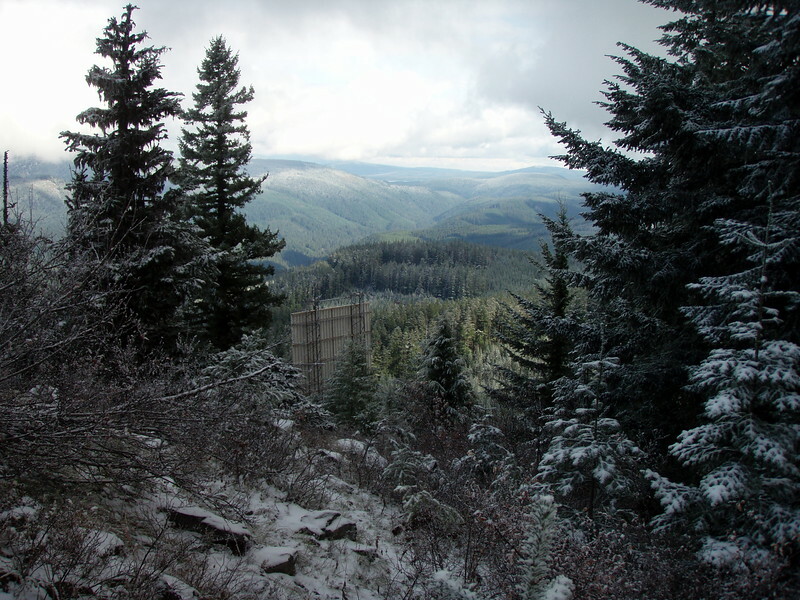 On the way up, there is a small spur to the east where we stopped and took in another view of the Fish Creek drainage. It was sunny for a bit, but then quickly turned back to drizzle and then rain, so we packed up and headed back up to the truck. All in all, it was a great salvage of a day after a disappointing start. 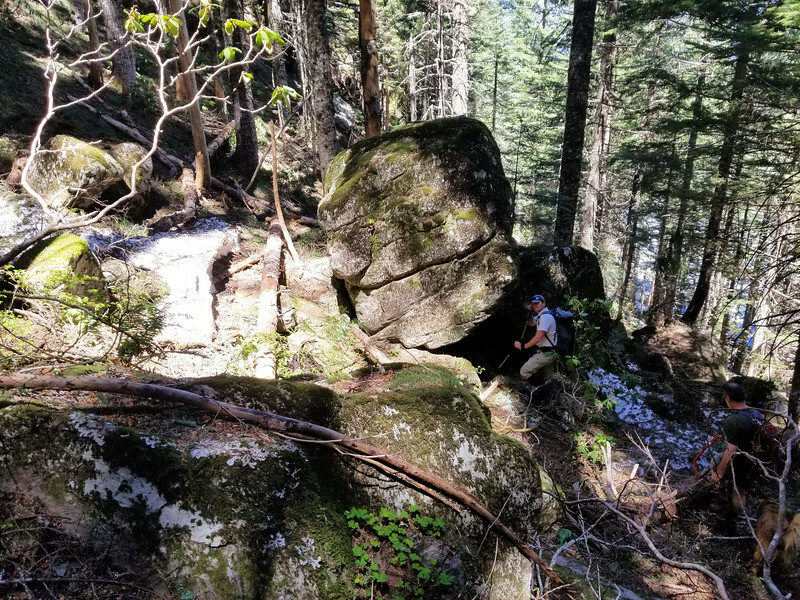 The waterfall, the views of the Fish Creek drainage and finding some good evidence of the old trail made for a wonderful adventure. And to top it all off, the weather wasn’t nearly as bad as I thought it might be. It probably only rained half of the day, and most of the rain was pretty light. 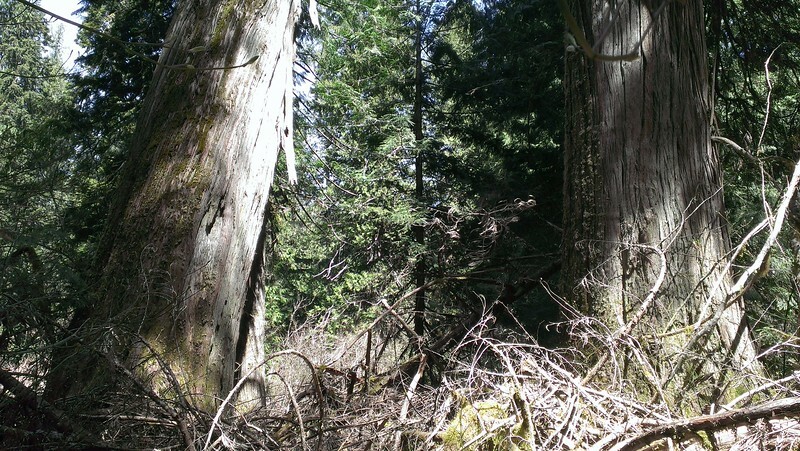 This hike was round two of trying to find the largest cedar (Western Red Cedar?) 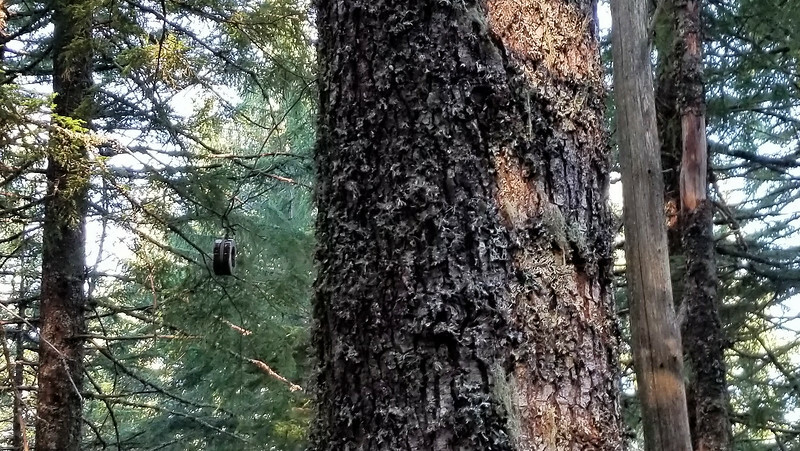 tree in Oregon. The last time I went (two weeks ago), I was unable to find it. So I went back to Big Bottom today looking for the giant. On the way down, I did some clearing of the old road to make it easier to pass. There were some downed trees and hanging branches that were annoying. I recently purchased a replacement pair of loppers after breaking my old pair, and also purchased a small pruning saw to deal with limbs larger than my loppers can handle. They worked well in clearing out some of this debris and it should be easier passage down the road now. This is actually my third trip down into Big Bottom. I went down there several years ago on a very hot day to try and find the record holder. I realized after I made that trek that I had gone down the wrong spur road. It was an interesting trip, but was not fruitful obviously. After my prior trip two weeks ago I reviewed GPS coordinates someone had sent me and compared it to my track from last time. I was convinced I was on the right track last time, I just didn’t go far enough. That made me want to try again! 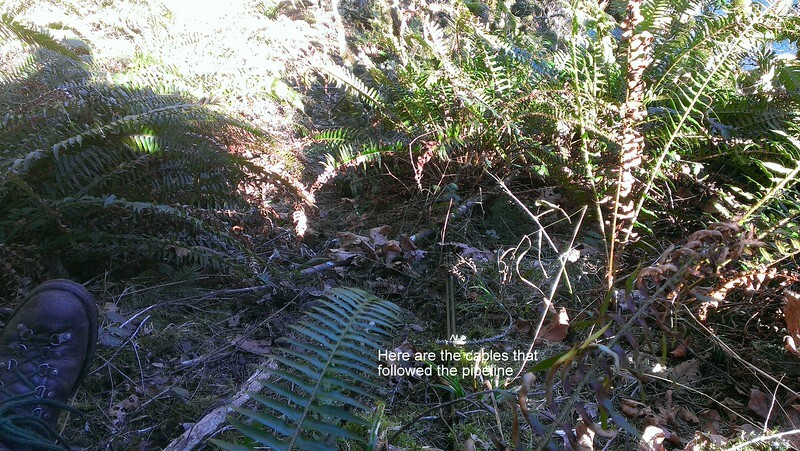 There is supposed to be a “faint trail” that heads off from the old road, however I was not able to find it last time. This time, I think I did find the beginning of it. There was a flag (kind of hidden) right on the corner where you start heading north on the old road. It is right where the turn starts, however it was kind of hidden due to all the new, young trees growing up – I was amazed at how many young trees were in this area. I started up that way, and found another flag, and another, and another. I cut out a trail between the flags that should be easy to follow. The bad news is that the flags (and any semblance of a trail) stopped as quickly as it started. Since I could not find any other flags, and I wasn’t sure where it should go, I stopped cutting. There were so many places I thought might be a faint trail, but I’m pretty sure they were just game trails. 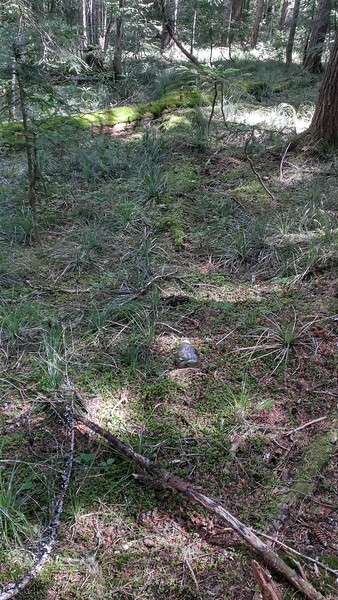 There was a LOT of sign of elk and deer in those woods….. Anyway, I came to two trees at the coordinates I was given, but I don’t think either one was “the” big one. I looked around a bit, saw another one nearby, but I don’t think it was any bigger than these two. I was just about to leave when I saw another giant kind of “over in the corner” of the grove. I went over to look at it and took a photo. I still wasn’t convinced I found it until I looked at another photo of the giant and compared it to mine. I think I found it! 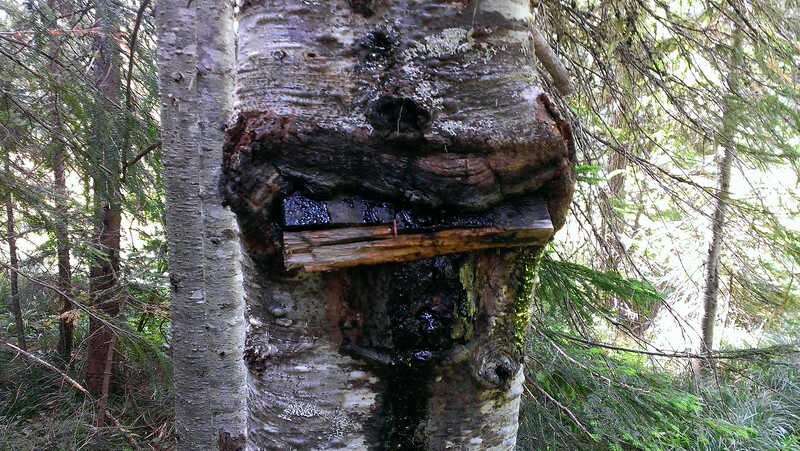 There were some telltale signs – two gashes on its bark. This was a monster of a tree! 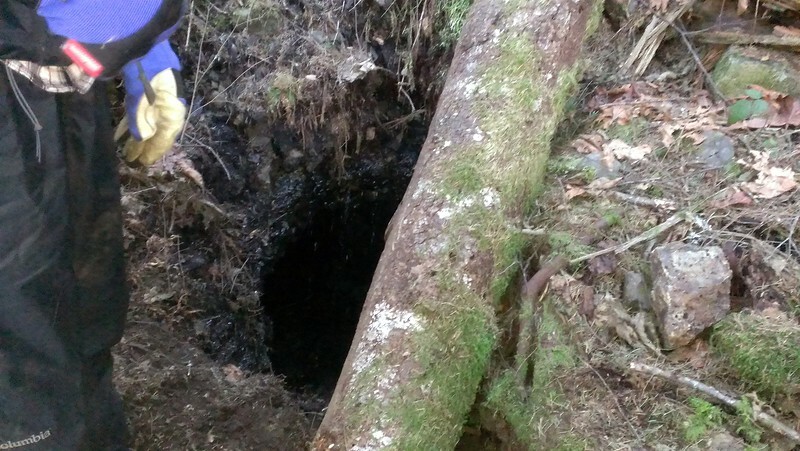 My Guess was 12+ foot in diameter (more if you measured it at ground level due to the huge root ball). 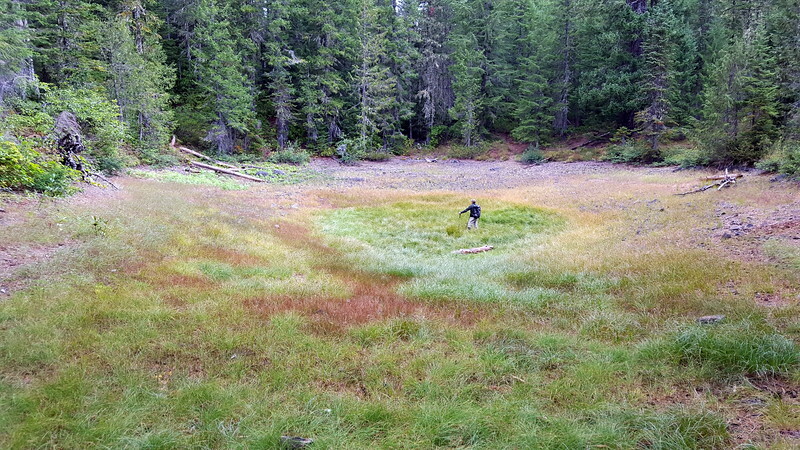 But there were LOTS of HUGE trees in that basin. Just AMAZING. After taking some photos of the tree it was time for lunch. 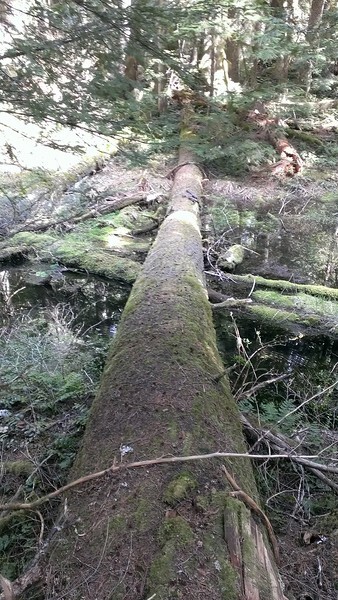 We had lunch atop a downed cedar that was probably 5’+ in diameter. That was a really neat place to eat lunch. The only way I got on top was because it was next to another tree and it helped me get up on top. After having lunch, it was time to head back. 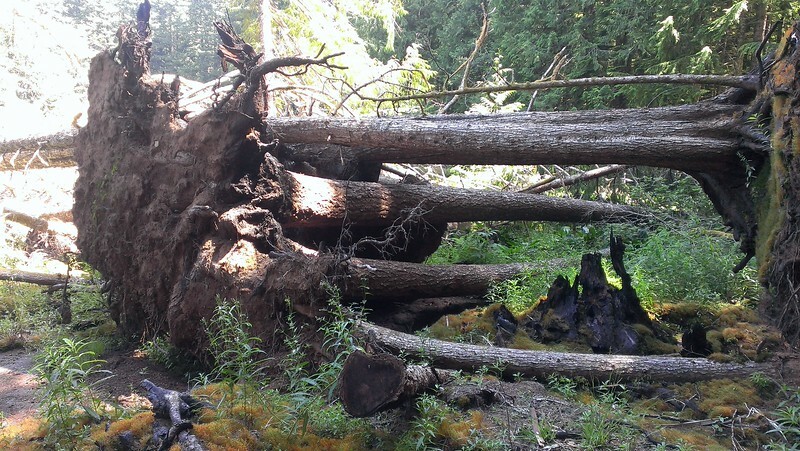 You really have to pay attention to where you are going because it all looks very similar – having to navigate around all those HUGE downed trees makes travel difficult. It was a short day of hiking, but a great day. 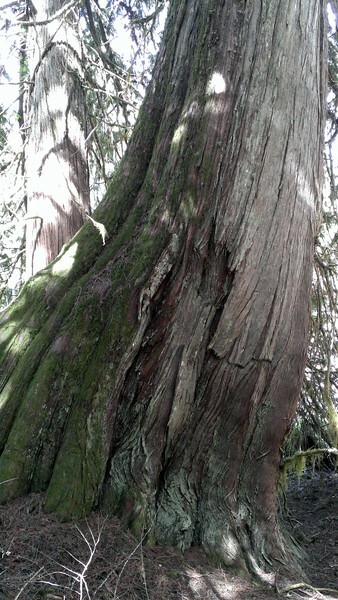 Another wonderful day in the woods, and a great accomplishment to see the largest cedar tree in Oregon! This is a really cool waterfall – a very unique amphitheater with three separate water “falls” – two from the river (it splits into two streams at the top), and one on the side from a creek. The water was running so fierce today it was really roaring and churning as it hit the pool at the bottom. After heading uphill looking for tread (and feeling like a goat since it was so steep) we decided to head farther north to see if we could find more trail. We ended up stumbling back across the trail! 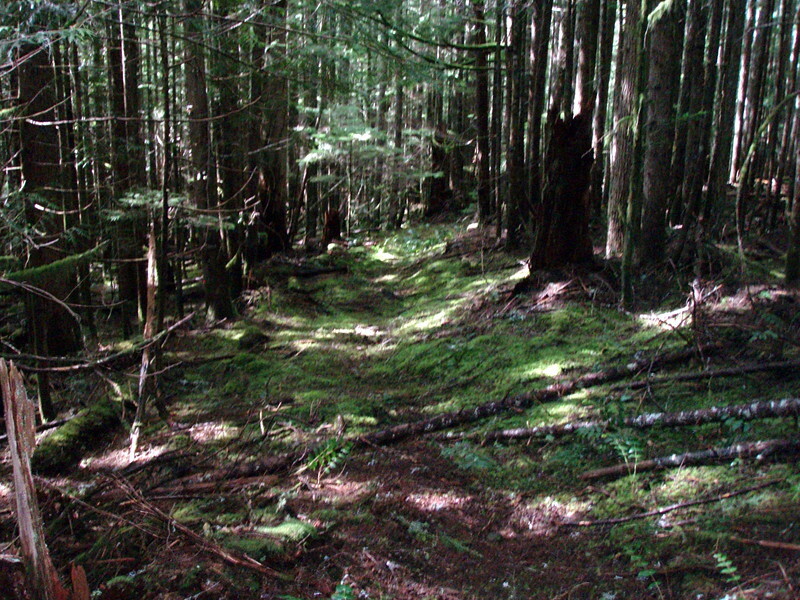 From this point, the trail was actually really easy to follow for the most part, with blazed and well defined tread. Once across we did our final bushwhack back to the campsite and trail, and then headed back uphill to the car. I have to tell you, that hike back uphill seemed a lot longer than I remember it! I’m sure it was because I was so tired. 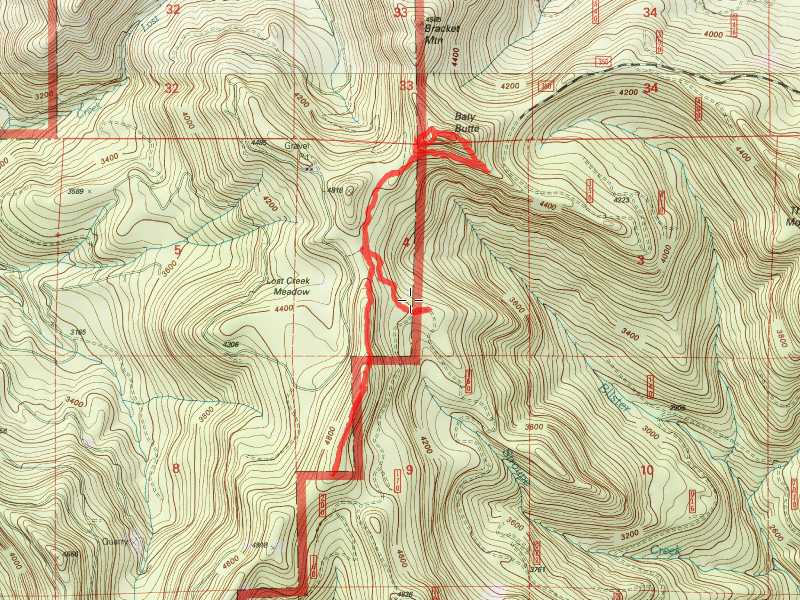 This was more bushwhacking than I’ve done in quite some time, and all of it was rather difficult. Very brushy, lots of trees to crawl over or under. It was good to get back to the car and rest my weary legs. I slept very well that night. 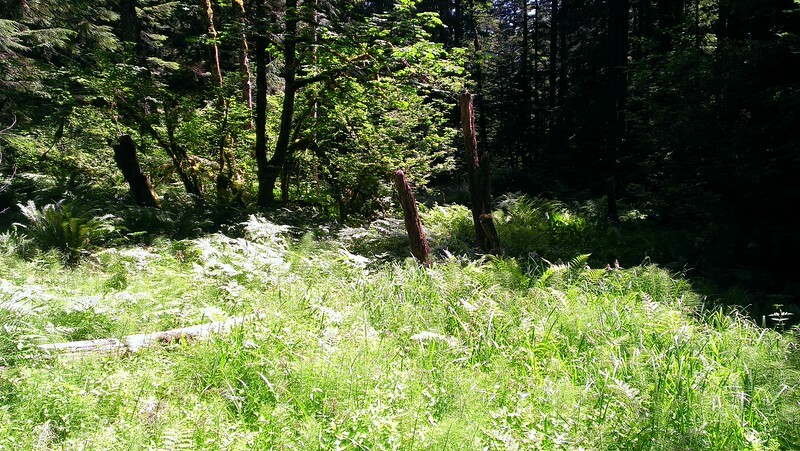 The abandoned trail on the east side of the South Fork Clackamas River deserves some attention. 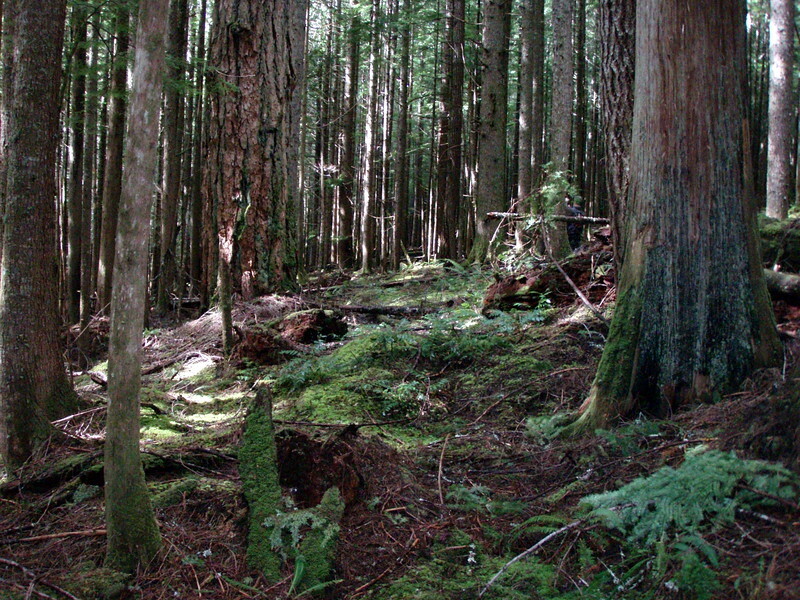 It is in really good shape other than the blowdown areas and goes through some absolutely beautiful forest. That will have to wait for another day, however. 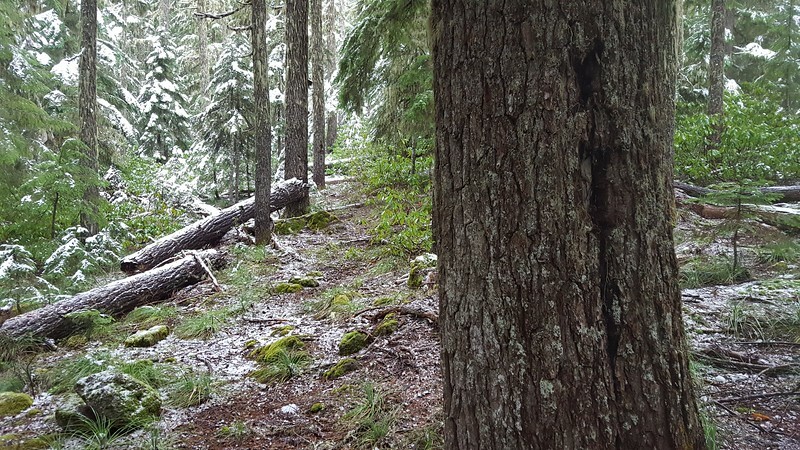 Weather during Hike: Take your pick - Snowy, Rainy, Windy, Sunny - it had it all! 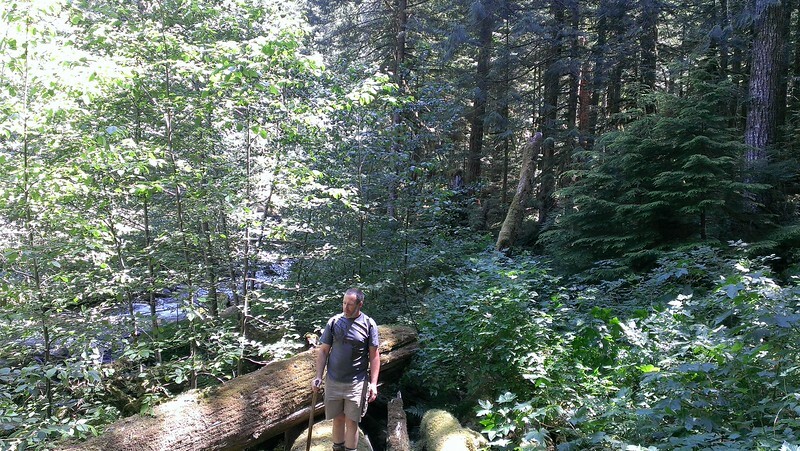 This was a hike into the old growth grove of Big Bottom on the Clackamas River. 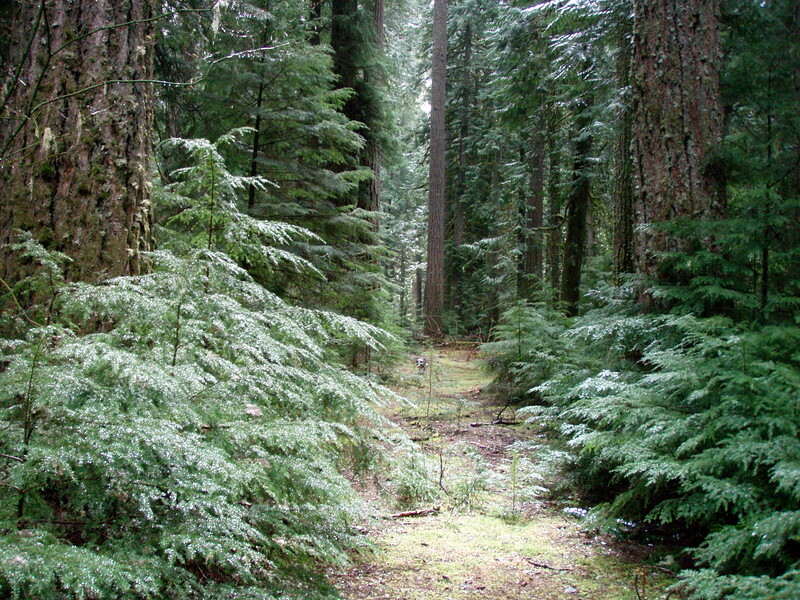 This low, flat area has a lot of old growth fir and cedar. 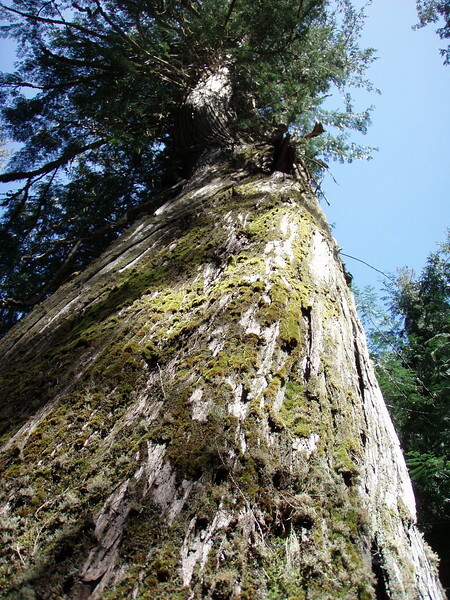 It is supposed to contain one the largest Western red cedar in Oregon – I’ve heard it is pretty big, and reminds you of the redwoods in California. I had done this hike a few years ago – I think it was on my birthday – I remember it being a VERY hot day – something like 100 degrees in town. I remember it being cooler at Big Bottom due to the shade and humidity of the area, but it was still pretty warm. 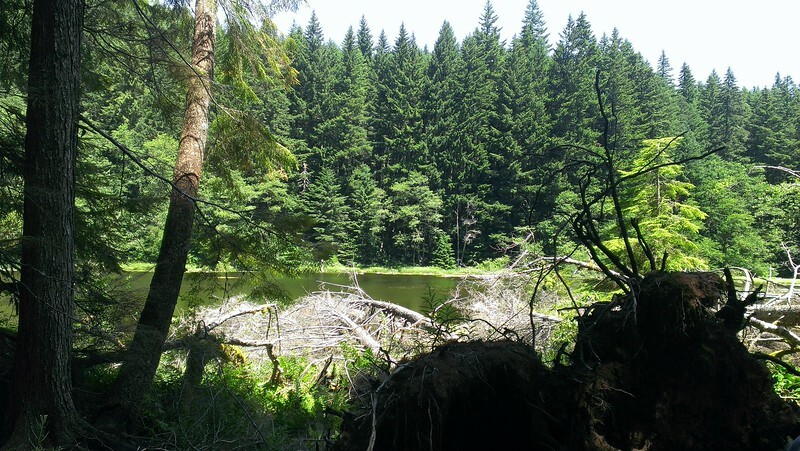 I was trying to find that cedar tree then, and I wanted to come back to try and find it again. On to this days adventure. I was surprised when I got to the starting point. It had snowed overnight! We hiked about as far down the road as we could. 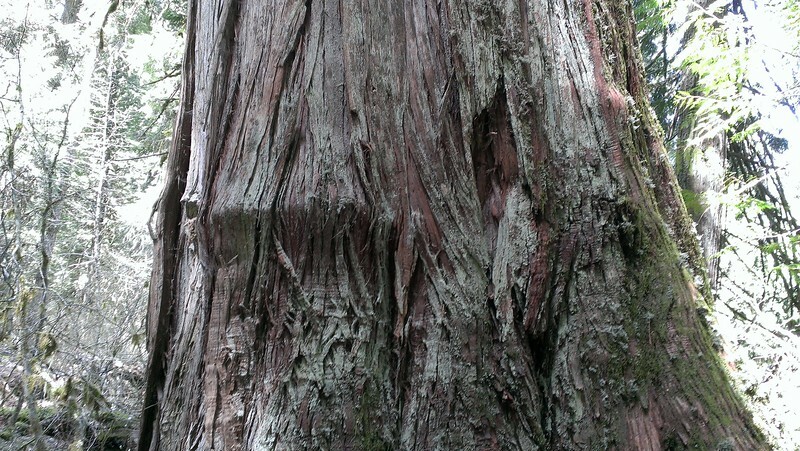 The major objective for the day was to try and find the cedar giant. 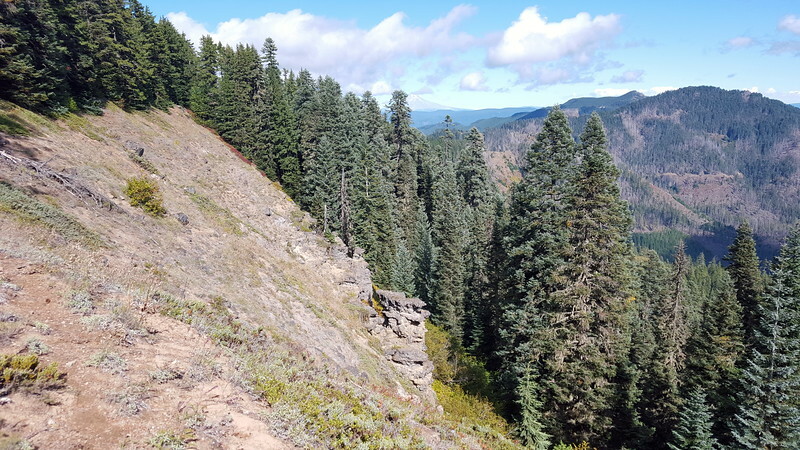 Once it seemed we had definitely gone too far north, we turned around and continued to search for the “faint side trail” that was supposed to lead us to the giant cedar. 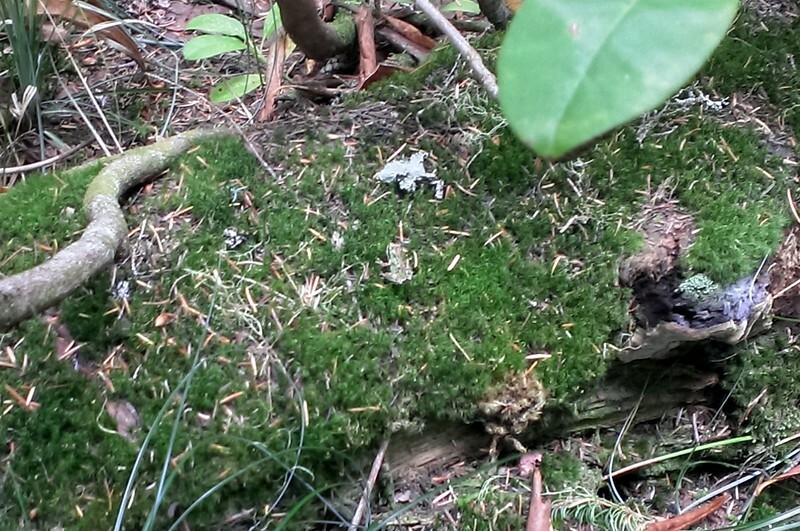 I knew it would be a tough bushwhack, but I was determined to find it. 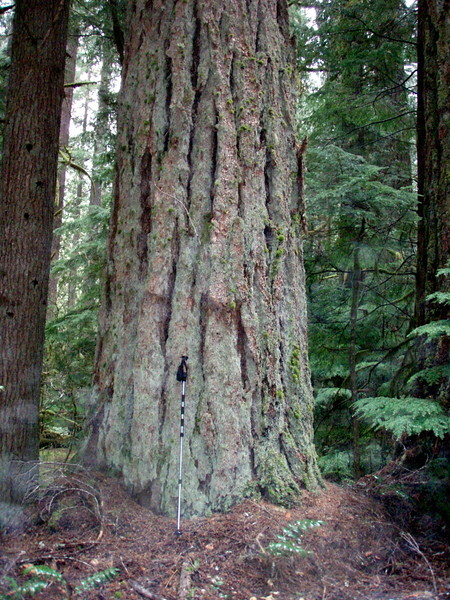 I will definitely be returning to Big Bottom, and I will find this big cedar. That will be an adventure for another day. 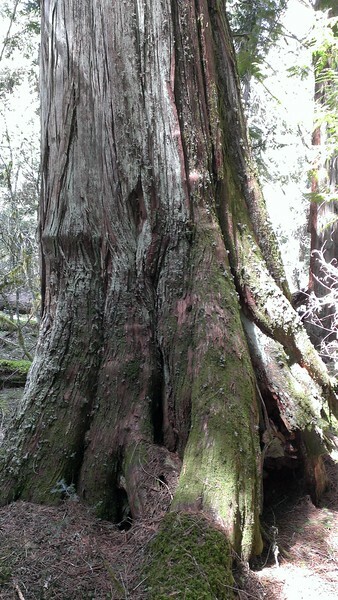 Note: After I did this hike, I conferred with someone else who has been to see this big cedar. 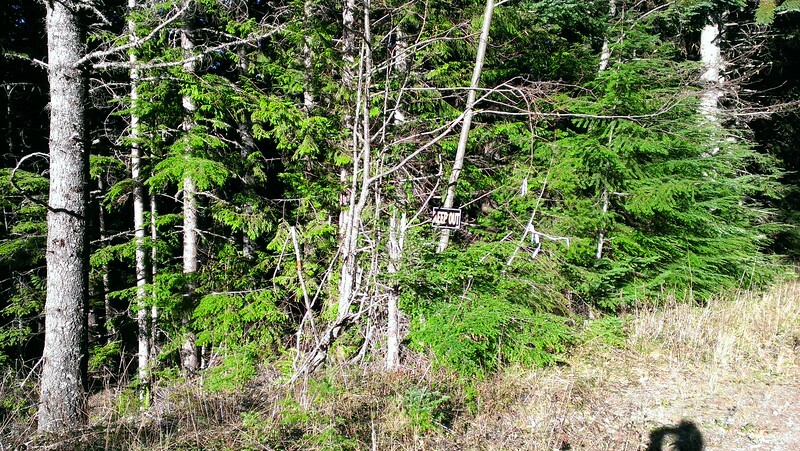 He gave me the GPS coordinates of where the tree is supposed to be located. I put that in the gps track for this trip so I could see how close we got. 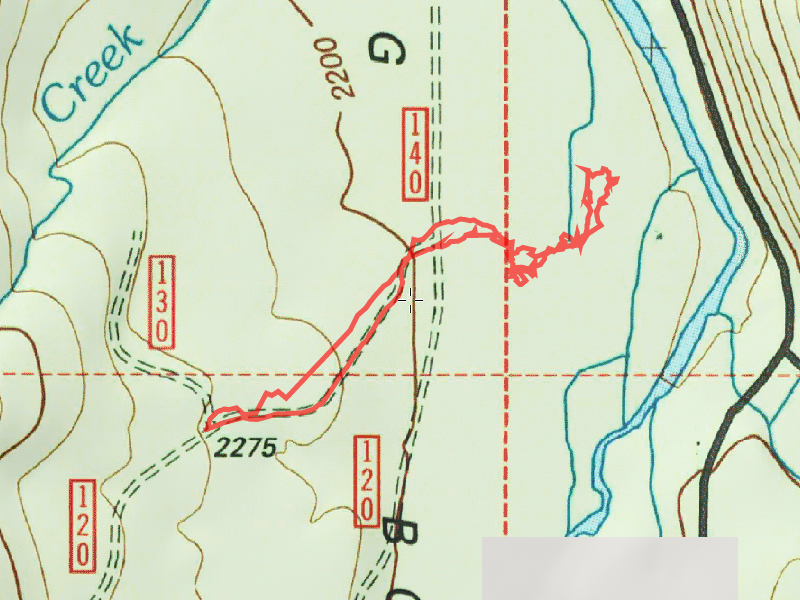 Based on his description, it is about where I was thinking it was – you can see the route we took to the east, just west of where that GPS waypoint is. 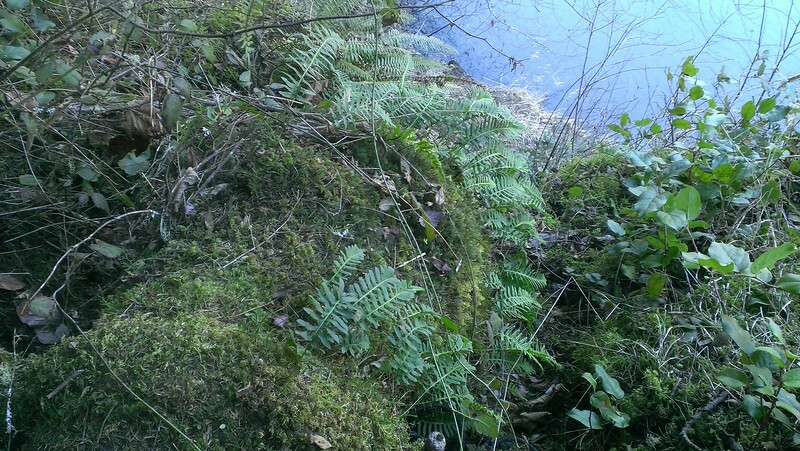 Although it will be difficult to get over there due to all the undergrowth, I look forward to returning. 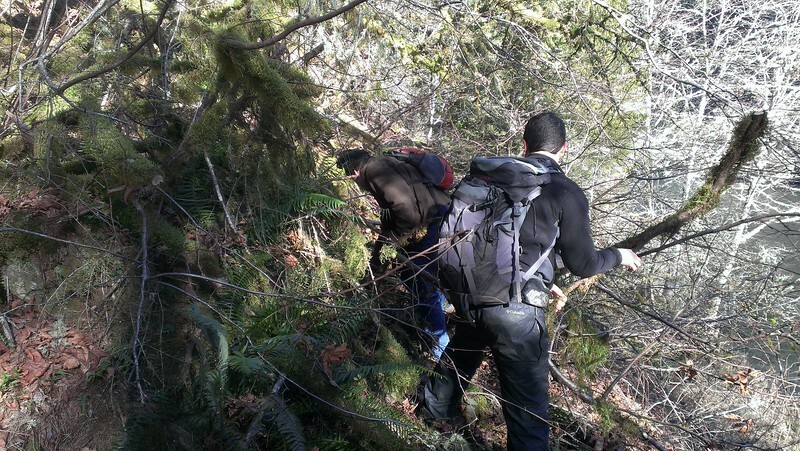 This was a hike I had originally heard about on the Portland Hikers website. 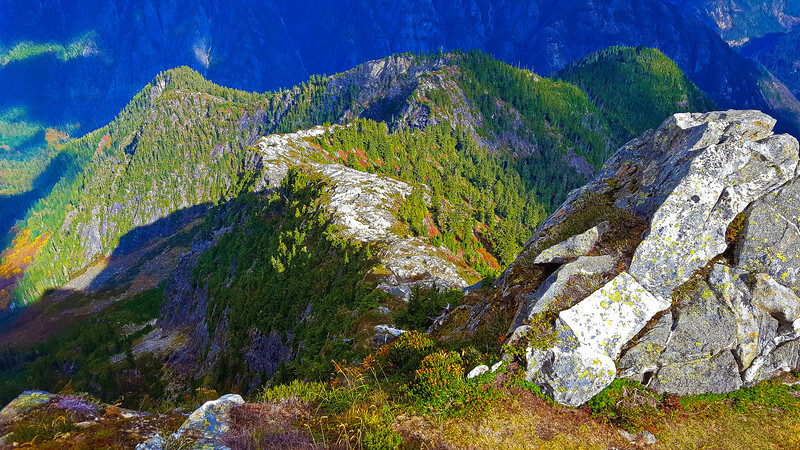 It combines two of my interests – hiking and history. 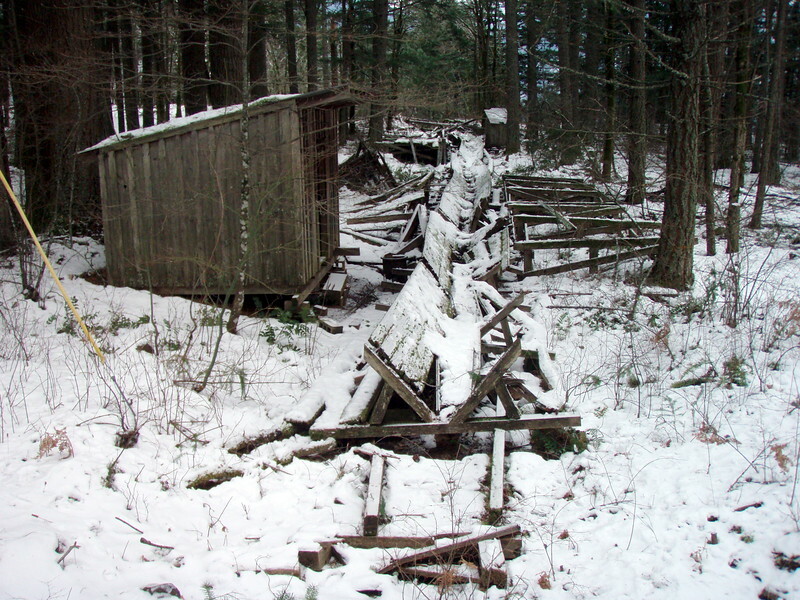 This is an old abandoned log flume that was used from about 1913 all the way until 1986 when it was shut down. As far as I could tell, it was the last commercial log flume operating in the United States. 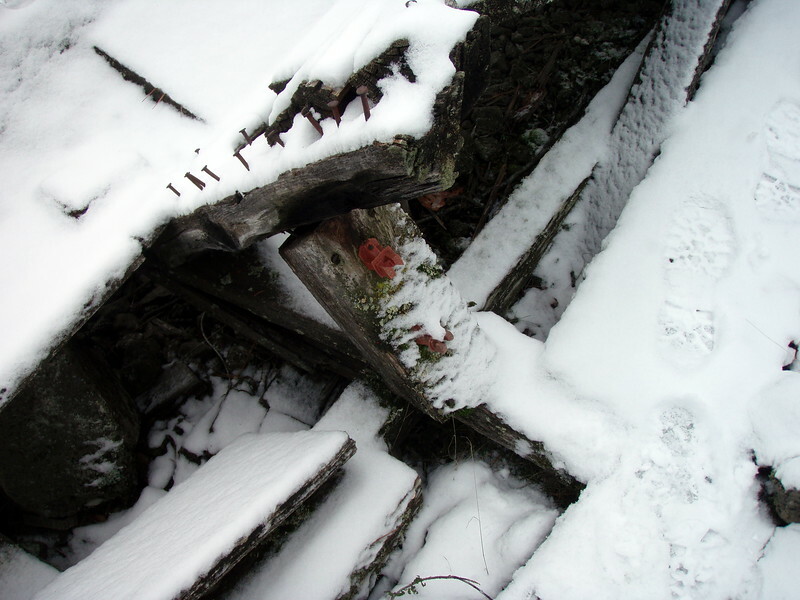 Parts of the flume are almost 100 years old now! 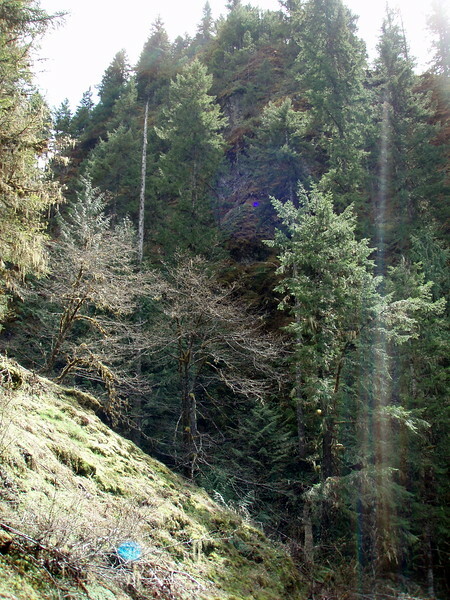 It was used to send partially cut wood (called “cants”) from the upper mill in Willard, Washington, down to the lower finishing mill at Hood, Washington. This mill was where the lumber was milled to finish dimensions and then shipped out via rail or by ship. 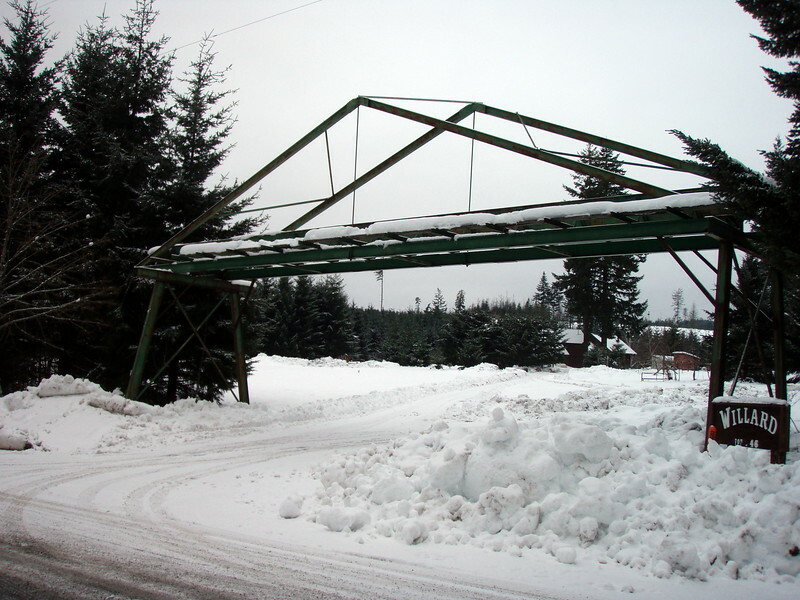 The flume was built because it was much cheaper to send it down the hill this way than to truck it 13 miles via narrow, windy roads. 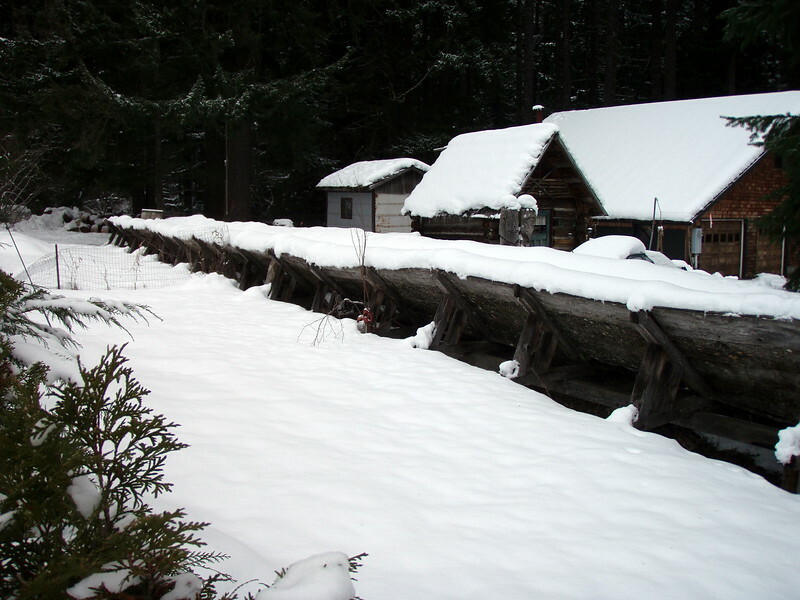 It ran 120,000 – 150,000 board feet of timber down the flume each day (enough to build something like 12 houses). 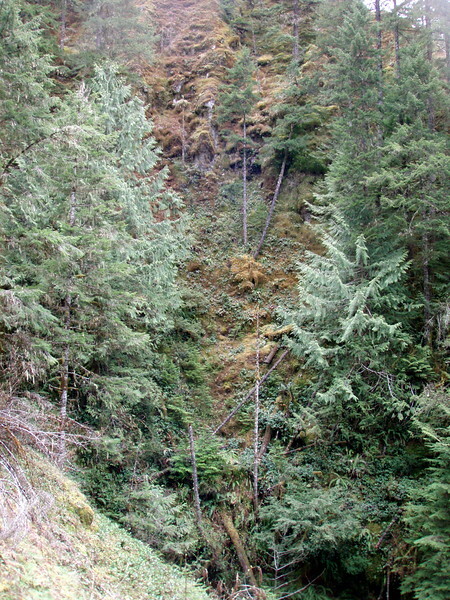 The flume was about 9 miles long and dropped 1000 feet to the lower mill. It took about an hour to make the trip, so the water ran about 9 miles per hour in the flume. 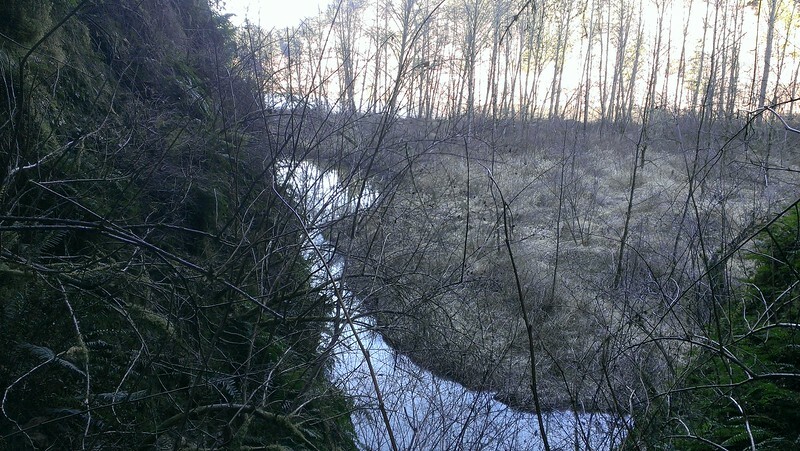 The water was taken from the Little White Salmon river and was emptied into the Columbia river after it exited the flume. 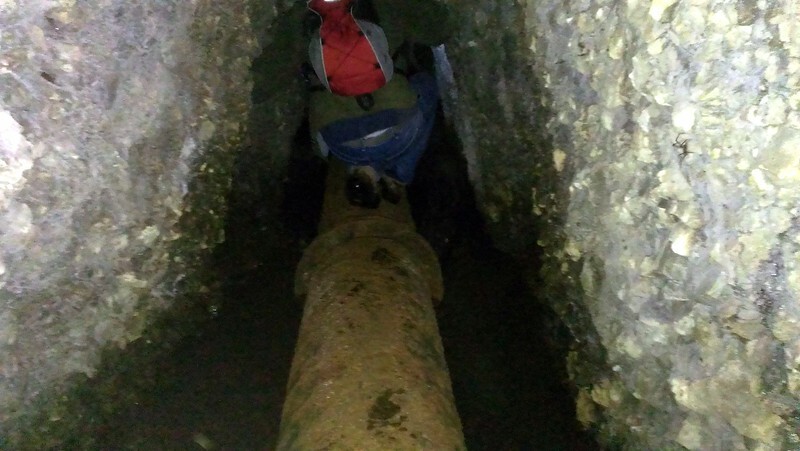 There was a 5 man team that was responsible for maintaining the flume. 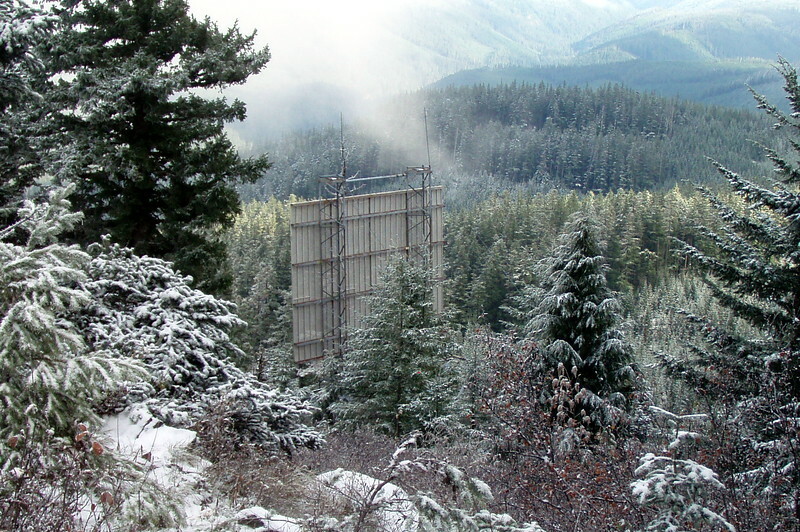 Each section of flume was about 16 feet long and lasted 15 to 20 years, after which it had to be replaced. One of the interesting things I found was the “alarm” system that the flume had. It had wires on the downhill side of the flume (from the Chenoweth road crossing down to the Hood mill) and if one of those wires were cut, the flume would automatically shut down and divert all its water to Drano lake. There was concern that if there were a leak on the side of the hill, it could cause rocks or trees to come tumbling down the hill onto the trains and cars below. The alarm system and bypass mechanism was near the Chenoweth road crossing. OK, enough of the facts and figures of the flume itself. On to the description of the trip. 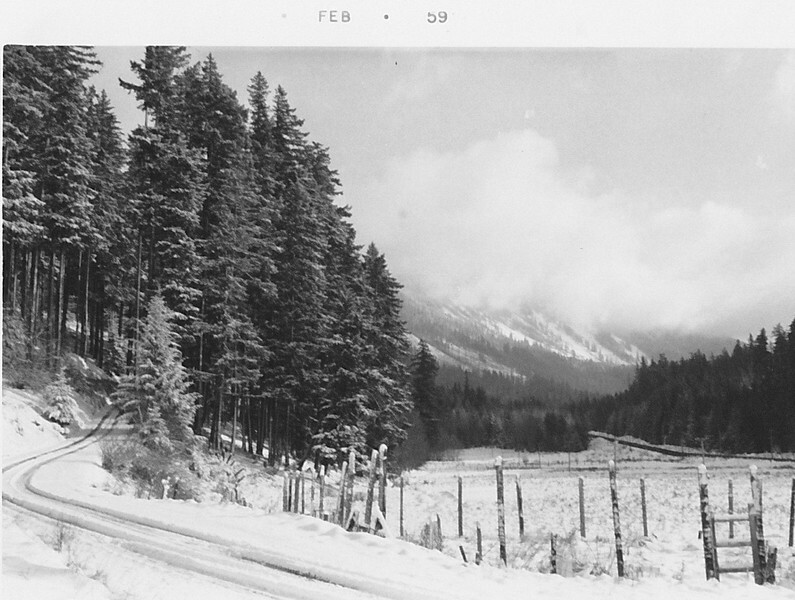 We started out early on New Years Day – it was cold and the roads were icy in spots. No matter, it was a good day to go exploring – a great way to start a new year. We got to Hood River and made the trip over the toll bridge (it was $1 each way). We stopped in the small town of Bingen to look at a steel portion of the flume that used to go over a roadway. 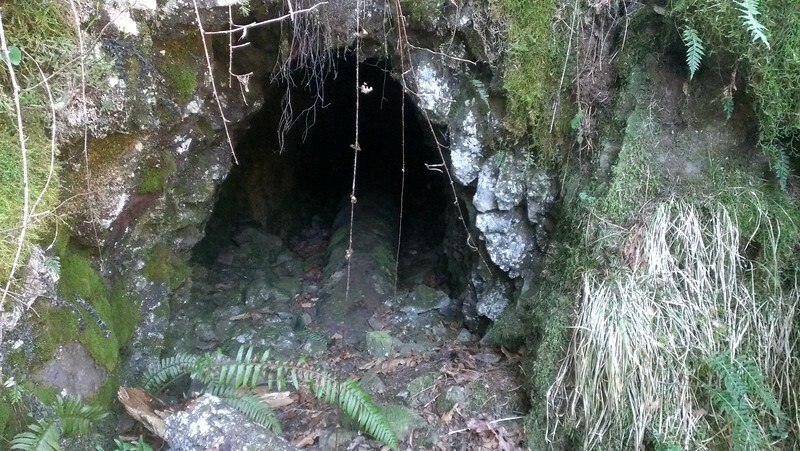 It had some history of the flume and some photos that were interesting to see. After this stop, we were ready to go looking for what was left of the flume. We headed west on Highway 14 until just before tunnel 5 (I think that is the right tunnel-maybe it was tunnel 6). Anyway, there was a nice place to pull off the road. We headed back up the road a bit to get around the cliff. Then we headed up. 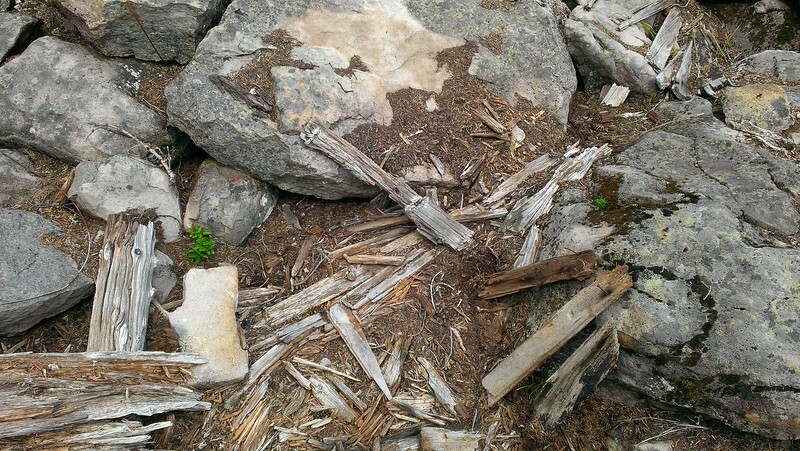 In less than 100 feet up, we found remnants of the flume. 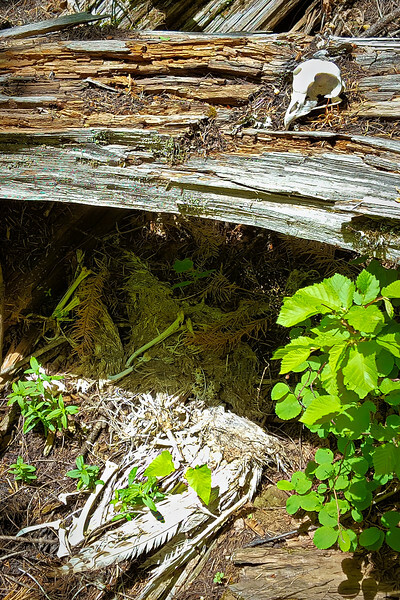 There was LOTS of poison oak all over the place, but since it was cold, and the plants were all in hibernation for the winter, I think we were OK. 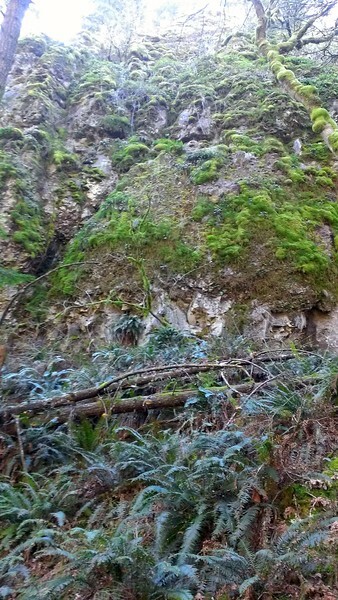 It was interesting to walk down the flume line and see how far it has degraded in a short time. 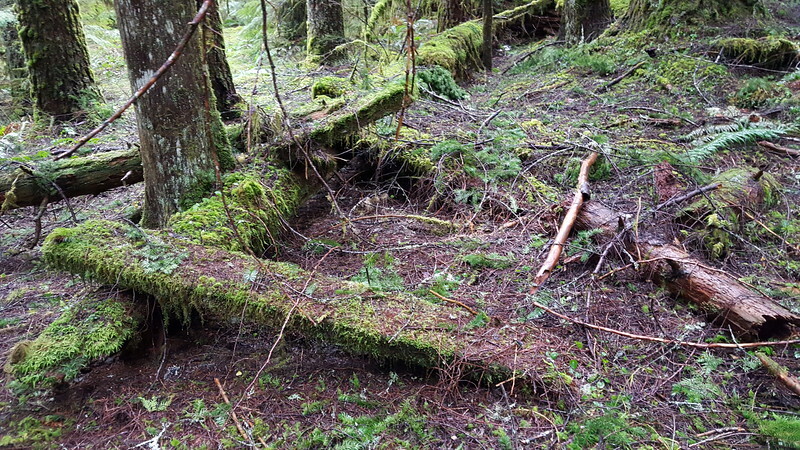 We kept driving down Willard Road (it kind of makes a U Turn) looking for more remains of flume. 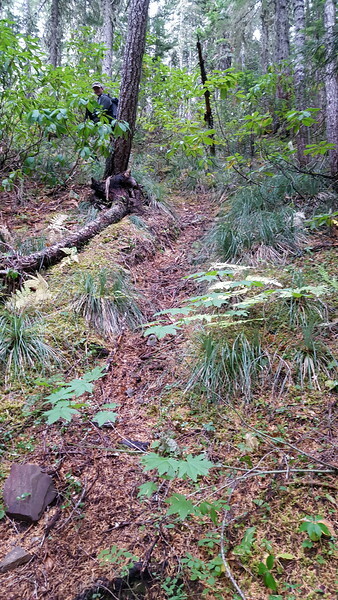 The flume was supposed to parallel the road, but we could see no evidence of it. We then proceeded to what I found to be the most interesting part of the trip. We went down Chenoweth road, almost to the end. 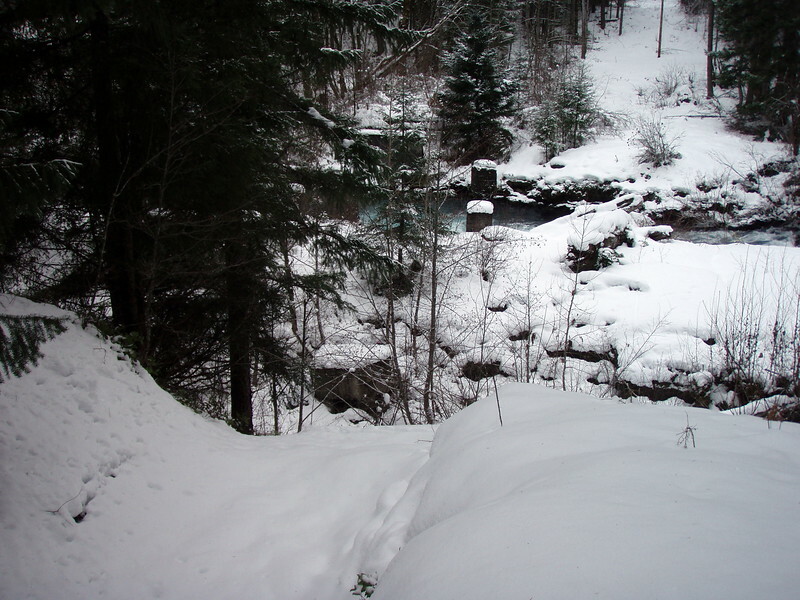 At this point, the flume went under the road – there was quite a bit of flume left in this area. 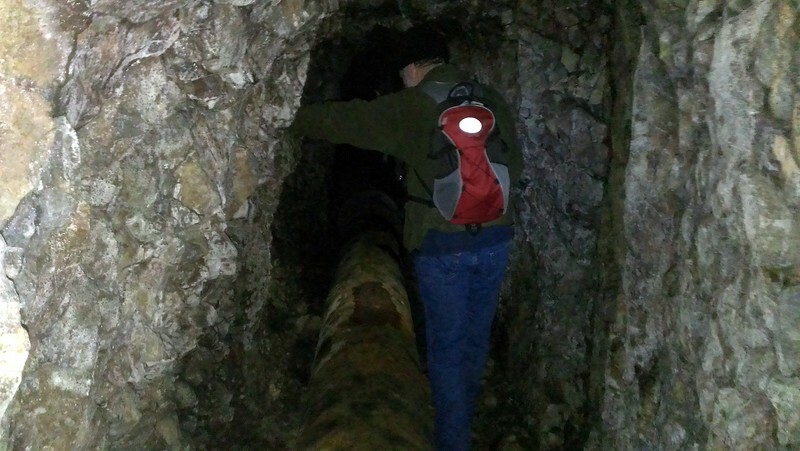 Seeing no “No Trespassing” signs, we went and explored the pieces of old Flume. On one side of the road was pieces of flume, some elevated as much as 8 feet or so. Some pieces were pretty much ruined, but some were in relatively good shape. On the other side of the road was the interesting piece. This was the place where the “alarm” worked. There was a small building next to a trap door. When the alarm was triggered, the motor in the building opened the trap door and all the water ended up going down to Drano Lake rather than continuing down the flume. 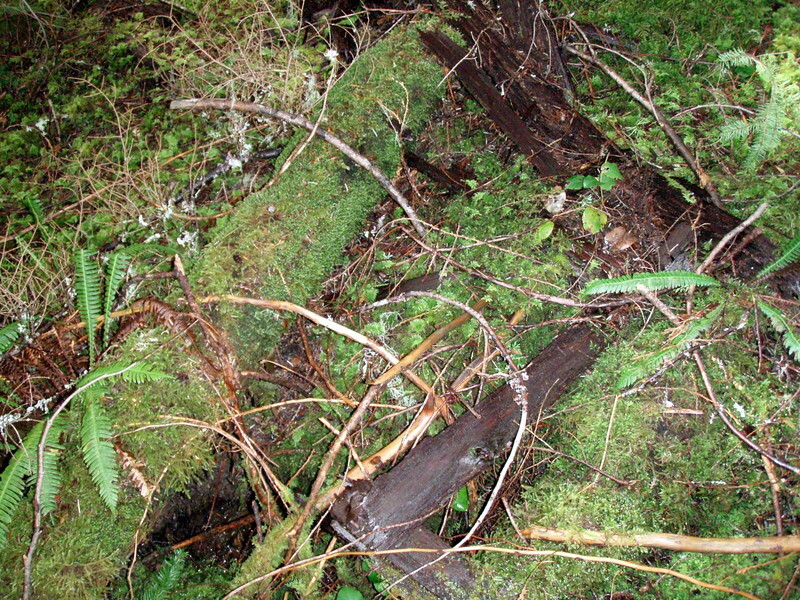 There was some old “decking” which looked like it could have been used for a variety of things (removing jammed up logs if the alarms triggers, sending replacement lumber down the line for flume repairs, etc). As we got back to the car, there was a nice gentlemen on a tractor who informed us that we were now on a nature preserve. We told him we were interested in looking at the remains of the flume and he told us stories of what it was like and how the “alarm” worked. It was great to hear stories from someone who had actually seen it work. Apparently after it use was discontinued in 1986, many (most?) sections of it were sold off – reclaimed. About the only sections that were not were sections that were either in inaccessible areas, or those on private property. 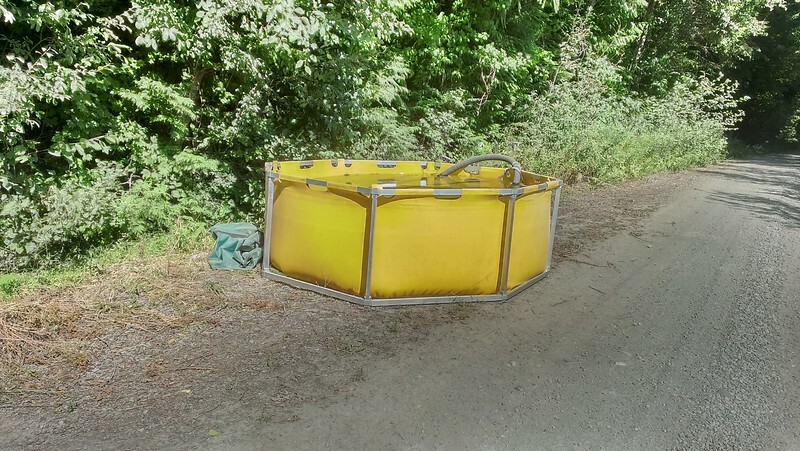 The area where the nature preserve is located is private property and the owners had opted to keep the flume in place. Thank goodness for that! 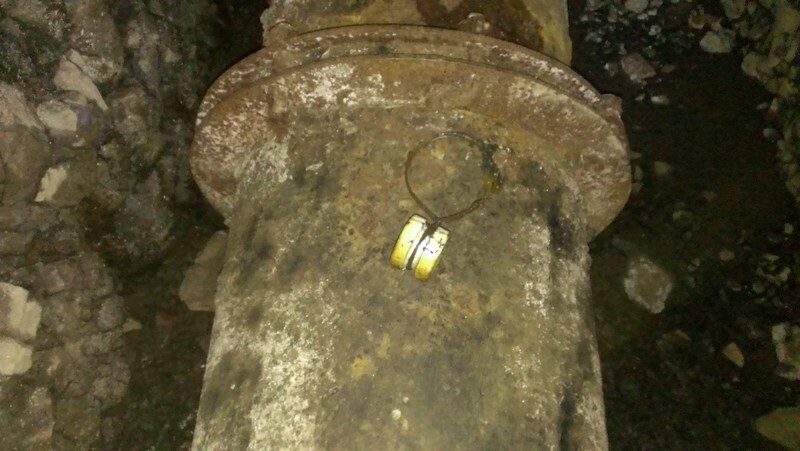 It is too important of a historical treasure to leave to rot! Even better, they are discussing preserving a section of the flume permanently so that people can see what it looked like. After talking with the nice gentleman (I never got his name, just that he was the caretaker of the preserve), we headed out, and back down to Bingen and then back home. While we didn’t do a lot of actual hiking, it was a great day out exploring this bit of NW history. 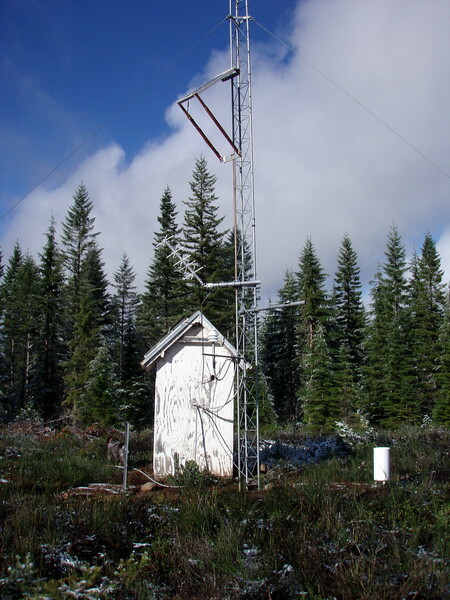 This was an end of the higher elevation year hike to try and find a couple of weather stations as well as hike to the top of Oak Grove Butte and also hike an old abandoned trail that was recently found. The goal for the day was just to have fun and hopefully stay out of the snow. I think those goals were achieved! 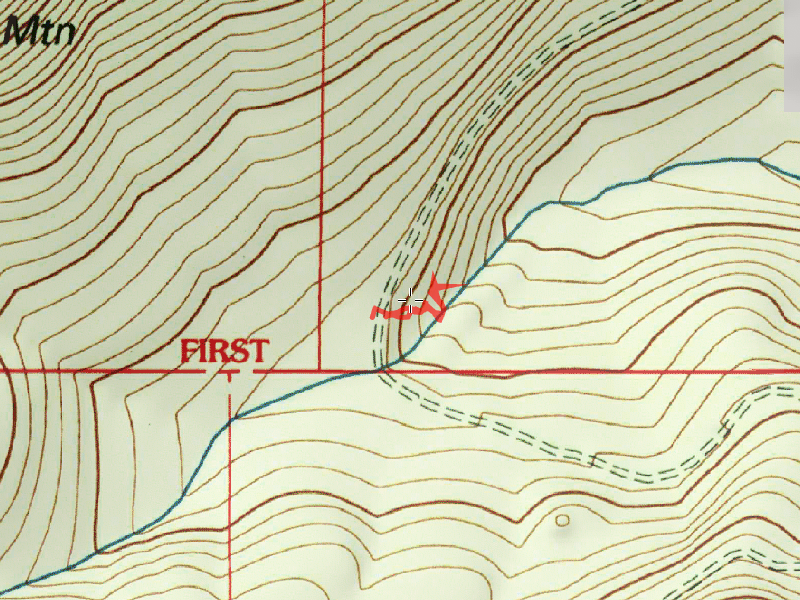 First off was trying to find the Peavine Ridge Snotel site. I had rough coordinates for it, but wasn’t sure exactly where it was. We drove up the road as far as possible, until it got too rough (even with a 4WD and high ground clearance) and narrow. 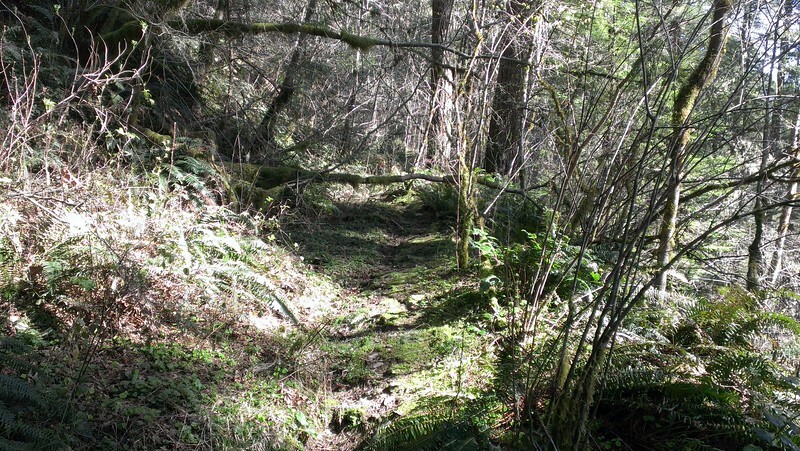 From there, we continued walking up the road until we found what looked like an old skid road to the south. We followed this “road” which led us directly to the snotel site. It was interesting to see in person. OOPS!! In our defense, we were very careful around the equipment…. We then went down to the “reflector” (not sure what else to call it) that is on the hillside. I think it is actually what is called a “Passive Repeater” wikipedia. Interesting thing was that the phone line had ice all over it. It is amazing it is still hanging after all these years. 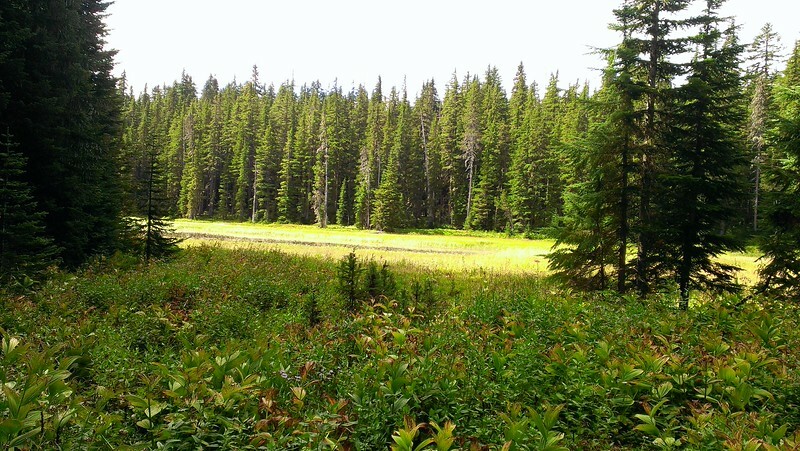 We got to the other end, which is near an old clearcut and a small, swampy lake. 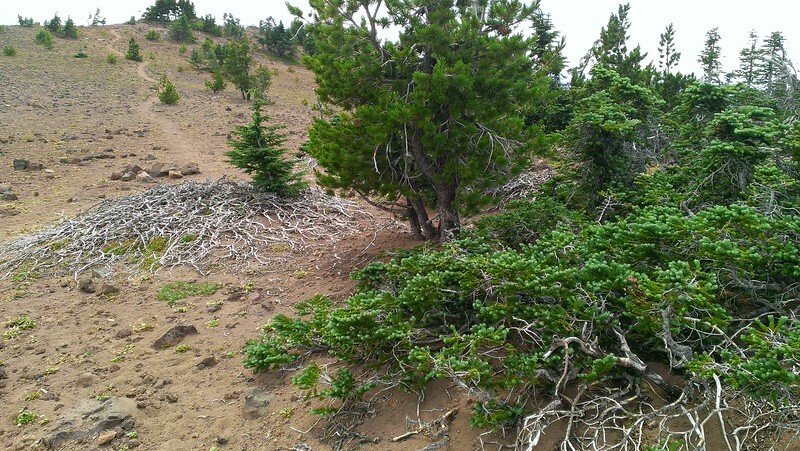 We attempted to find the trail from the ridge, but were unable to find anything definitive. After a bit of searching, we turned around and headed back to the truck. A little more cleanup on the way out, and we were back at the truck shortly before it got dark. We headed back and had our normal ritual of stopping at Fearless Brewing in Estacada for a beer and some dinner. A great day with some great friends exploring some great country!